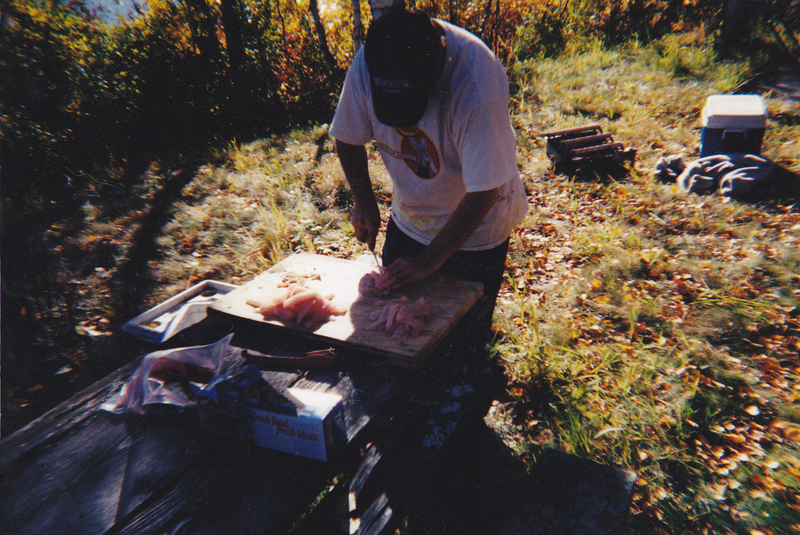 Fishing Up North | sausageheavenoutdoors Enjoy making homemade sausage, Tasty way's to BBQ, smoking meats and poultry. See how northern Minnesota was settled and the life early homesteader's lived their lives and more!! Not too many places i want to go for fishing other than Minnesota. Why would i anyway. It would take you more than your lifetime just to hit every lake and river that you could access. If you have ever been to the Arrowhead area of Minnesota you could easily think you were in the backwoods of Canada. Some of these lakes you can back in a boat and some you have to portage to with a canoe. I have fished this area since the early 60’s. I will share some information on some of these waters along with pictures of trips from long ago and through the present time . 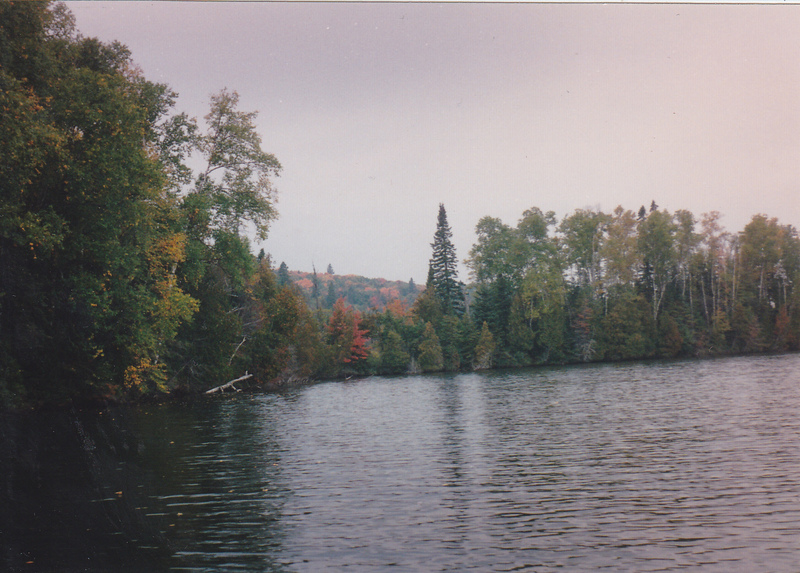 In the above pic, we were near the Gunflint trail on Mayhew Lake. This was in the late 70’s. In the pic from left to right is Mike, myself, Erick, Disco, and my brother Ed. I think my dad probably took the picture. Sure was windy and cold that day. This was the time i was swept away by swirling snow which we called a “snow witch”. If you ever saw swirling snow in a field, just think of one that looks like a mini tornado spout coming down the lake. I was in my small portable fish house and one of those crashed into the portable and sent me sailing for 100 feet or so. I was ok, even though i had a propane heater in the portable. The guy’s seen it hit the portable, and seen the whole thing while they were fishing in a more protected bay for rainbows. 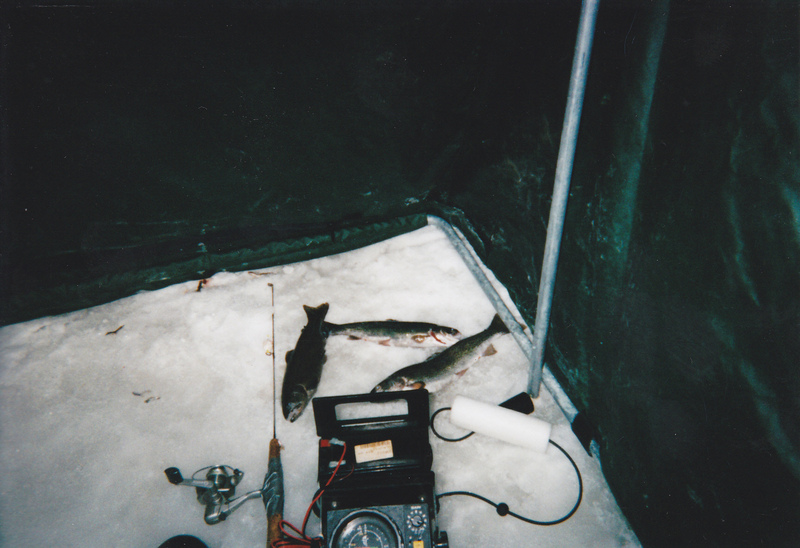 On the ice there in the pic you can see a mix of rainbows, few lakers, and some brook trout we got that day. 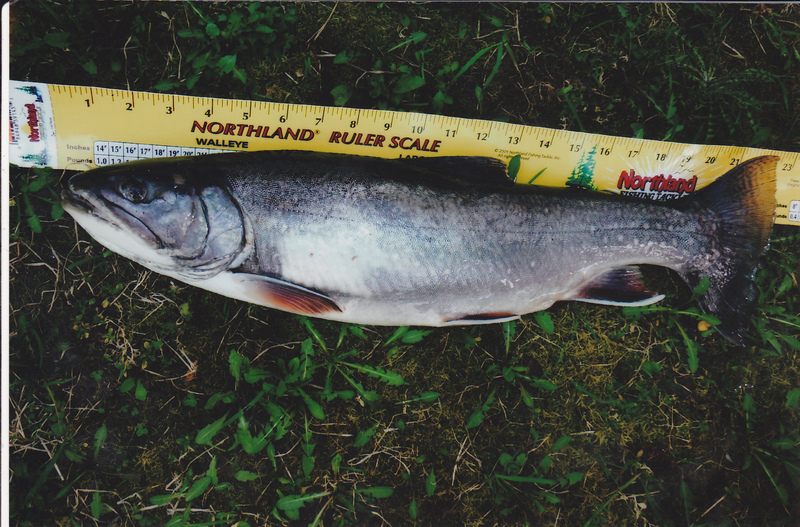 The brook trout we caught in Topper Lake. 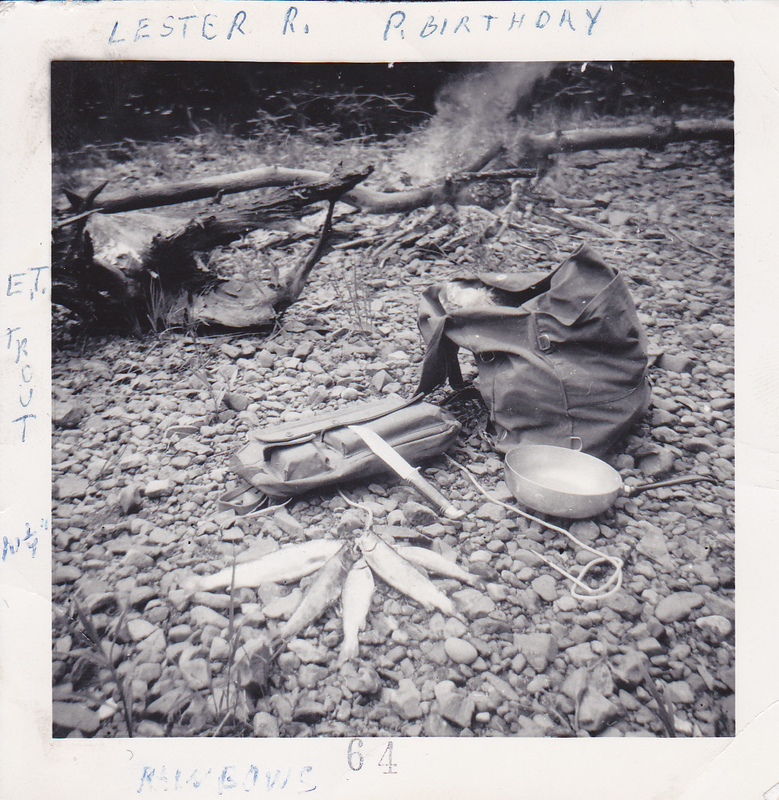 This pic was taken in 1964 on the banks of the upper Lester River near Duluth. 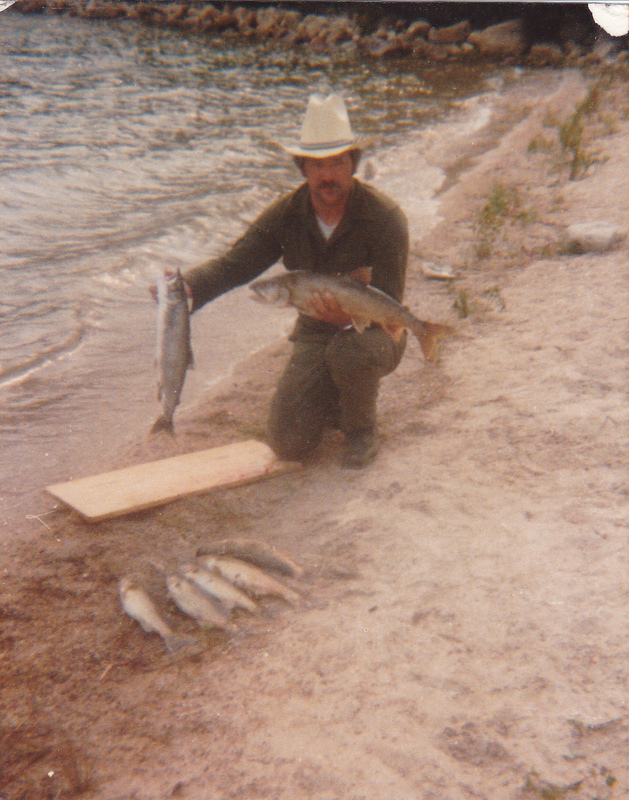 My brother and I fished for stream trout that day while walking the shores of the river. We built a fire as you can see in the background. 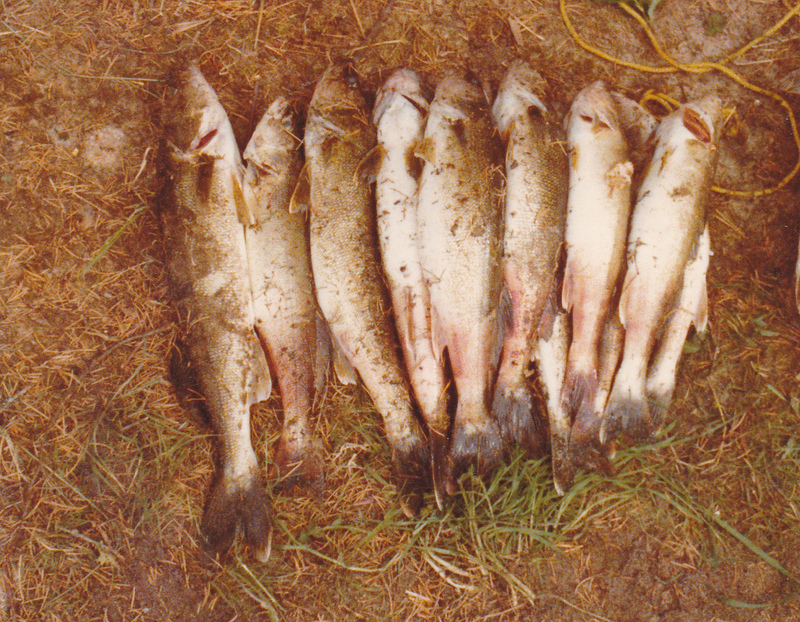 Brought along a military mess-kit and fried up some of these tasty trout right on the river bank. Probably ate everyone of those rainbows and browns. 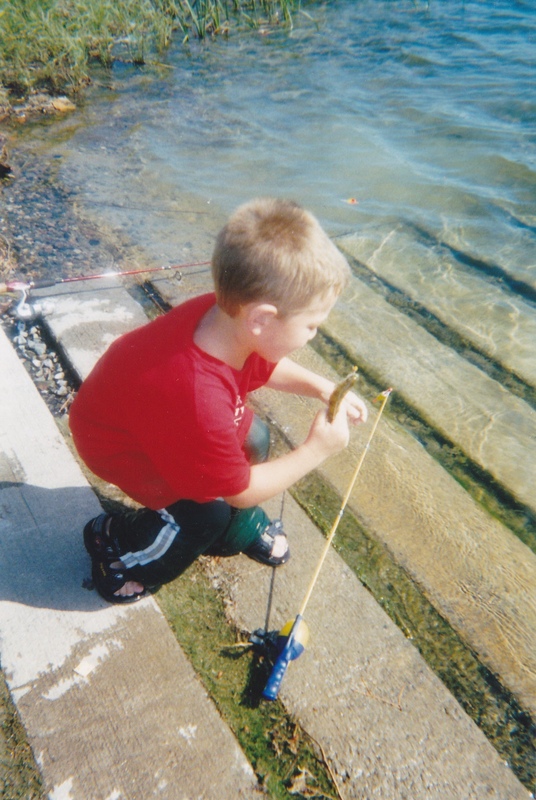 We normally used just used a plain hook, split shot, and a worm or crawler for bait. However at times the reliable Mepps spinner [size 0 or 1] gave us some luck as well. We had a small spoon with a single hook that worked the best. It was called a Russian Hook. Cant find those anymore. They worked fantastic for trout. 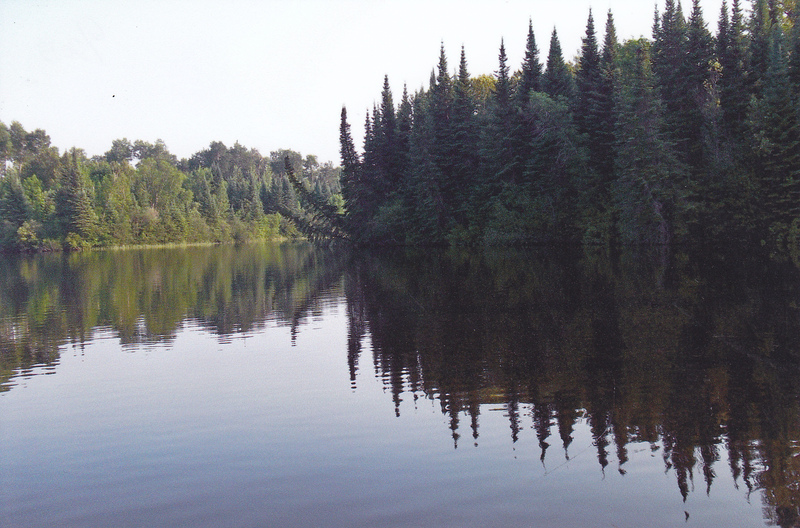 Island Lake near Duluth is one lake you have to check out. 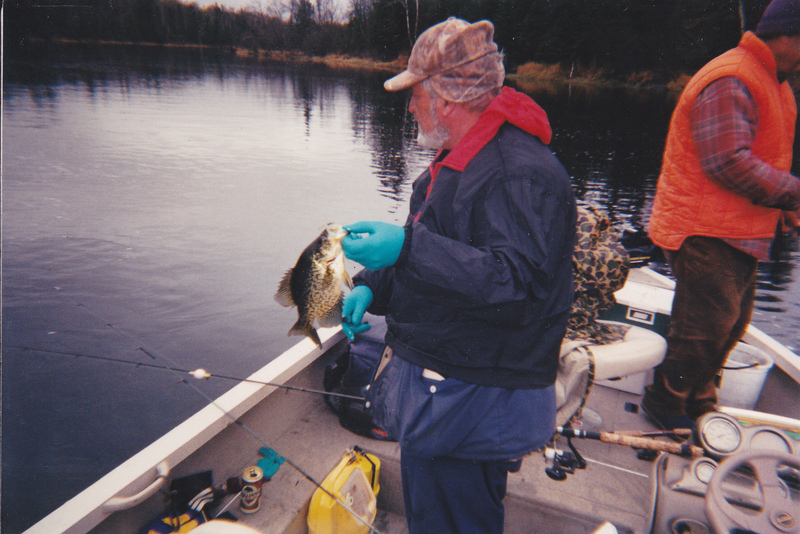 Here in this pic, my brother holds a nice crappie. 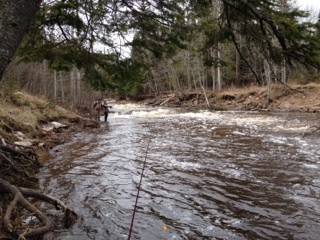 We are fishing where the Cloquet River enters the big lake. When the water is low you can only go as far as the first rapids. 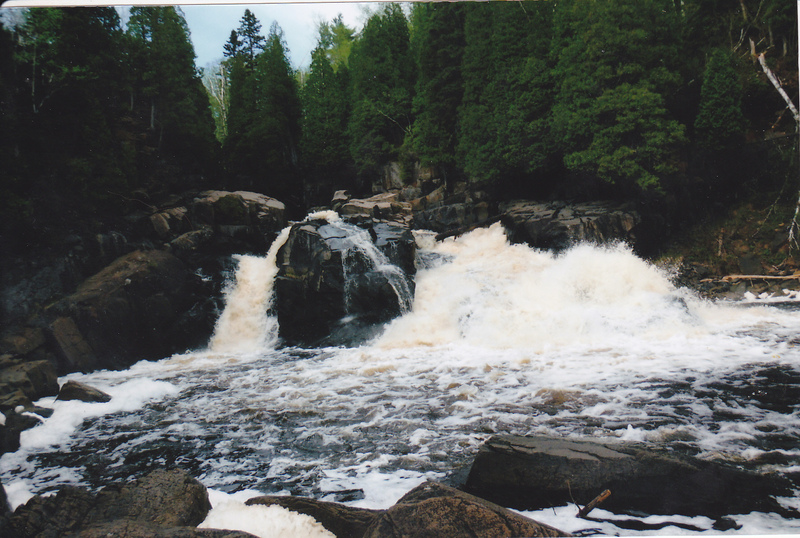 However when the water is high [mostly in the spring and early in the year] you can carefully go further about two blocks to the next set of rapids. At that point rapids enter a large pool where this nice slab was caught. Have to be careful for there are many large rocks and boulders in the area. Another nice walleye for my “secret” lake north of Duluth. This lake is only a little over 300 acres and does not get stocked by the DNR. It does have a boat landing but it is only a small gravel back-in access of the side of a gravel road. 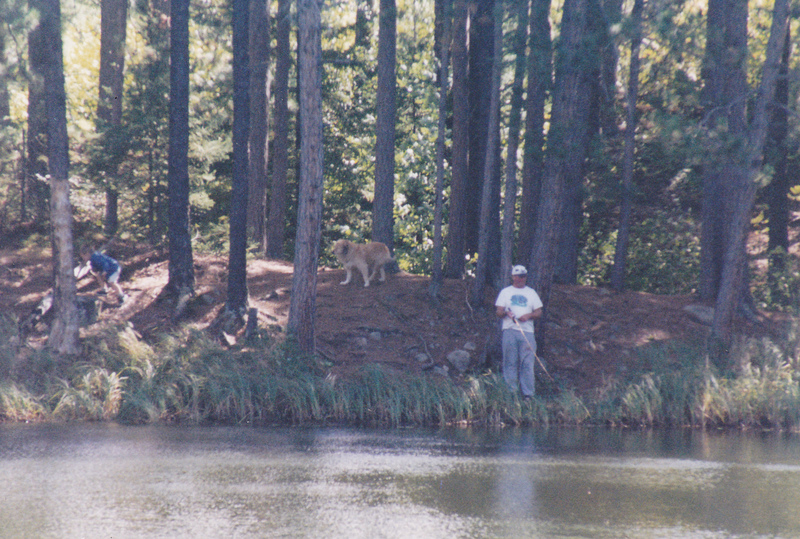 Most folks just drive by, for i have yet to see another angler while i was fishing there for more than 30 years. I have caught more walleye’s on this lake over 6 pounds than any other lake. All have been released. I do bring home some eater eye’s along with some very nice crappies. 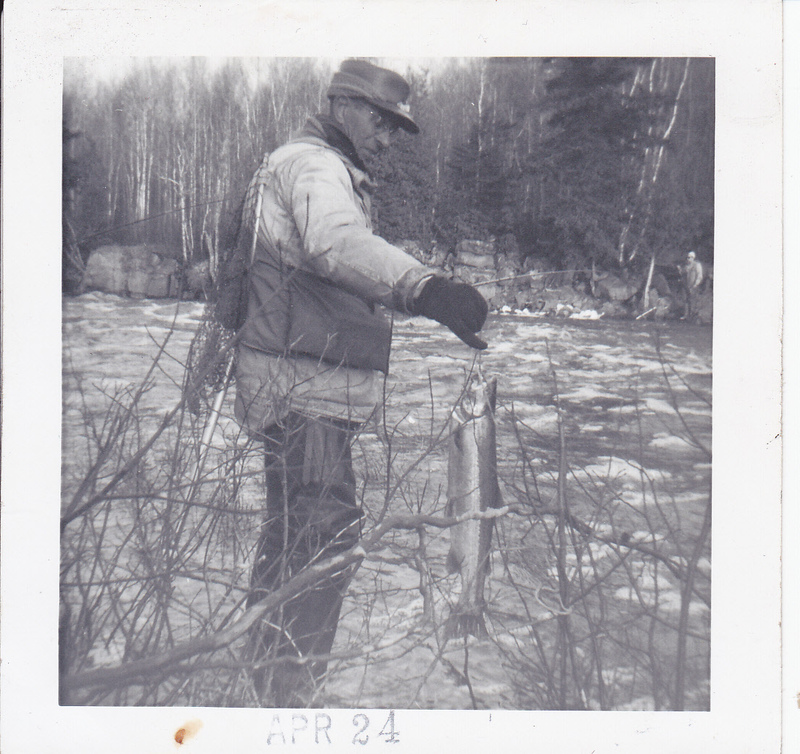 The good old days on the North Shore of Lake Superior when the mighty steelhead was the king of the rivers in the spring spawning run. 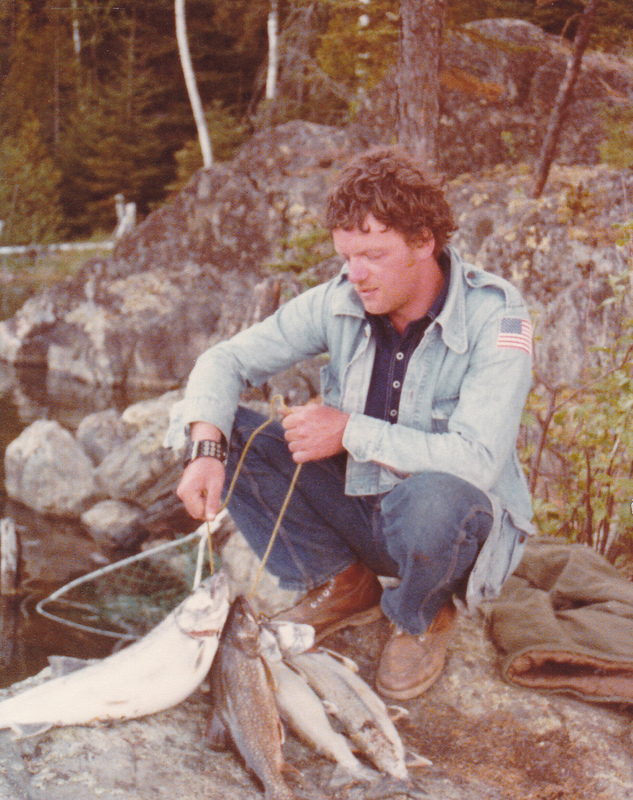 Here my brother holds some nice tasty steelhead back in the 70’s. We don’t have the spawning runs now as we had back then. While the steelhead are making a comeback [although a small one] the DNR is making Kamloops or “Loopers” as they are called a priority. 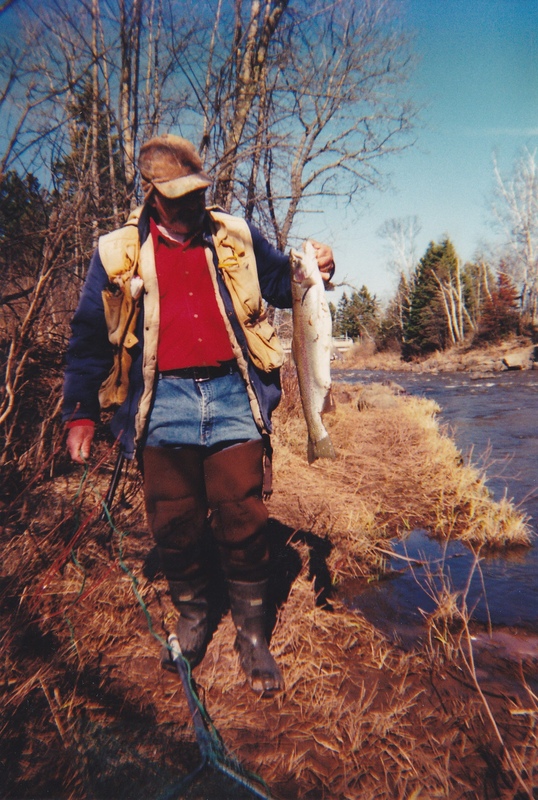 Loopers give anglers a great angling opportunity these day’s on the north shore streams. They are also a species of Rainbow Trout. 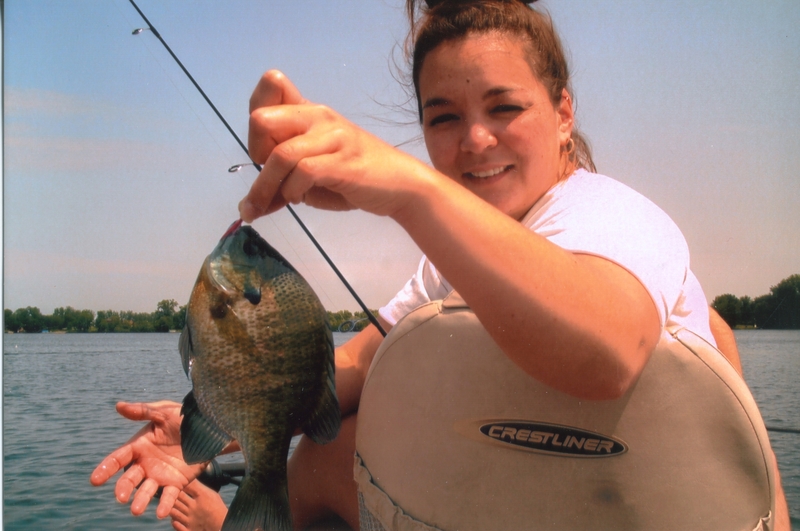 My daughter Kim, holding a very nice bluegill. We were fishing a local lake here. Nice warm day and plenty of action. 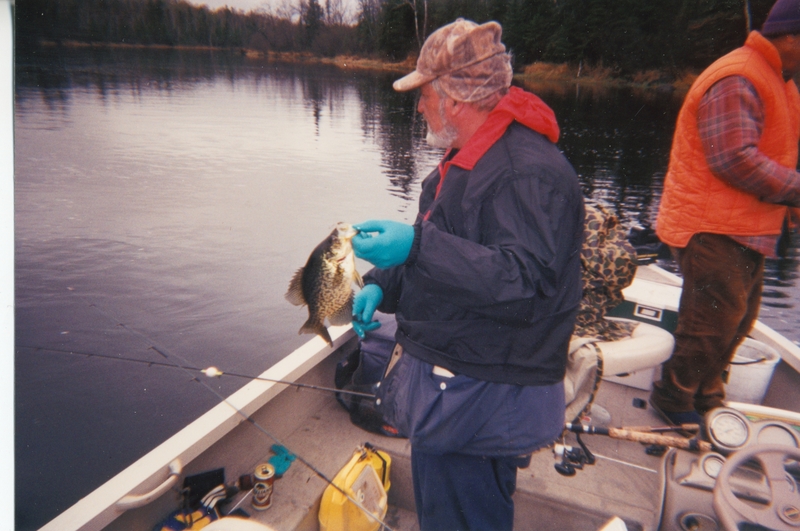 We were using small panfish presentations such as small tubes and Flu Flu Jigs. We topped them off with small Gulp grubs. I have used euro larva also and they worked great as well. However when the bite is on, Gulp grubs make a difference. I remember this day as if it was yesterday. 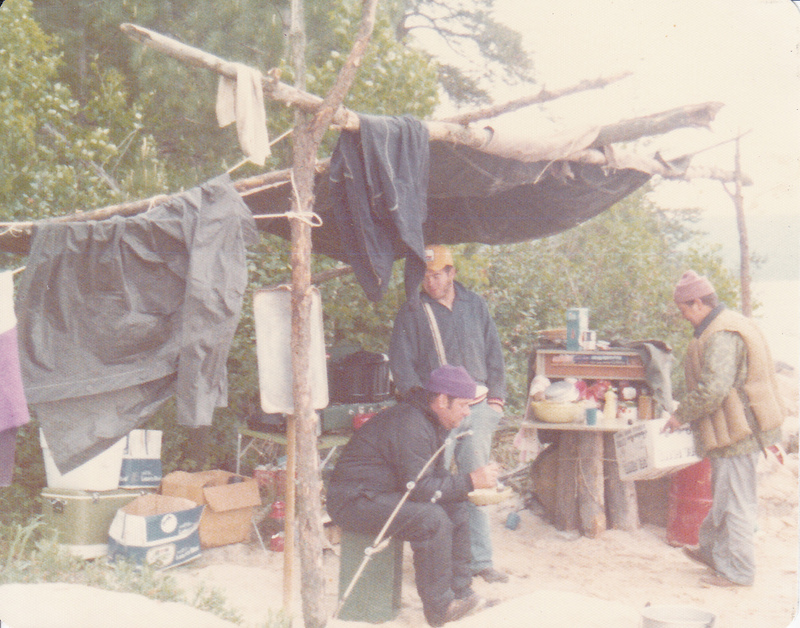 -28 below up on the Gunflint Trail, back in the 80’s, fishing on Topper Lake. It was a good hike from Mayhew Lake which we also fished. The snow was deep and so was the ice. We drilled with a hand auger, and had to get on our knees to pop the blade through the bottom of the hole. 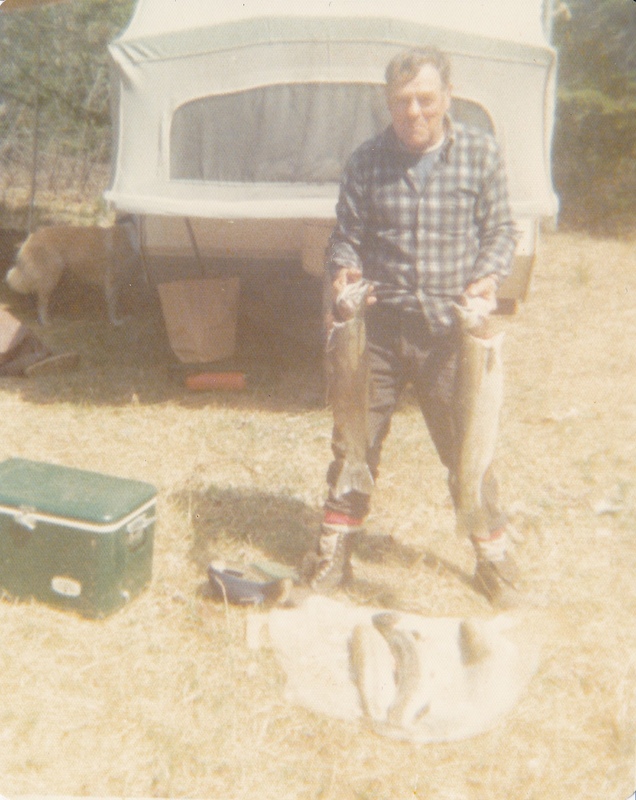 I caught 5 brook trout that day on preserved minnows and a small panfish jig. It was only 3 feet deep under the ice. 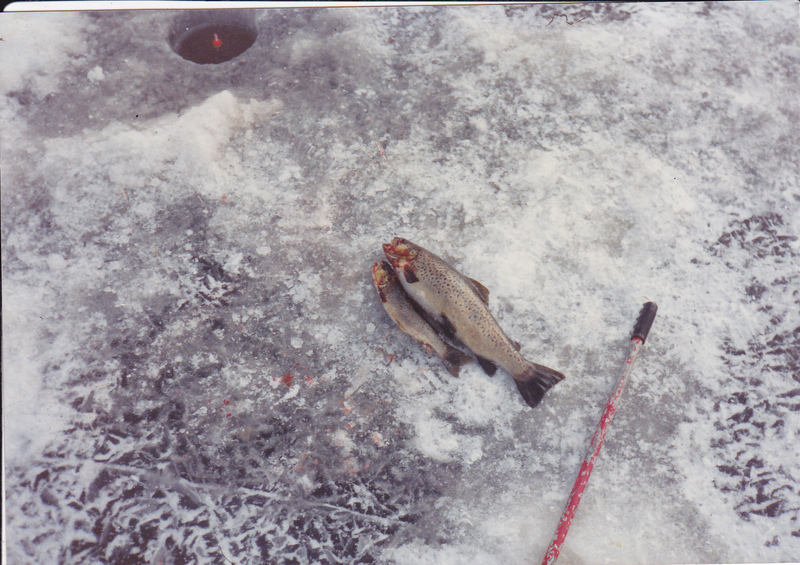 I had my bait just a foot under the ice, twitching the bait in hopes of a hit. The two “I’m holding were the biggest of the day. The largest of the two I had mounted and is still my personal best to date. 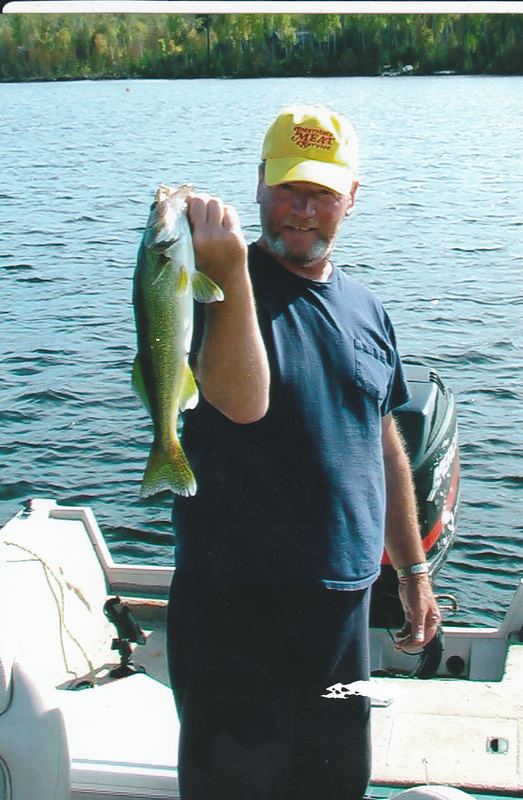 A nice eater walleye from Hungry Jack Lake on the Gunflint Trail. Beth and I stayed at Hungry Jack Lodge a few years ago in the fall of the year. Had a great time but could have left the boat at home. We caught all the walleye’s we needed right off the dock by our cabin. Just leeches under a slip bobber was all that was needed. The water in the lake is very clear, so early morning and late afternoon was the best time. 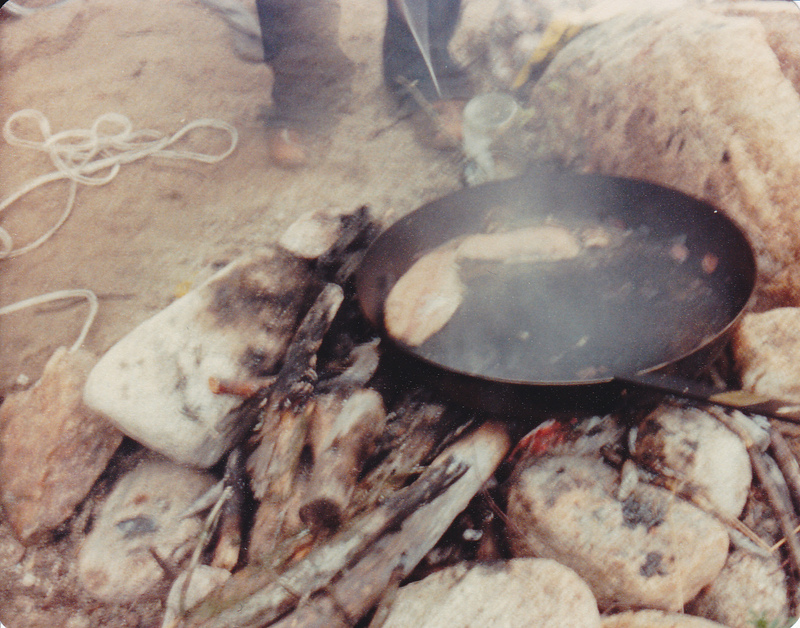 We had walleye’s for breakfast every morning. 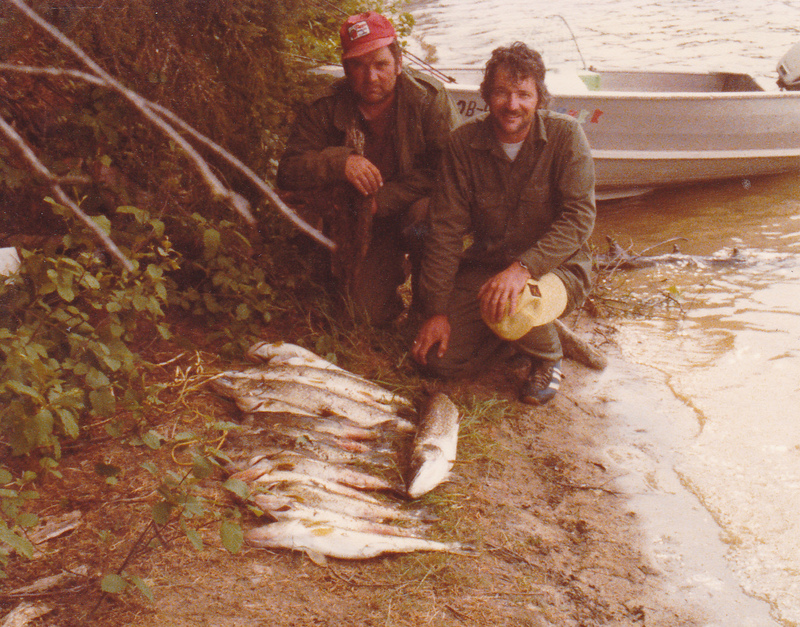 My dad and my brother at a remote lake with cleaned walleye’s and northerns hanging on the oar of our boat. We dragged the boat and motor to this lake which was about a half a mile away from the main lake. Camped there for a few nights and had some of the best fishing ever. 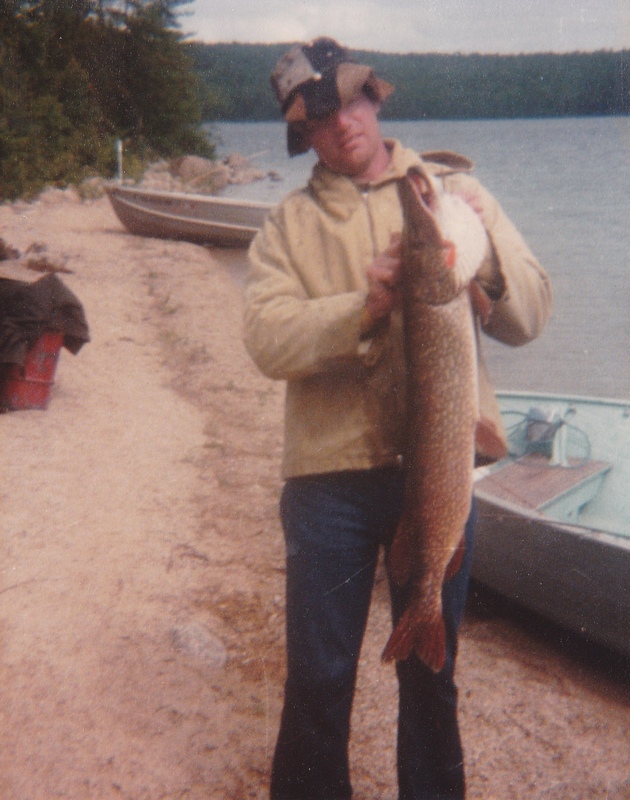 Big Pike from White Otter Lake in Canada. Fished this lake for over ten years in a row. It was hard to get into and the same getting out to the main road. A four wheel drive is a must [a tank would have been better]. This picture was from the late 70’s. I heard it’s a lot easier to get into this lake now. My personal best pike!! 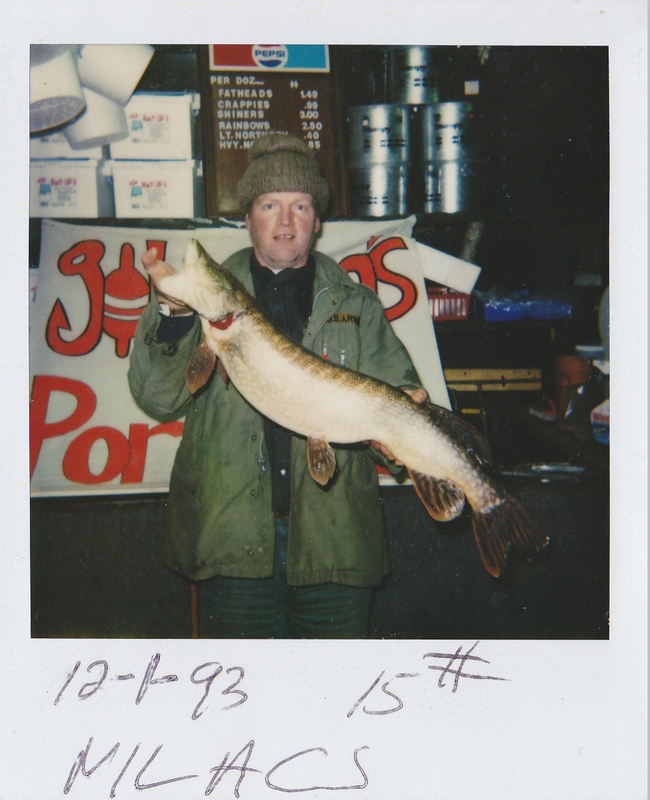 23 pounds and caught in Cove Bay, Mille Lacs. Didn’t catch it on a big sucker under a tip up [which we had out] but on a crappie minnow and panfish jig. 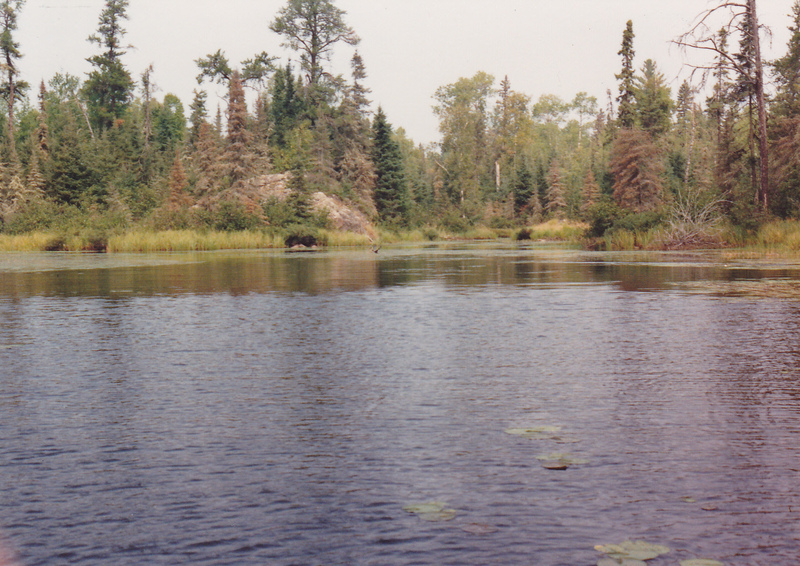 I was fishing “Alligator Ally” on Cove Bay for pike but a old timer told me that there were some big slabs there as well. Well no slabs but we did get pike that day. Couple of 5 and 6 pounders, one 11 pounder, and this big girl. Mounted this one in the late 80’s. Nice 4 pound brown trout out of Grindstone Lake. Caught this one on a tip up with a fat shiner. I set the tip up in 6 feet of water going after pike but I’ll take the brown any day. 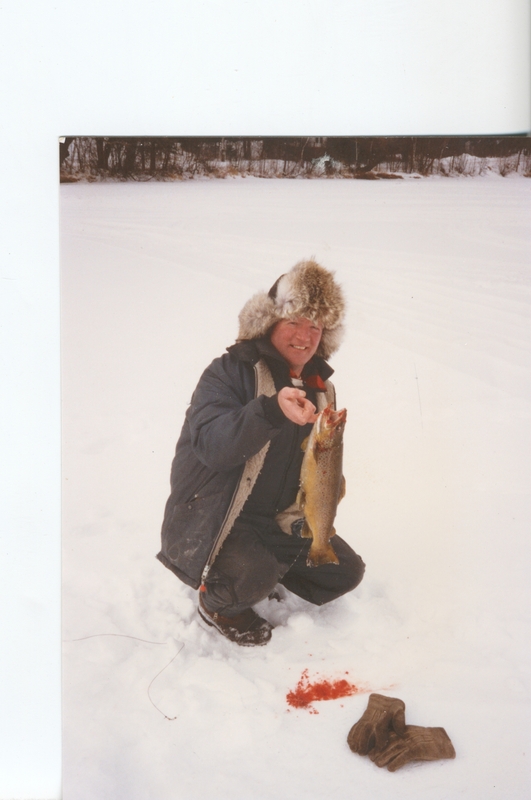 Most of the bigger brown’s I have caught in Grindstone on hard water were shallow and caught on tip up’s. Not every day you get into some 14 inch slab crappies. This was the day. I was out with my brother in late September on Wolf Lake north of Duluth. It was a cold day with sleet and hail at times. The bite was slow but we caught some crappies and all were around 14 inches. 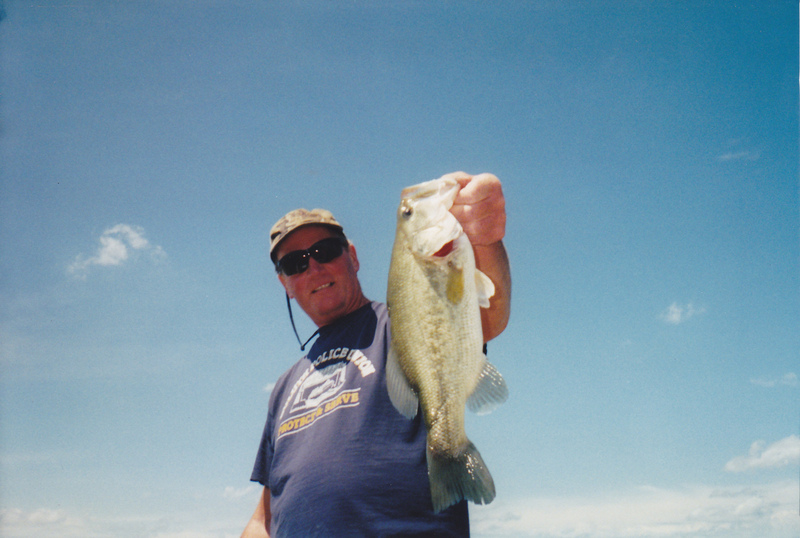 White jigs tipped with a minnow did the trick. Bearhead State Park near Ely has to be my favorite campground. Great place for the family and plenty of fish to be caught. 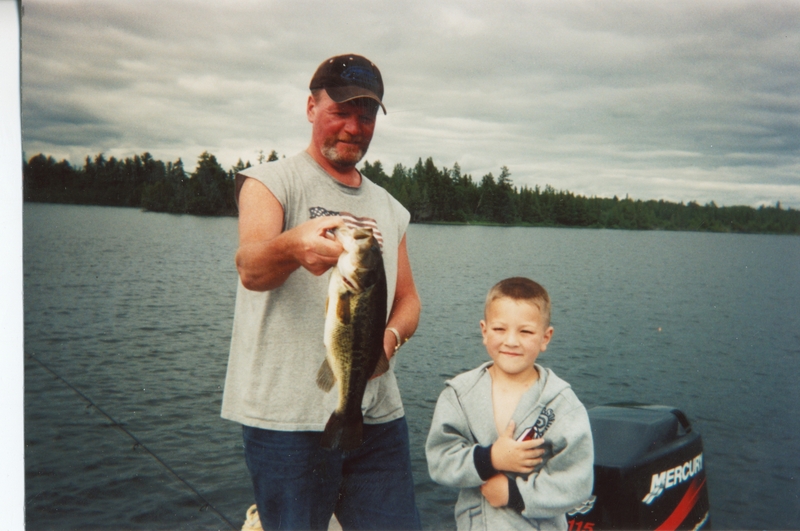 We have our own “secret” spot for walleye’s but once in awhile run into big bass like the one my grandson caught. Great way to travel on the ice. 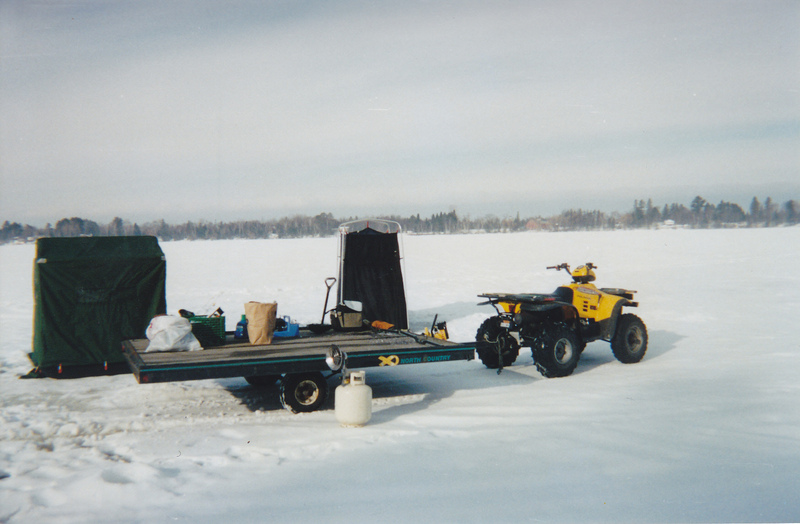 I haul my 4 wheeler on the trailer on the way up to the lake and then the wheeler hauls me and all my stuff [and my friends] around on the lake. 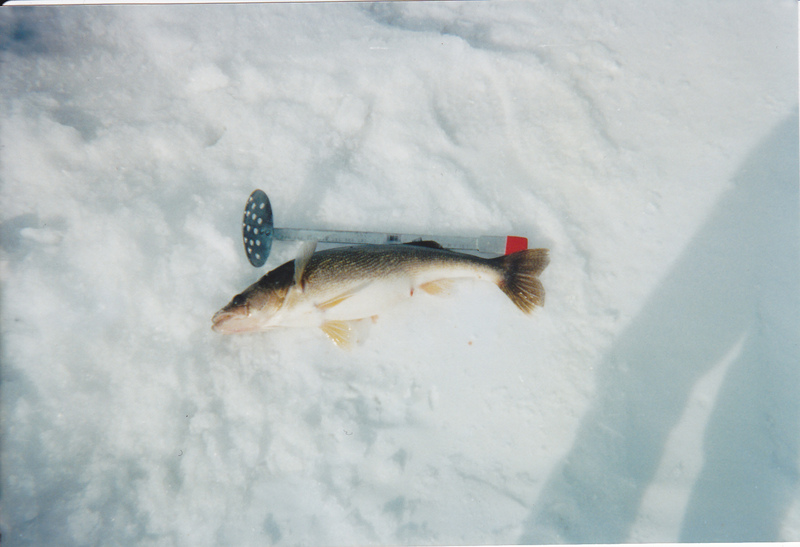 If the walleye is bigger than your ice scoop, well then it should go back to produce more fish for all of us like this one did. 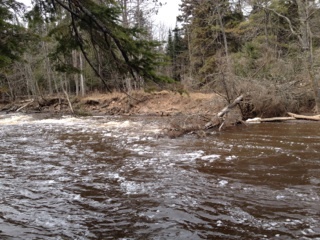 This is as far as you can go by boat on the Cloquet River flowing into Island Lake near Duluth. This was in May after the opener and the water was high enough to let me and my friends motor up to the big pool where the rapids enter. We caught some walleye’s and crappies here. Inside my portable with three rainbows iced. 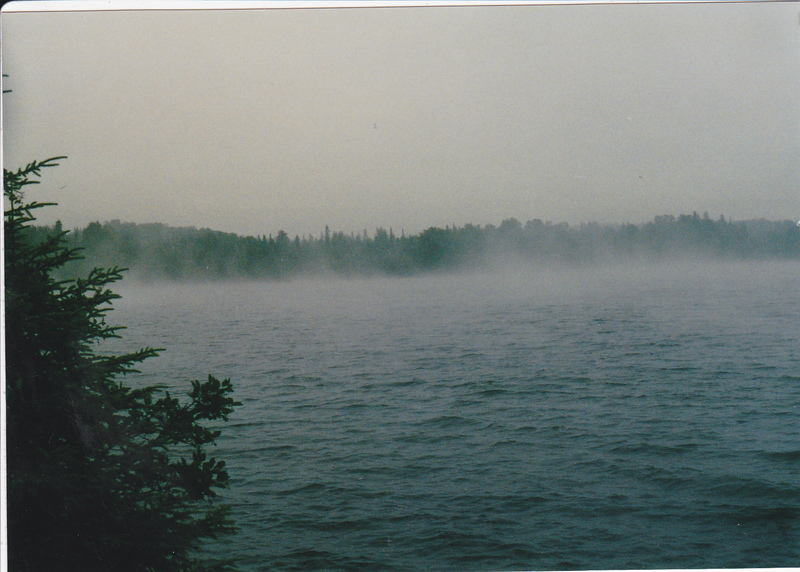 This was on Grindstone Lake near Sandstone Mn. 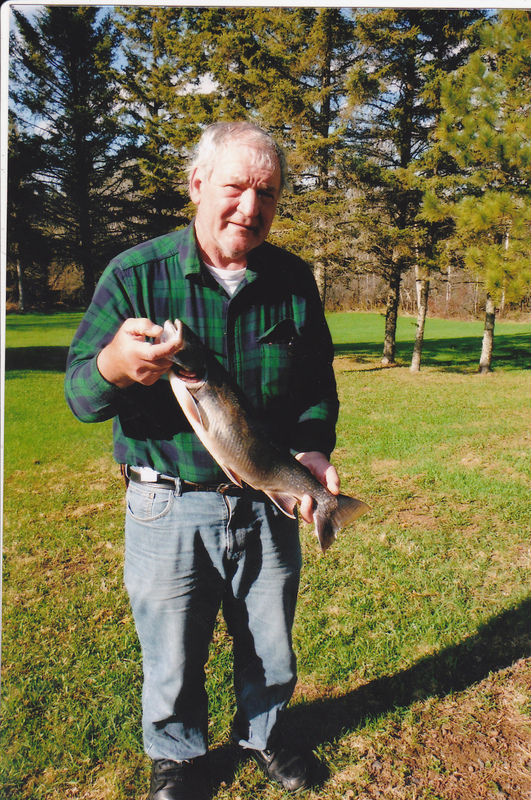 The lake has rainbow, brown, and lake trout which are stocked anualy by the DNR. Caught these trout on a small spoon with a minnow head attached. I was in about 8 feet of water. 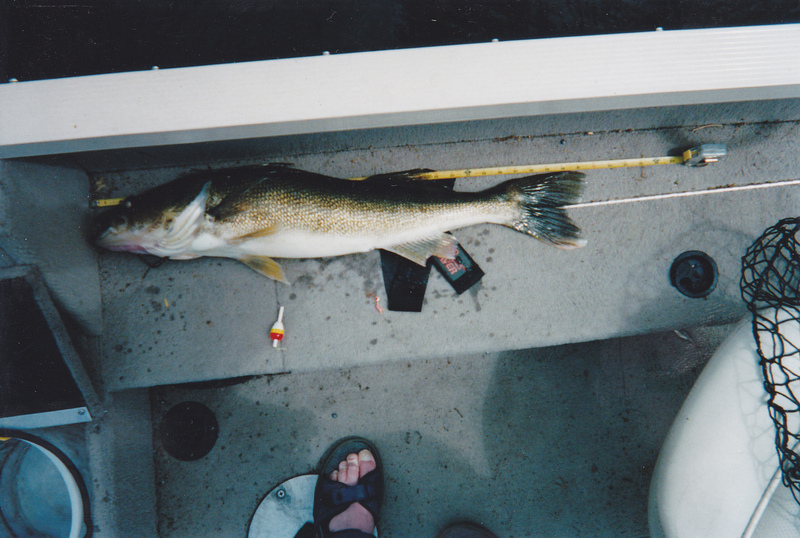 One of my biggest walleye’s I have caught. 31 1/2 inches. I was alone and quickly took this pic and released the big girl. Got her on a jigging spoon with a minnow head. 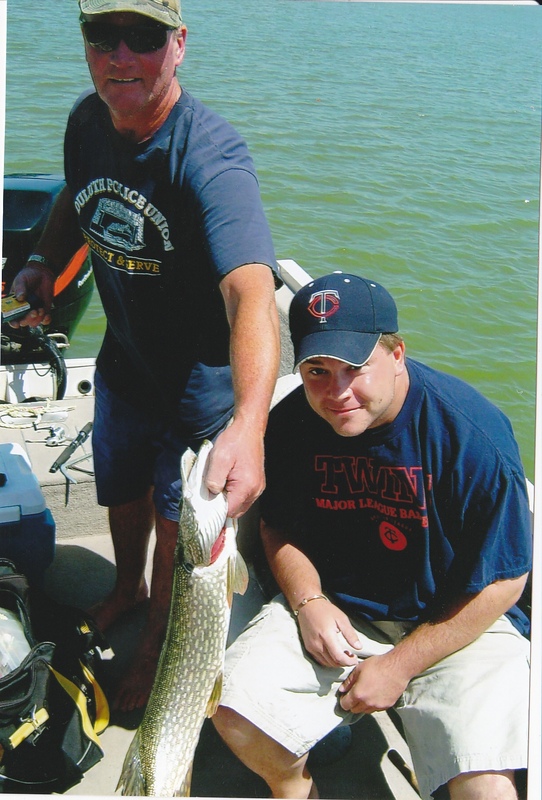 Holding a nice pike that my son-in-law Clay caught on Buffalo Lake near Buffalo Mn. 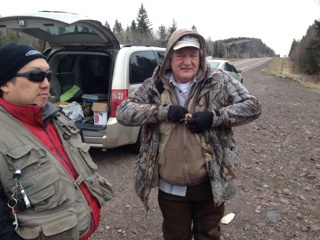 We were fishing for panfish and this pike took the flu-flu and Gulp grub. My brother’s friend is holding a nice 6 pound brown trout near the boat landing by Grindstone Lake near Sandstone Mn. 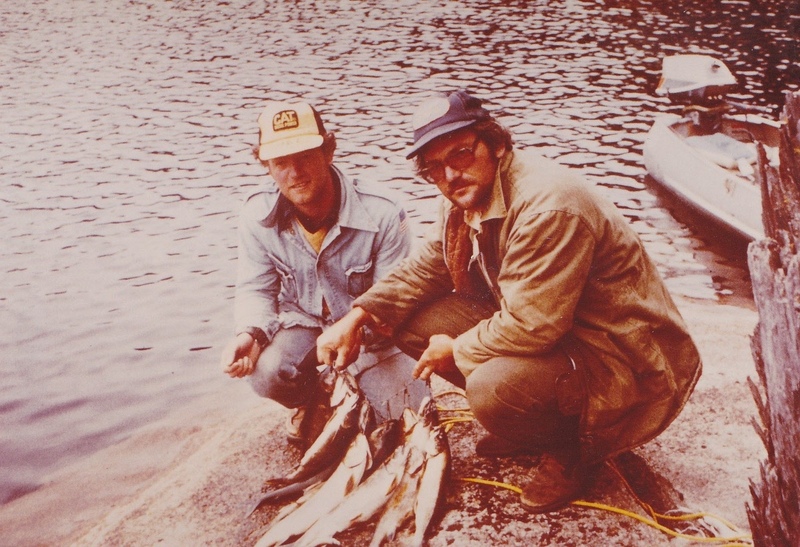 The state record brown trout once came from this lake. I think there are more brown trout in Grindstone that would beat the record again. 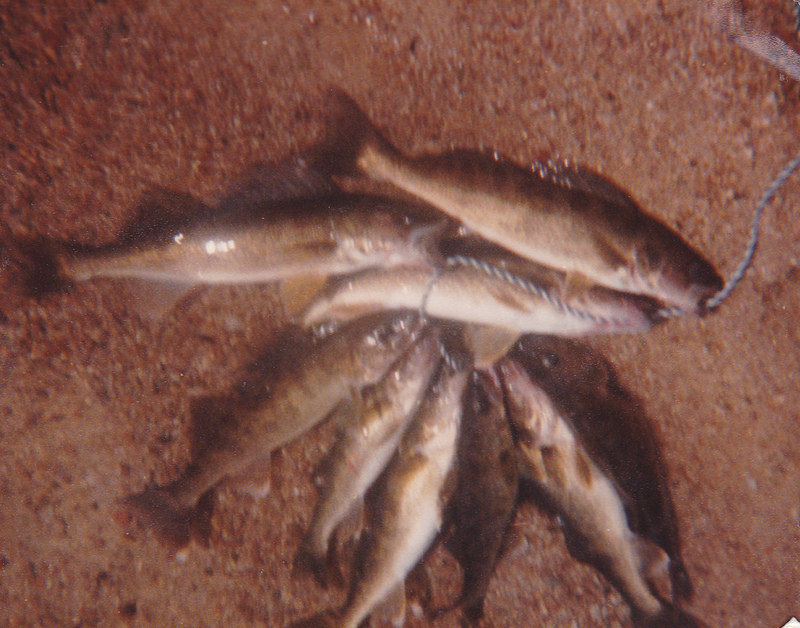 Many smelt in the lake to fatten up game fish. 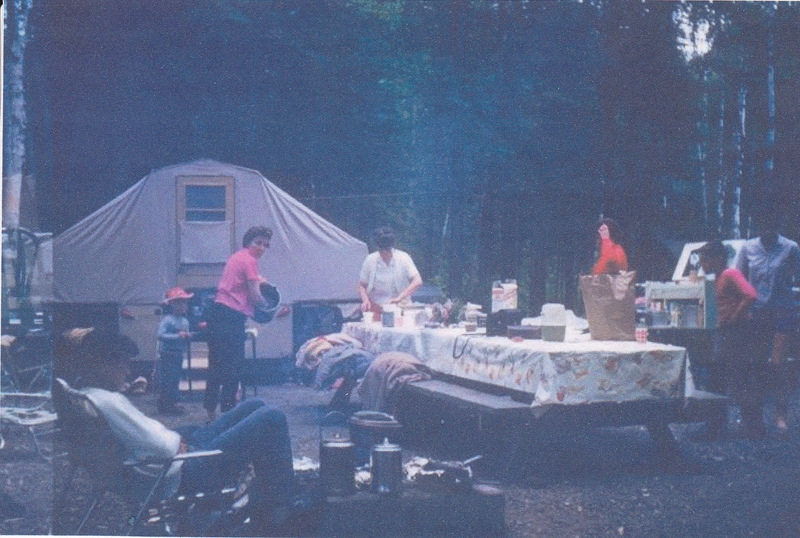 Here is a pic from the early 60’s when we as family’s went camping almost every weekend in the summer. We usualy had two or three family’s and picked the biggest site to put a couple of picnic tables together for a main eating area for everyone. 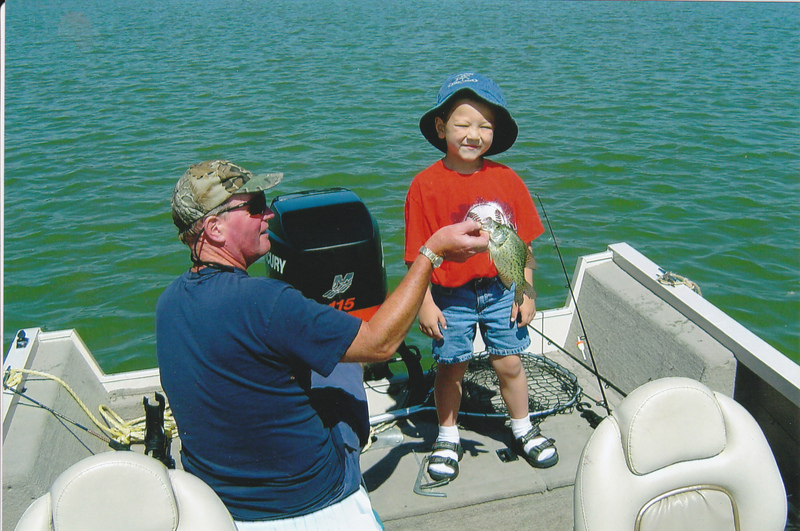 My grandson had a great time at the boat landing catching small bluegills and perch while I was packing up the boat for the trip home from camping at Clubhouse Lake near Marcell, Mn. 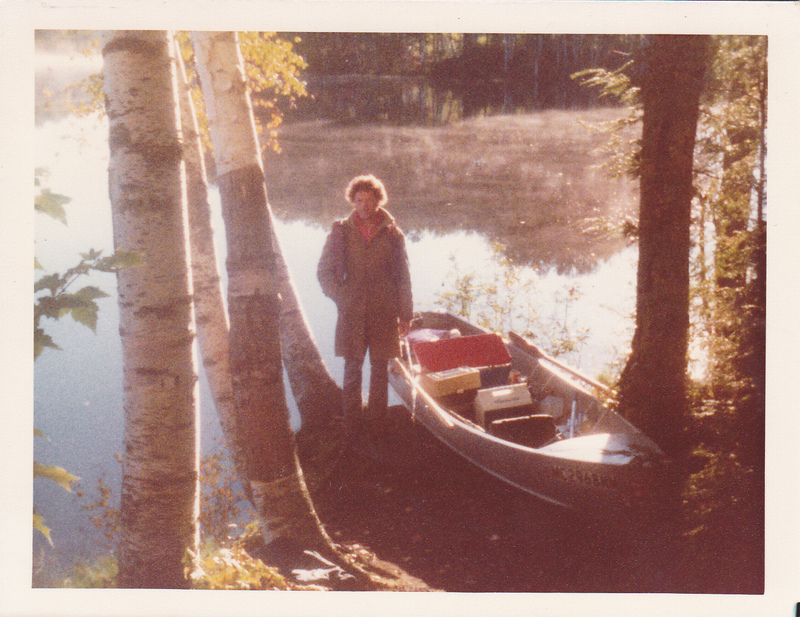 My grandfather came to visit us from Germany in the late 70’s and we camped on Hogback Lake near Isabella Mn. 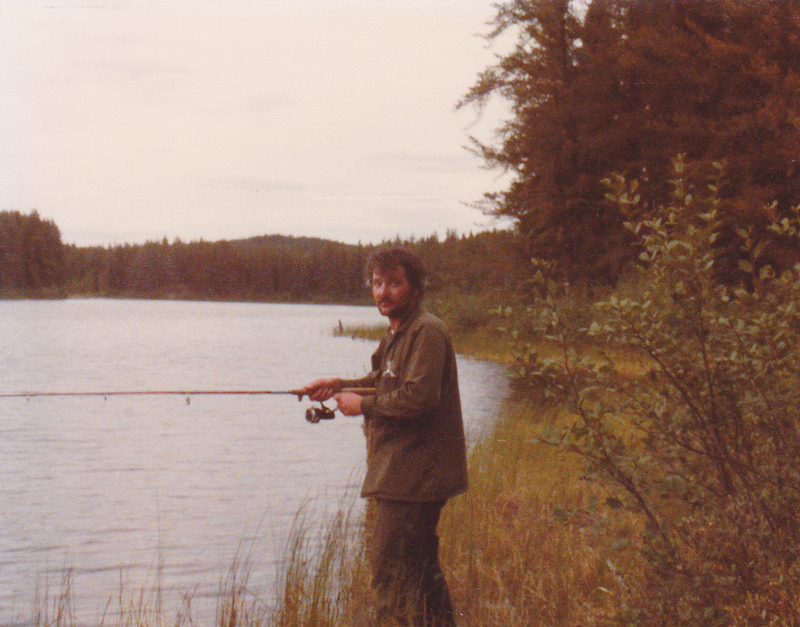 It’s a trout lake and at the time it was stocked with rainbow trout. Caught these rainbows trolling with small spoons and casting with spoons and spinners. 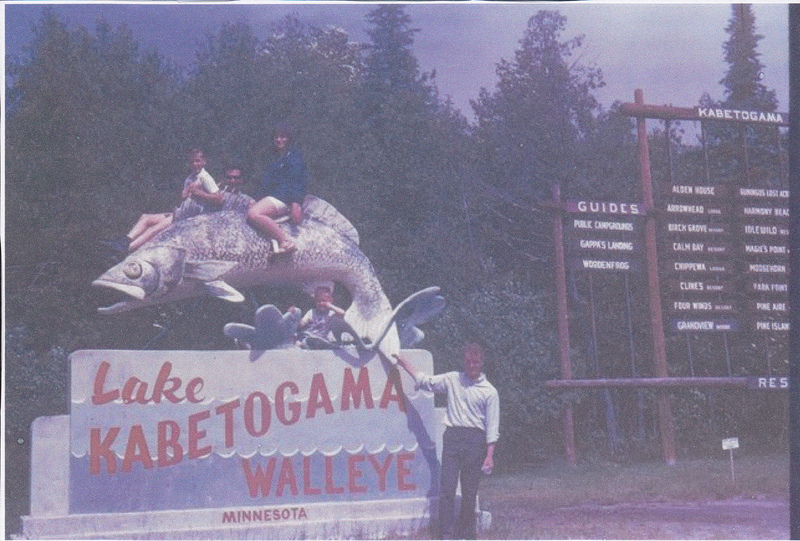 Standing in front of the famous walleye statue at the entrance of resorts and campgrounds to Lake Kabetogama in the late 60’s. That’s me on the right with my sister,brother and a friend sitting on top. One way to wash your cloths is to go back in time and wash them on a big boulder. Little detergent and elbow grease and your good to go. 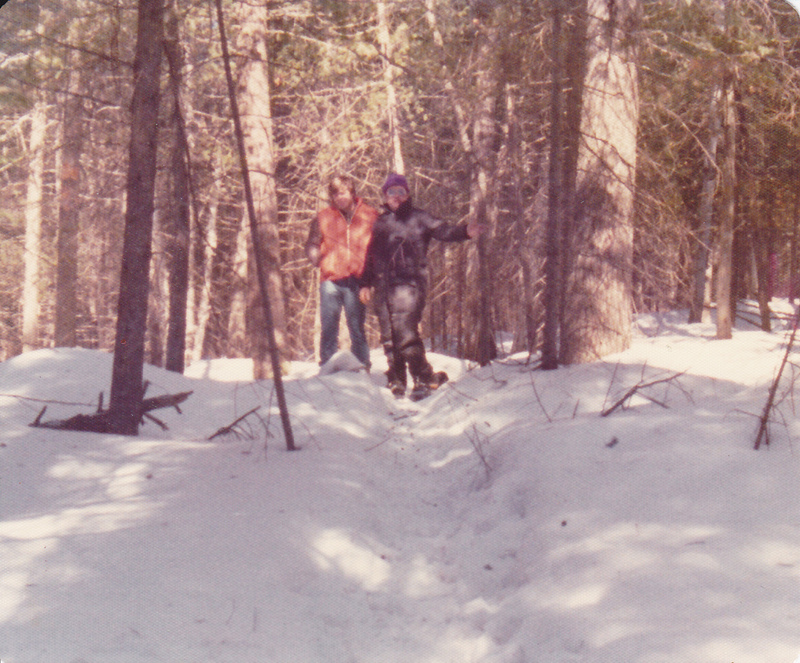 This pic is from the 70’s of a deep deer trail where we still hunt to this day. 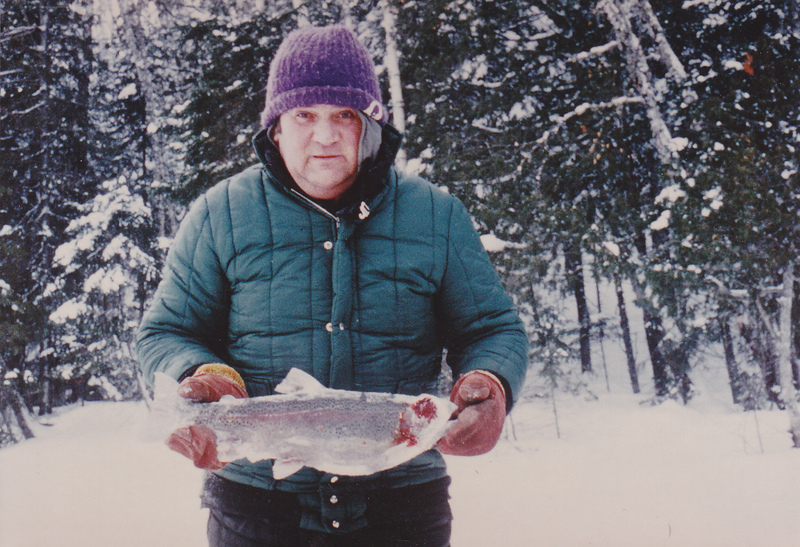 My dad’s friend standing with a nice catch of steelhead back in the 70’s near the north shore of Lake Superior. My brother with a nice walleye and crappie caught up north. Lot’s of times these two species are searching for forage in the same areas. My brother and I portaged into a lake and noticed a depression in the forests where another lake might be. Sure enough there was, and it was full of pike and large perch. Never put a boat in that lake, only fished from shore..Check out the Mitchel 300 on the rod my brother is using. Still have a couple of them. 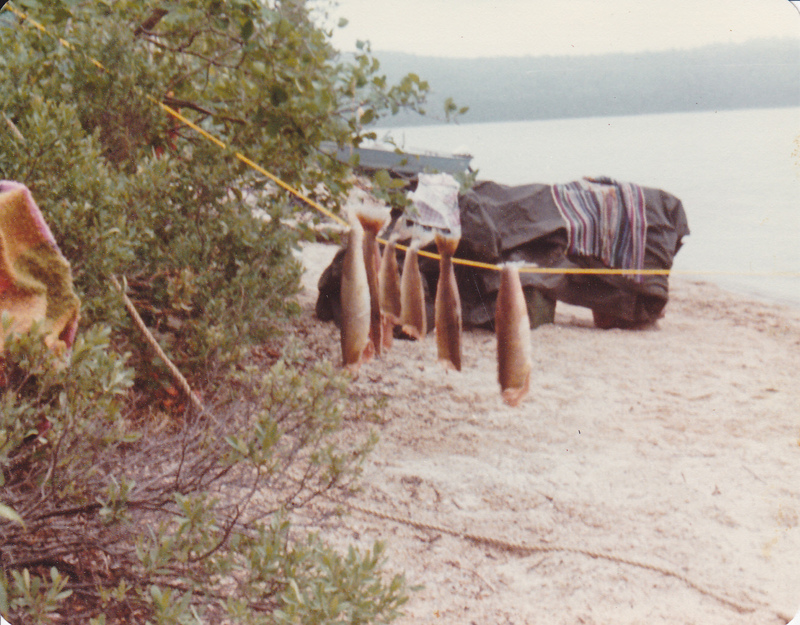 We caught lake trout mostly off shore with dead bait like frozen smelt off bottom. 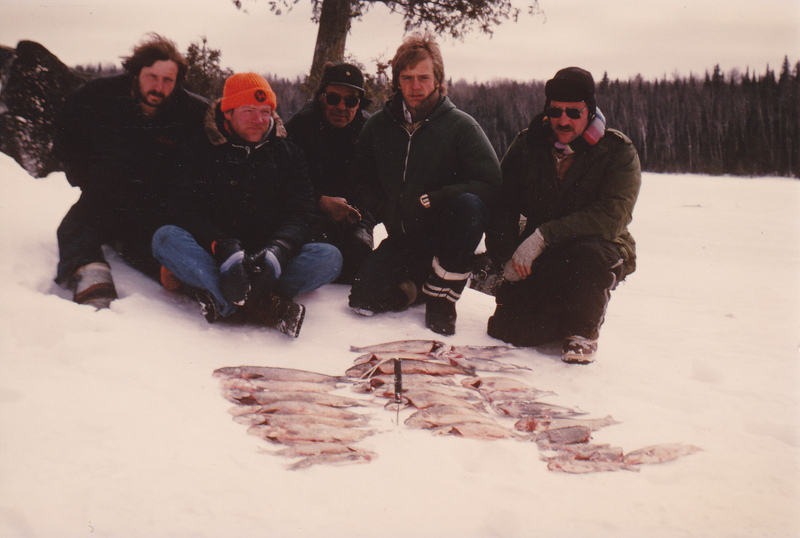 This stringer of mostly lake trout were taken with this method. 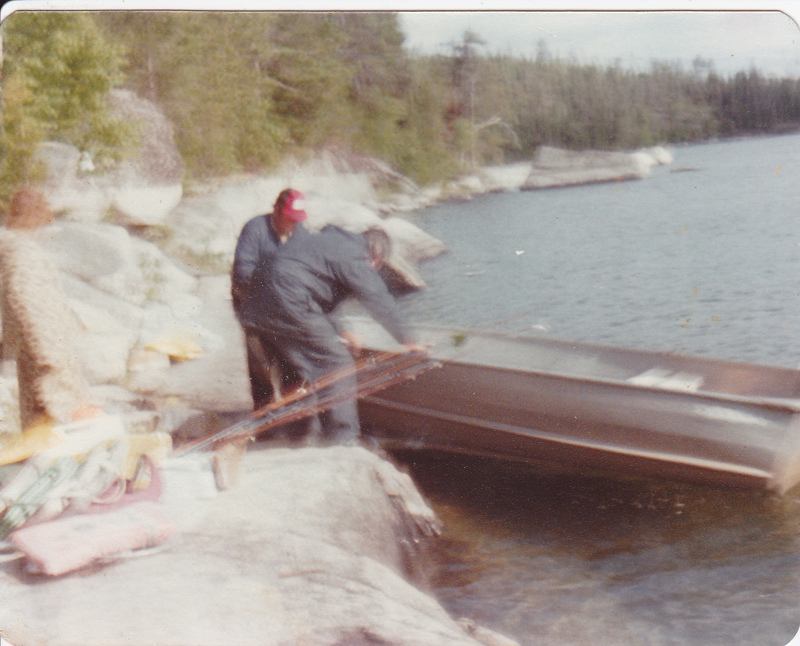 One guy with the rod would stand on shore while the other guy would take the canoe out with the slip sinker and drop the smelt off the side when the old Lawrence green box said it was 40 feet. 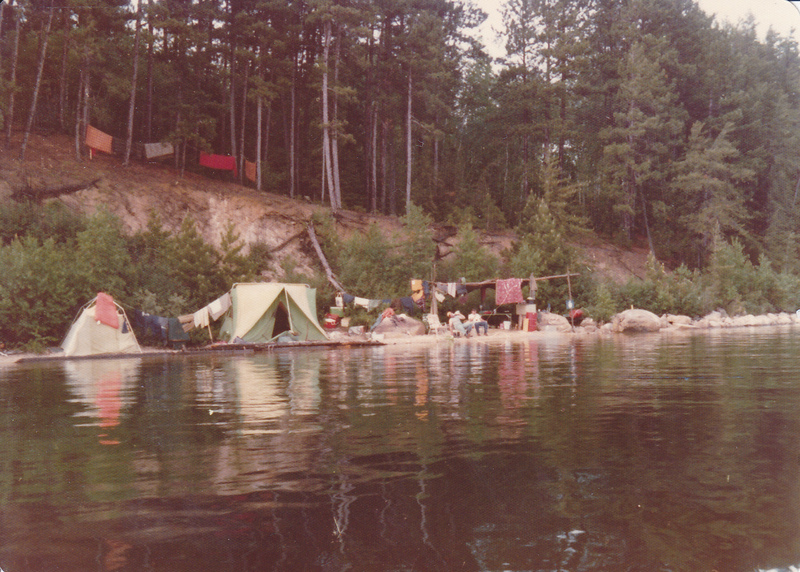 Here is a campsite we had right on shore. This was many years ago. You can see where we had ropes up and hanging things to dry out. That’s about as close as you can get to the water for sure. 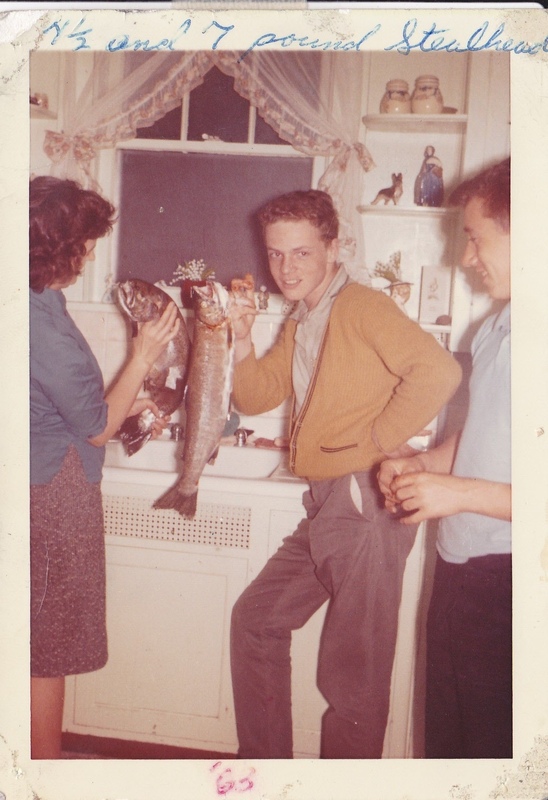 1963 and just came home from the Knife River with a couple of nice steelhead. The bigger one was around 7 pounds and the other one I’m holding was around 4 pounds. Both were caught on black and white daredevil spoons with a single hook. Don’t think anyone uses those anymore for steelhead. Everyone was using yarn and spawn bags but we wanted to be different and it payed off. We dragged a 14 foot Sears aluminum boat into this lake and that sure payed off. 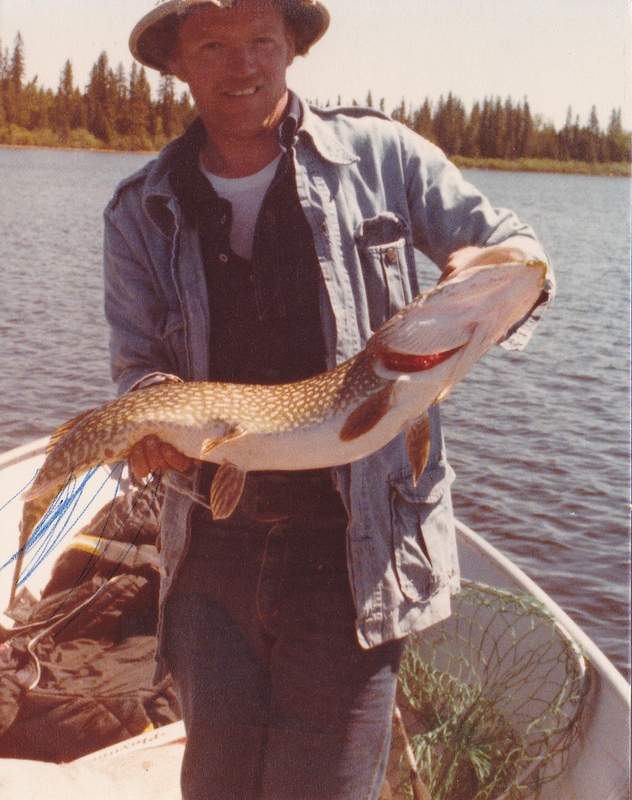 I’m holding a nice pike here but we also got some walleye’s as well. The lake was just loaded with fish. 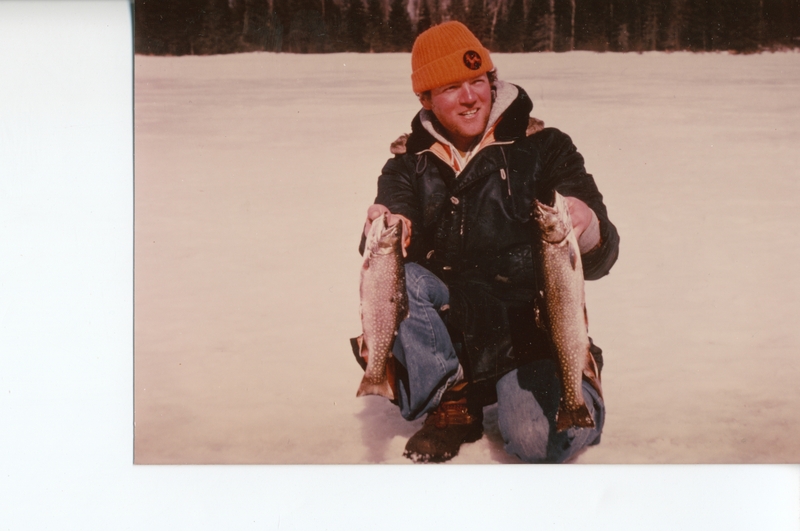 My dad years ago with a nice rainbow on a very cold day on Hogback Lake near Isabella Mn. 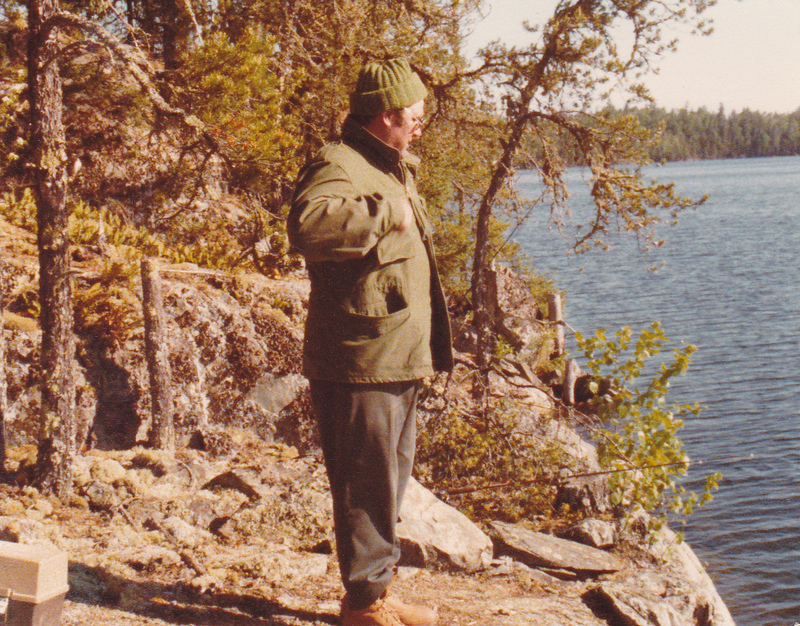 We found this little lake many years ago. 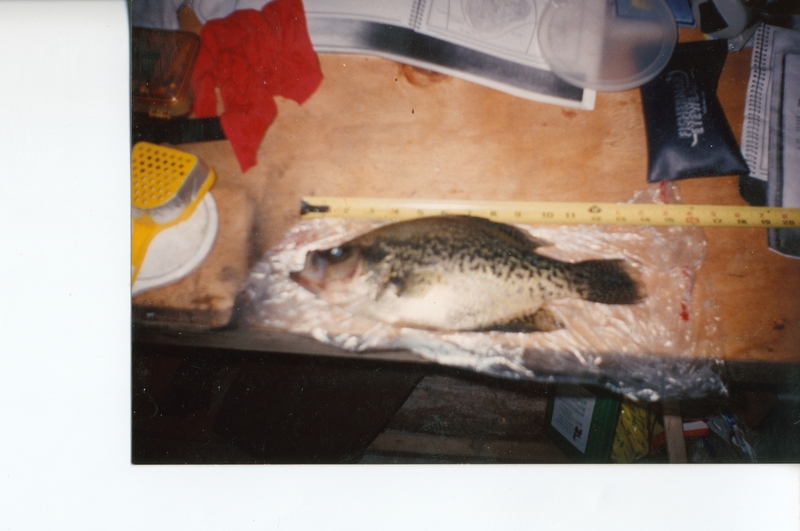 Still has nice crappies in it but we dont go there that often. 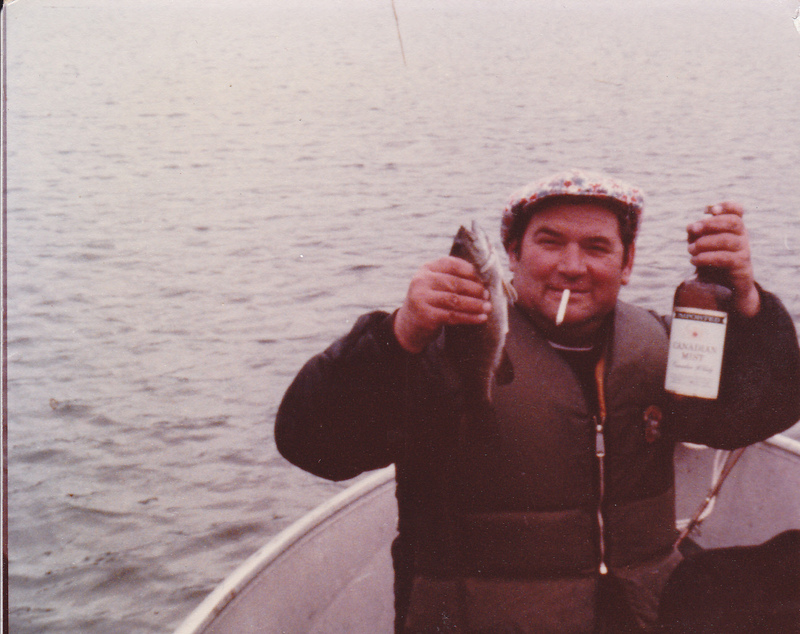 Back in the 70’s we kept fish to eat as in this pic. However these days the larger crappies just like any large fish go back. Lakes like this can be overfished quickly so this lake remains a secret and as far as I know, still doesn’t get fished much if at all. Off the beaten path where we took the time to find it and like to keep it that way. I remember this day well, even though this was 1963. This was Alden Lake, just a few miles outside Duluth. Don’t remember how we got access to the lake that day, for it had no public access. I think my dad knew someone. I lost my biggest pike that day. I threw a red and white bass-o-reno with a bucktail treble in the rear that I put on there myself. Long story short, I lost it on a jump. Broke my line. Never set my drag and that’s what happens. My personal best is 23 pounds but that one had to be as big or bigger. For a young kid, I took it pretty hard, even though I have myself to blame. 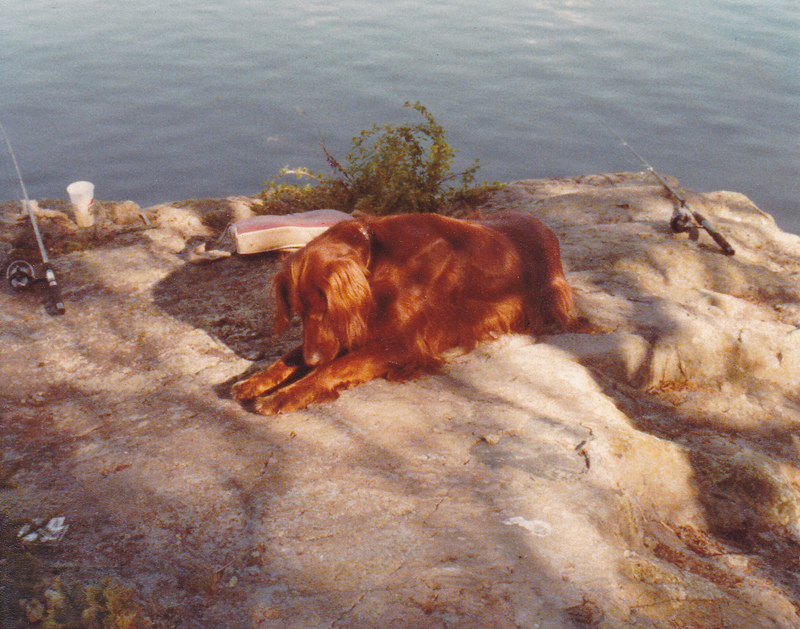 Our family dog way back when, Ralph. Ready to attack a fly I’m sure, while we had our rod’s out for lake trout. Have to wash my hair during the week long stay in the woods. 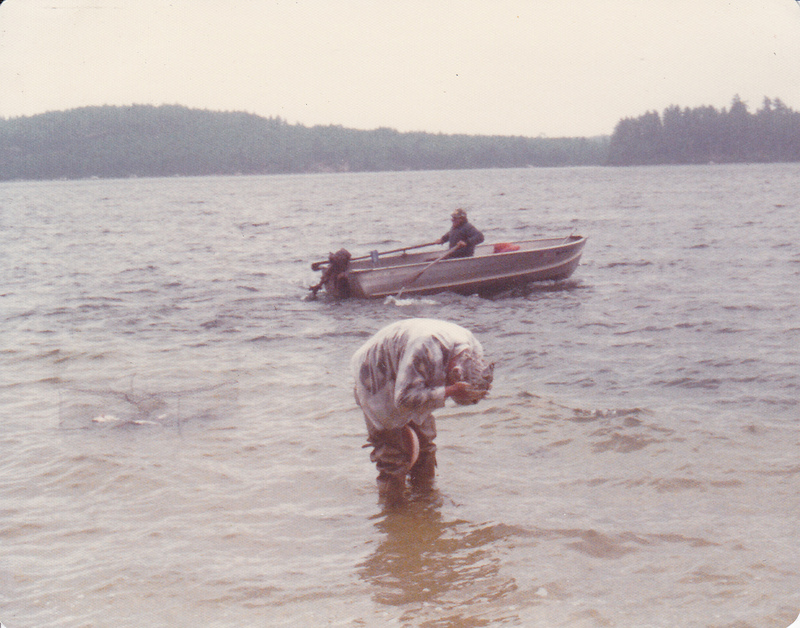 One of the guy’s taking out our dead bait to drop off for lake trout when we fished off shore. We made our own cover with tarps and dead wood we found in the woods. Worked real well. Didn’t cover a lot, but enough for the stove and the camp kitchen. 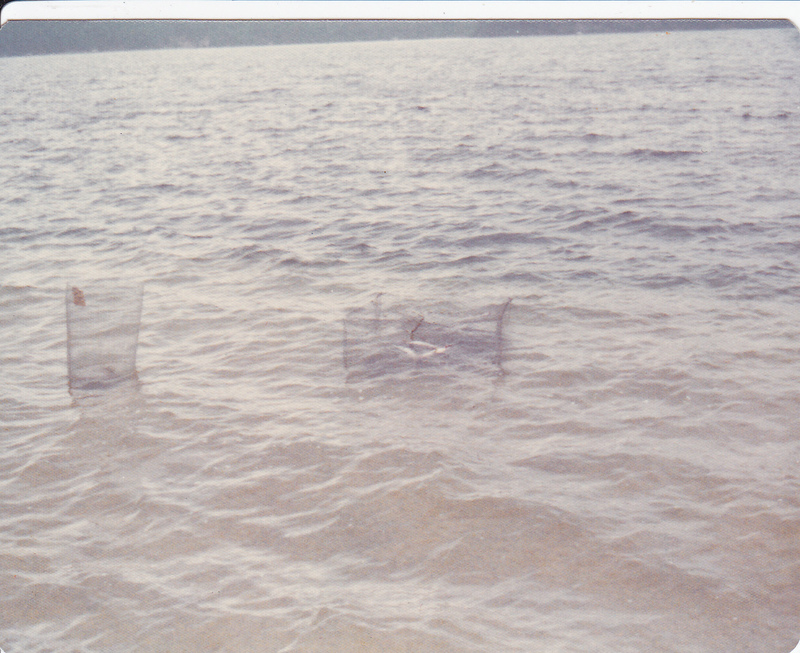 We kept fish alive at times in metal fencing material with sticks from the woods for support. Kept them alive better than on the stringer. We also use large rocks to keep the cages in place. 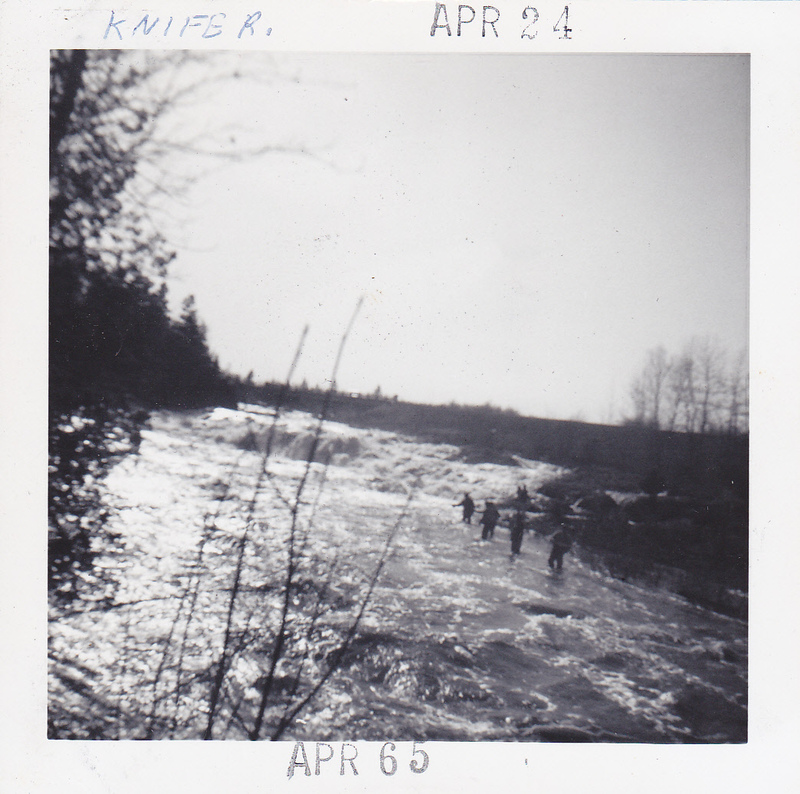 This is a pic of the Knife River back in 1965 when the steelhead run was on. Fisherman on both sides lined up for the silver bullets. 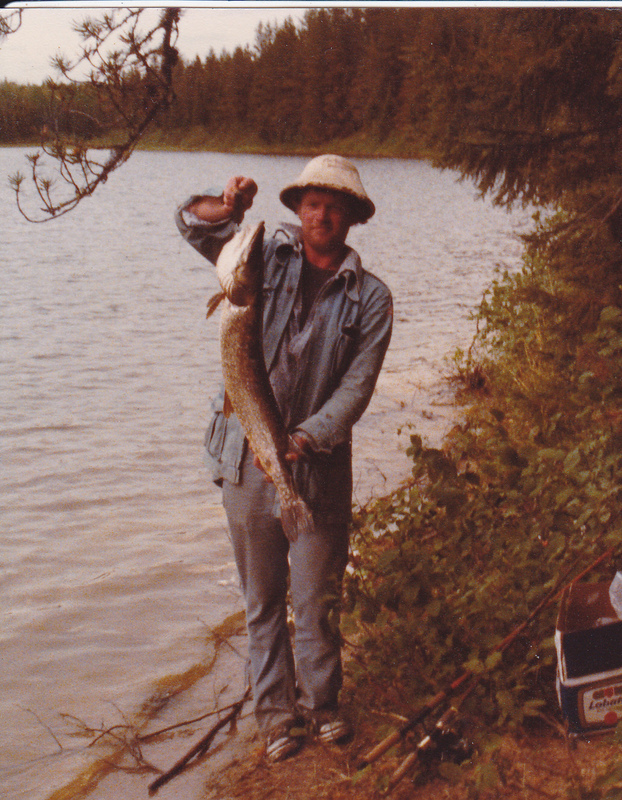 I have fished the rivers of the north shore since that time. Always an exciting time. My buddy Mike with a nice crappie caught on a small lake north of Duluth. Nice little brown trout from Grindstone Lake near Sandstone Mn. Caught it on a small spoon with a minnow head. I was in about 8 feet of water fishing for rainbows. 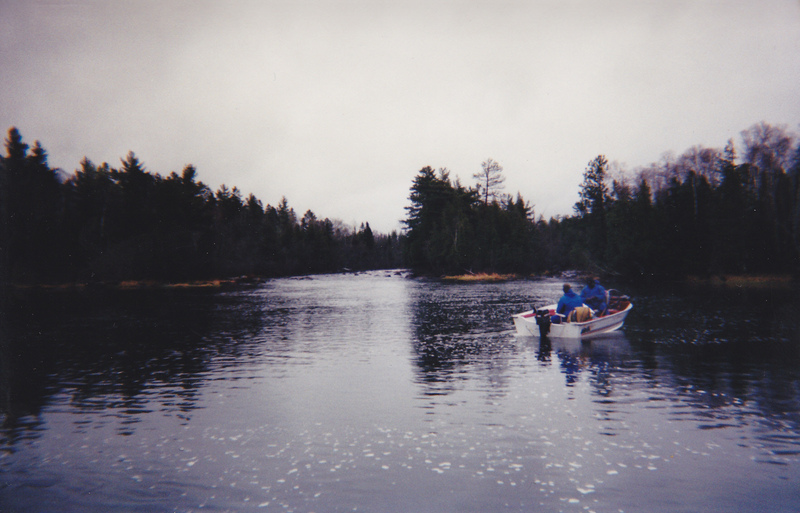 The DNR stocks this lake twice a year with rainbows, and one a year with browns and lakers. 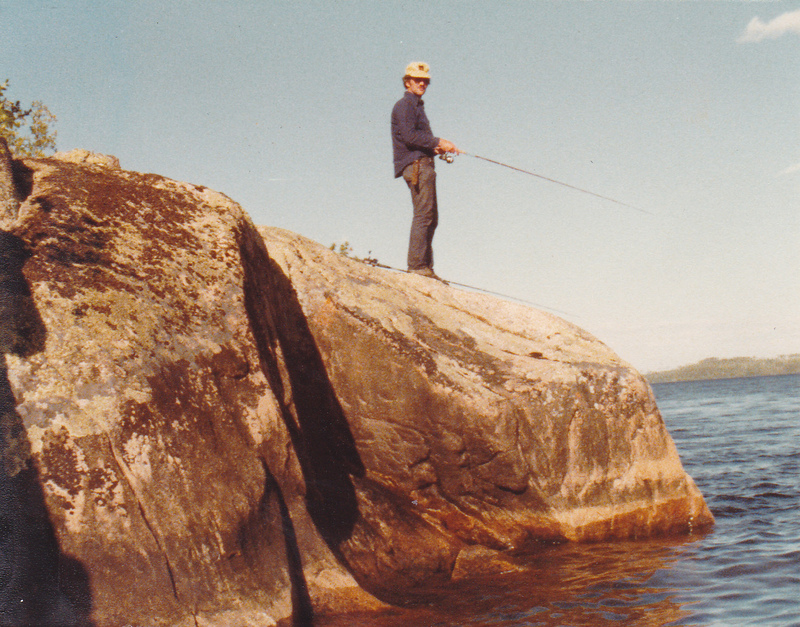 My dad years ago standing on a rock ledge with the rods out with frozen smelt on the bottom. The lakers we caught weren’t that big here but sure were tasty. Having some fun with my grandson Tyler. Good day with lot’s of action on Buffalo Lake near Buffalo Mn. 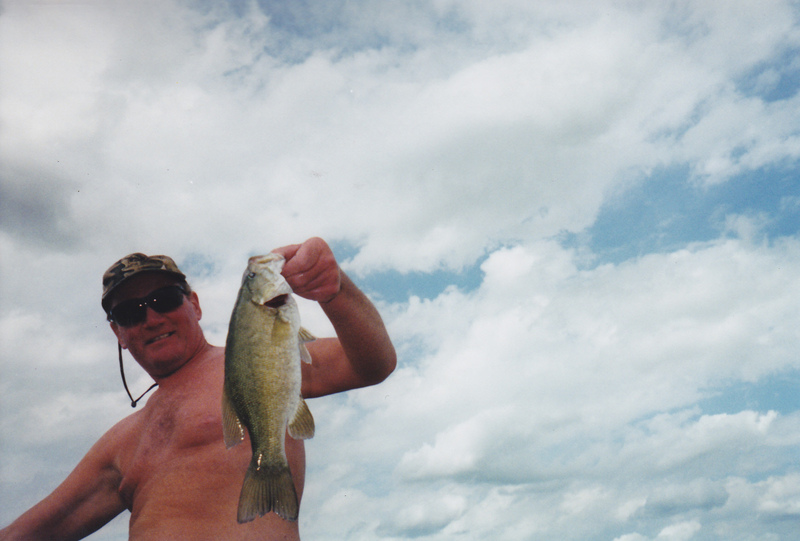 It was July and the fish were on the edge of the weeds in the center of the lake by the shallow flat. 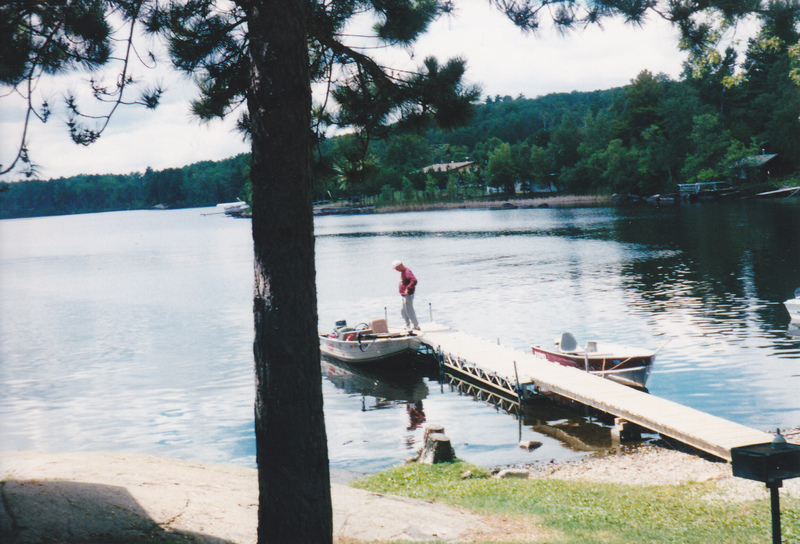 Shoreline view of the docks of the cabins that belong to Hungry Jack Lodge on Hungry Jack Lake. My wife and I rented a cabin there in the fall one year [Year of the Ham Lake Fire}. 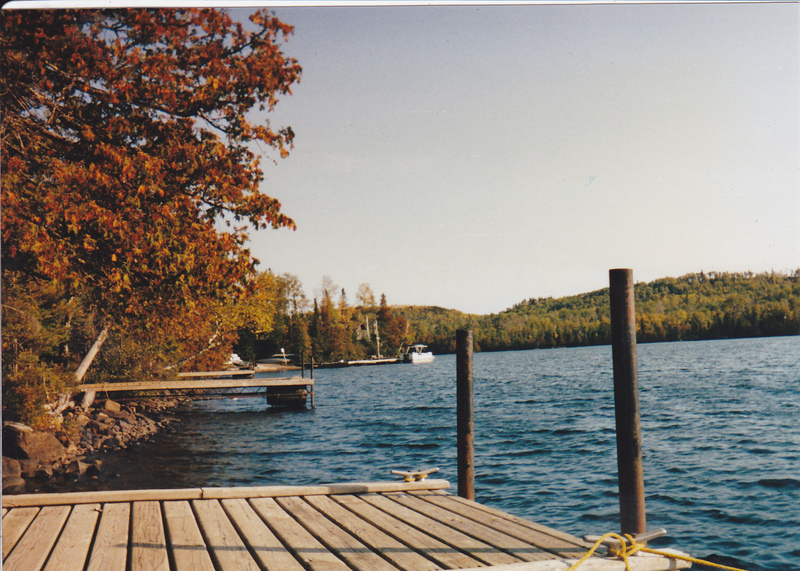 While I took my boat along, we ended up catching all the walleye’s we needed right off this dock. We put on a leech under a slip-bobber in late afternoon and didn’t have to cast out far. The eye’s came in strong between 7 and 8 pm right next to the dock’s depth. I could cast to the end of the next dock you see and the bobber would drift back to me with it going under almost every cast. However the strong bite would last only one hour or so, and quickly ended. Same thing in the early morning. Now to most folks this picture would show a storm coming up, but that’s not what this is. 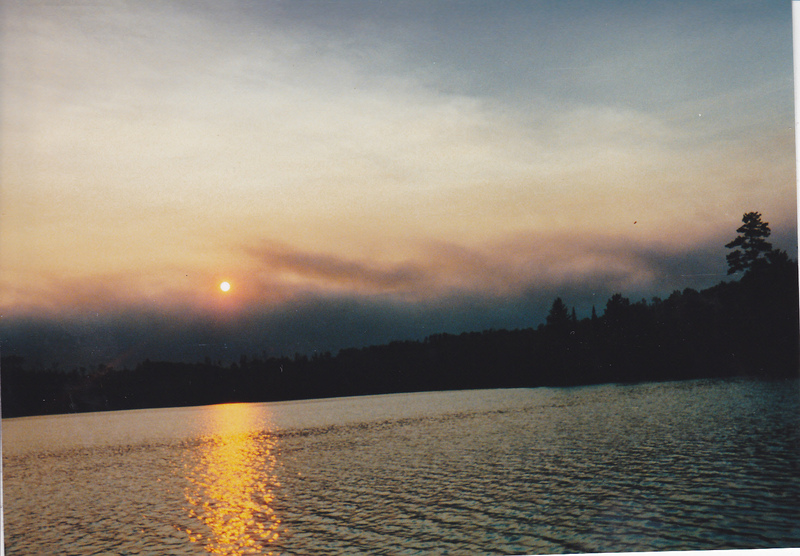 This is in the afternoon on Hungry Jack Lake during the big Ham Lake fire. The darkness you see is the smoke from the fire. There were times that the smoke would block out the sun during the day. The resort had sprinklers set up on the roof of all the cabins and the lodge itself in case the fire came near. 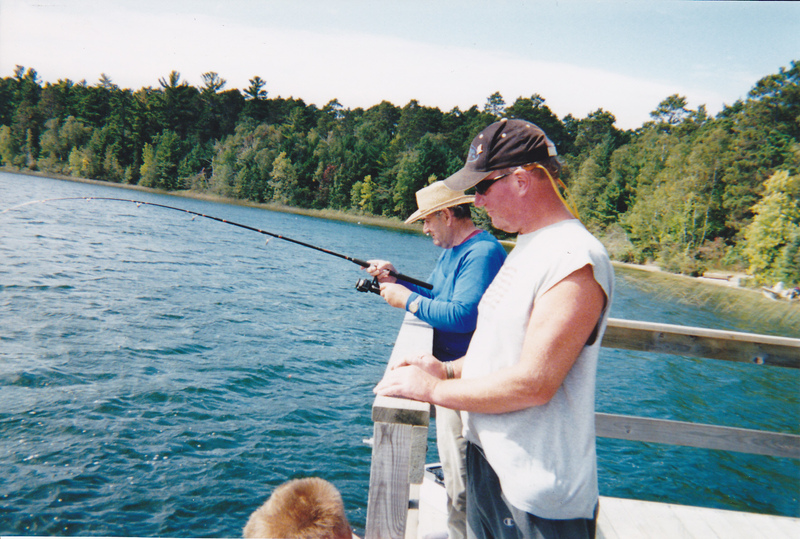 Fishing of the fishing pier on Clubhouse Lake near Marcel Minnesota [Grand Rapids area]. 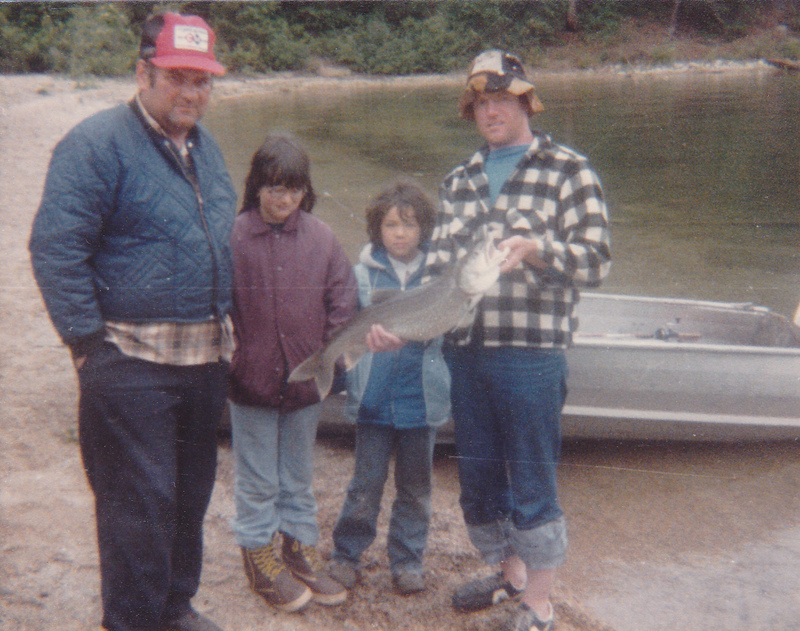 My dad with a smallmouth at the end of the line while my grandson and I look on. The beauty of the evening sunset is like no other than in the Arrowhead of Minnesota. 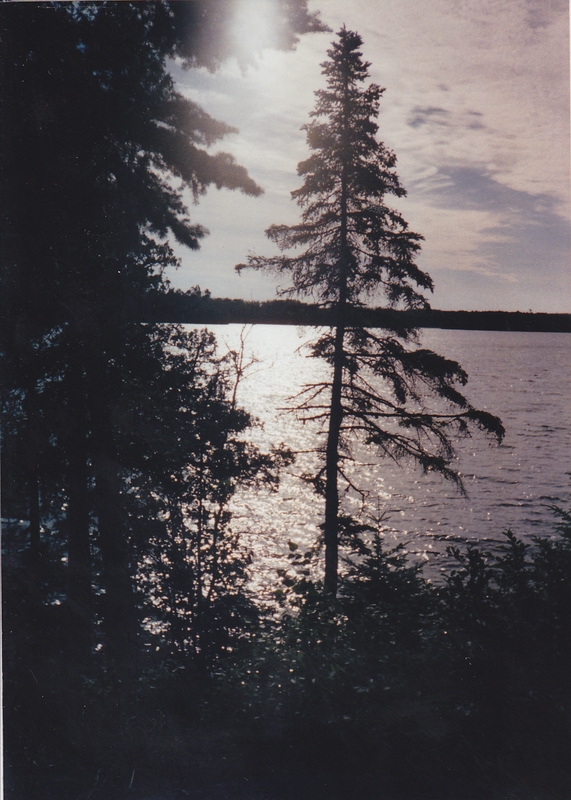 This was on Bear Head Lake near Ely, Minnesota. Hanging the fish after the cleaning. Rope come’s in handy. 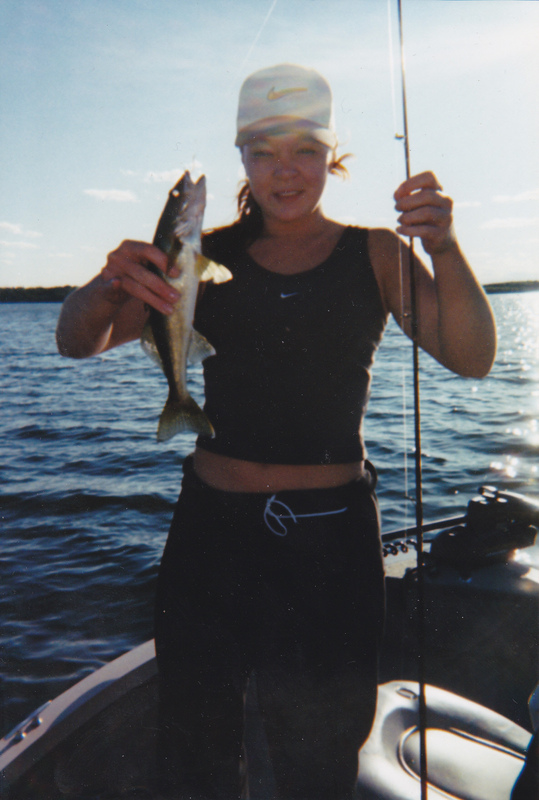 My daughter Kim, with a nice walleye from Bear Head Lake near Ely, Mn. Perfect eater but most were thrown back. Rice Lake near Duluth Mn. does have some nice walleye’s in it’s waters. Got this one on a rapala . Grindstone Lake near Sandstone Mn. has more that trout. Big pike, crappies, and smallmouth like this and bigger. I will cover this lake more in my “Where To Go ” Page. 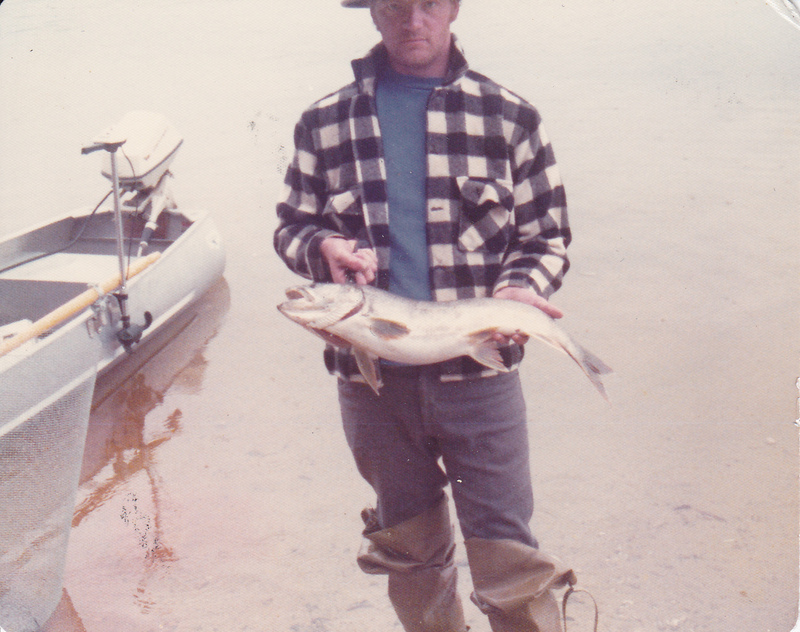 I have fished this lake since the early 70’s. Foggy morning on Dumbell Lake near Isabella Mn. 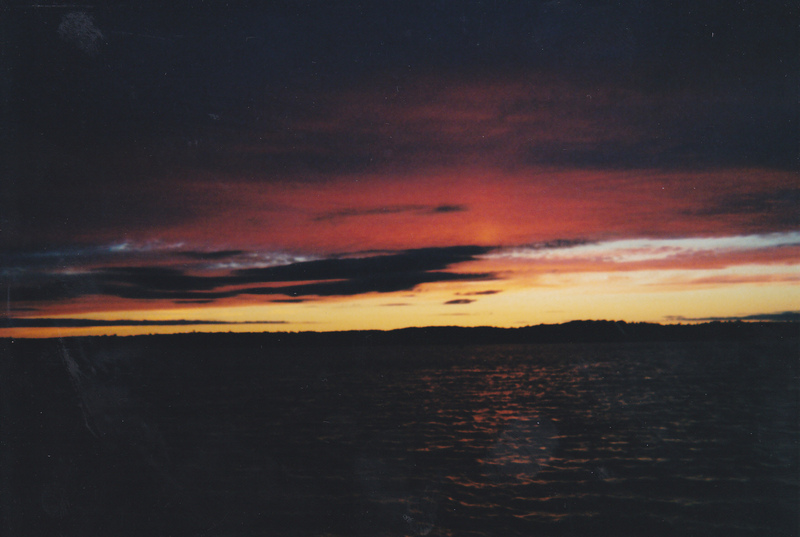 We were camping on the island near the boat landing when I took this picture. 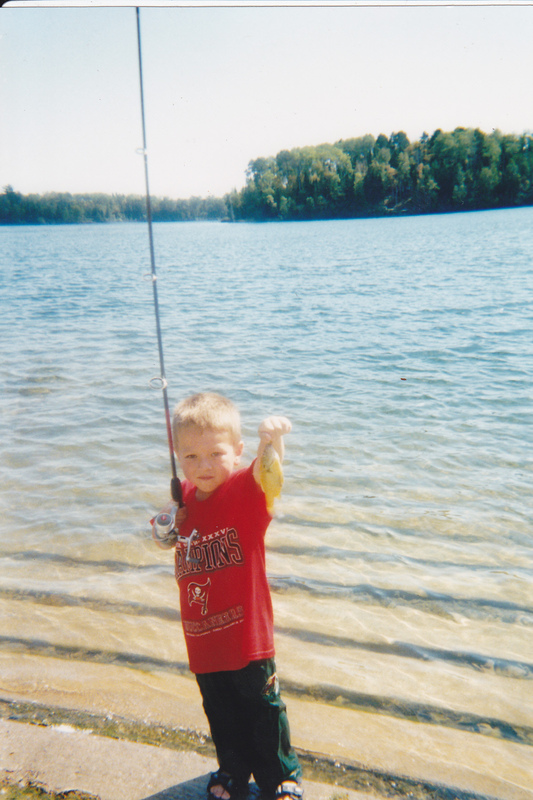 A small trout lake with brook trout stocked anualy located within Bear Head State Park near Ely, Minn. My grandson did well with walleye’s even at a young age here at Bear Head State Park near Ely, Minn. Small lake north of Duluth gave up some eater walleye’s and crappies for us. It’s a stained lake so fishing was best during the day. 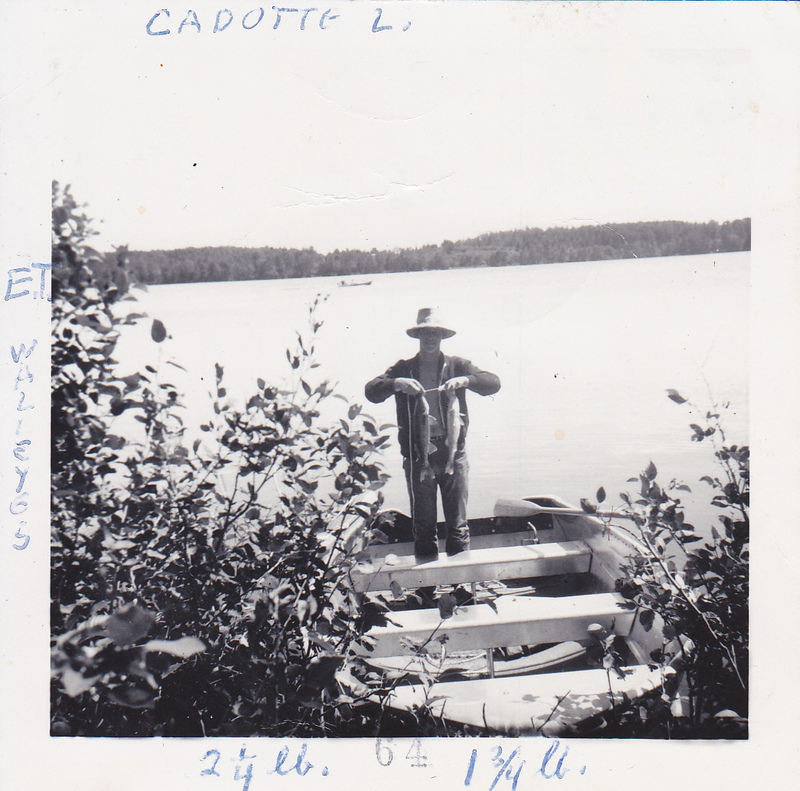 Back in time at Caddott Lake in 1964. Camping with the family and my brother holding a couple of nice walleye’s. 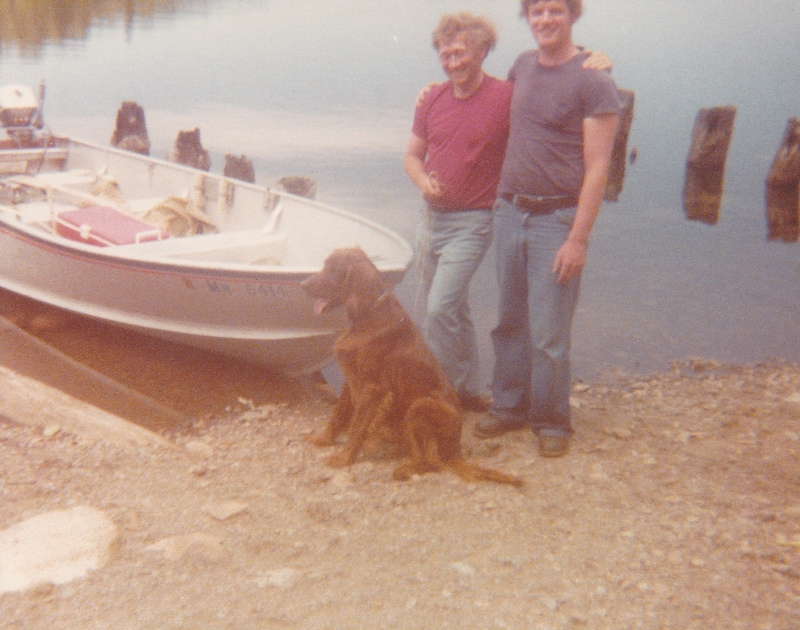 All we had back then is a 14 foot Sears boat with oars. Caddott has a nice campground to this day with a fishing pier, beach and nice landing. Walleye’s and good size perch. 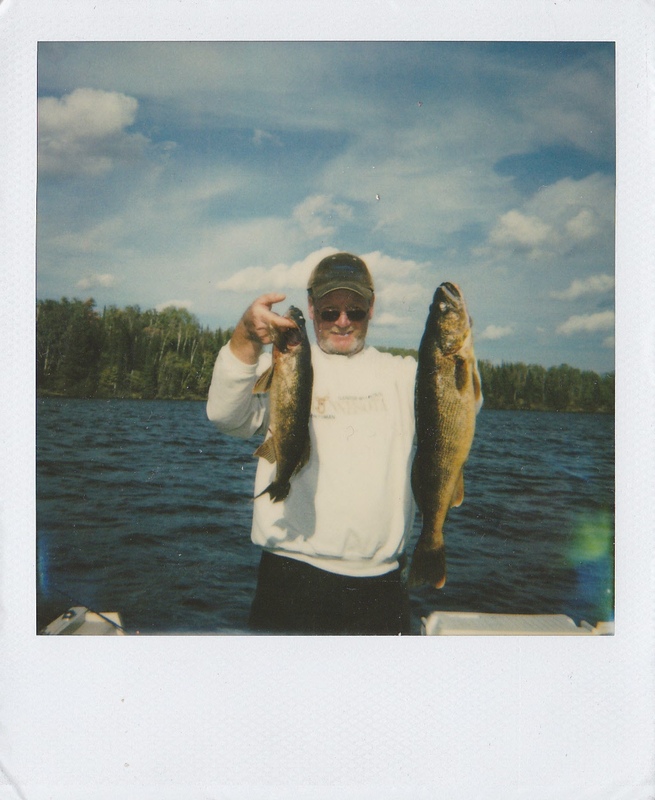 Couple of brown trout caught on Grindstone Lake near Sandstone Minn. Caught on live minnows under a bobber. I don’t fish bass much but when I do I catch some like this. Well at least some of the time. Casting a small spoon in a stream trout lake withing Bear Head State Park. We did catch a few off shore while camping in the park. 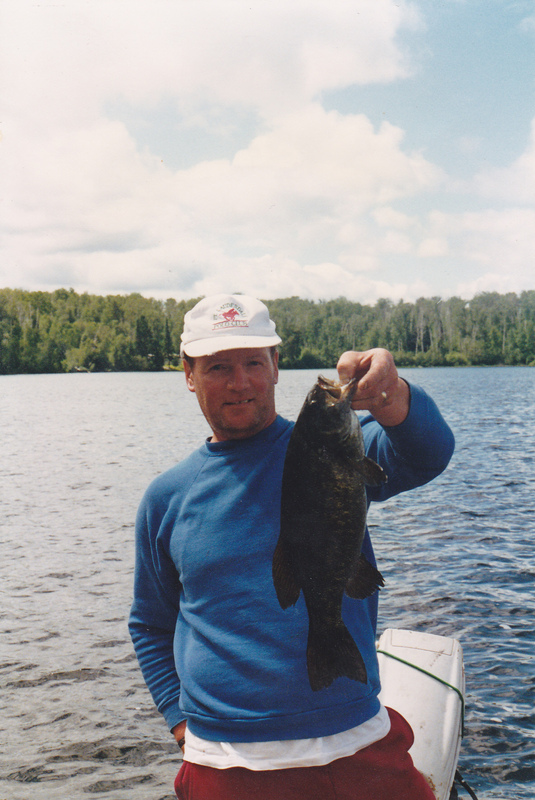 Smallmouth bass are plentiful in Island Lake near Duluth Minn. Numbers and size are present. Lot’s of walleye’s here too but most run in the eater bracket. 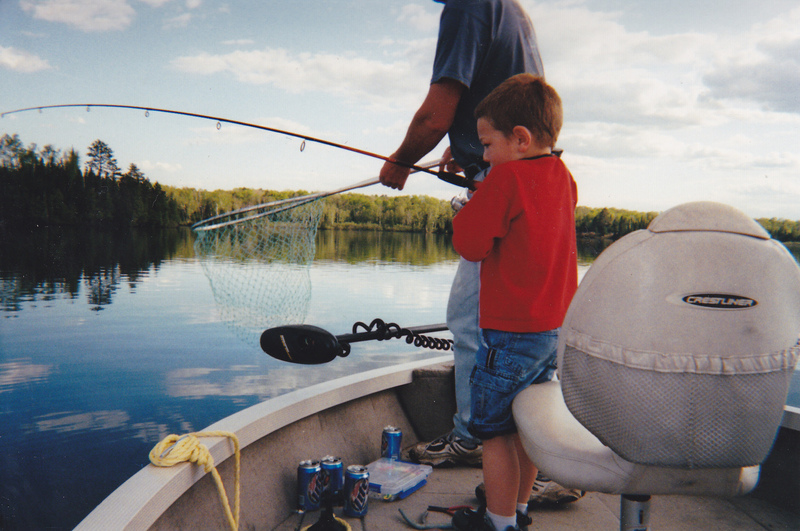 Netting a eater walleye for my grandson a few years ago at Bear Head State Park. 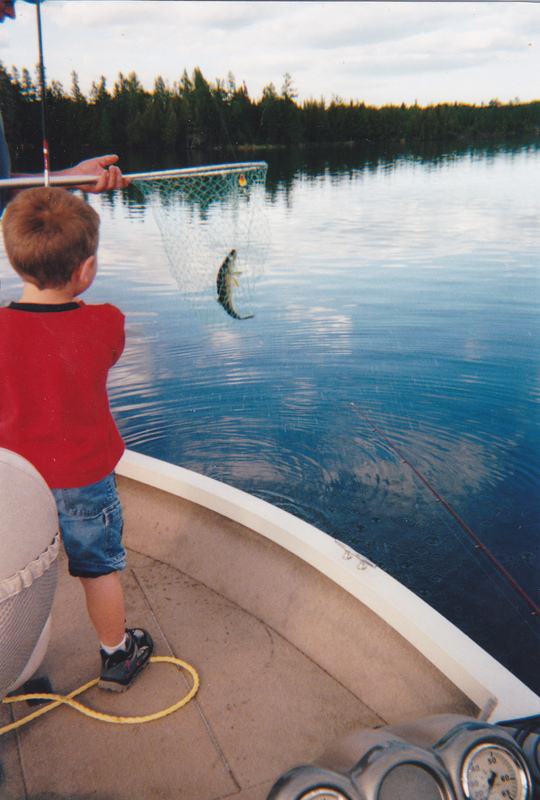 Back when I was a kid we kept bass for the table. This was in the early 60’s. 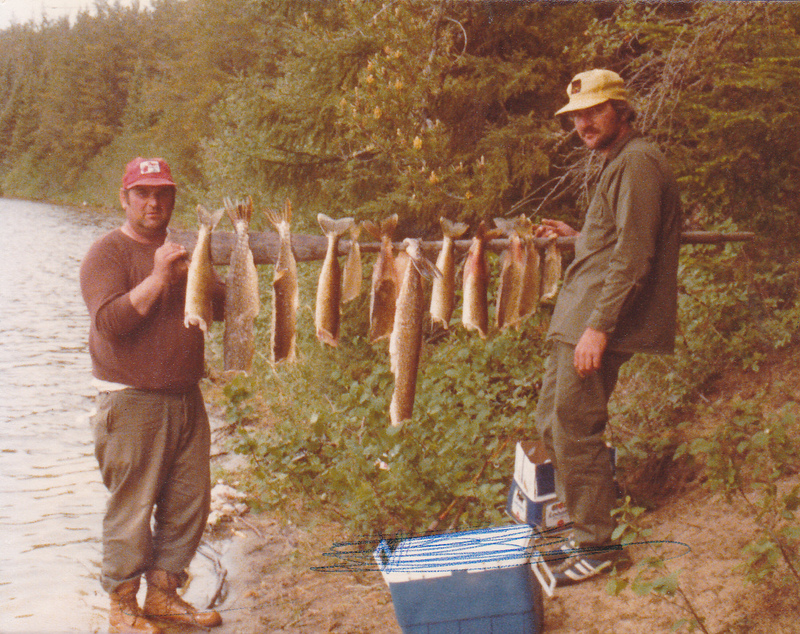 We fished the north shore streams in the upper parts plenty when I was a kid. This was a 18 inch brown I caught in the upper Lester River. 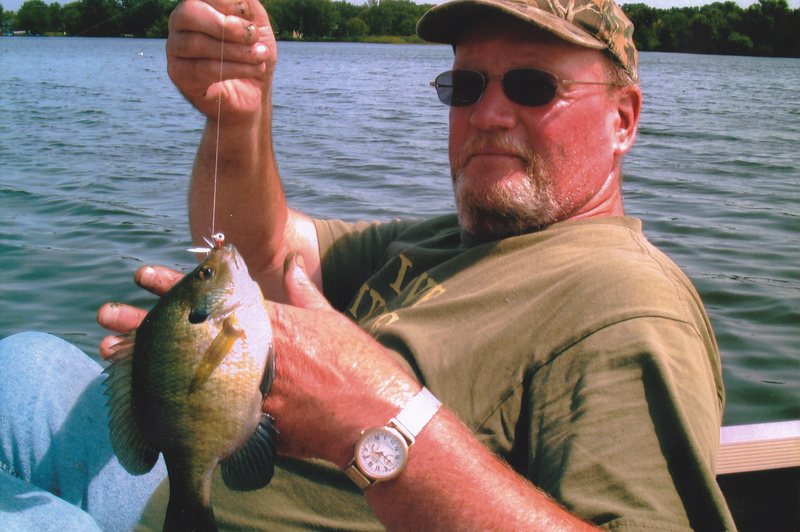 Nice bluegills can be found up north as well. Fishing off shore never get’s old. 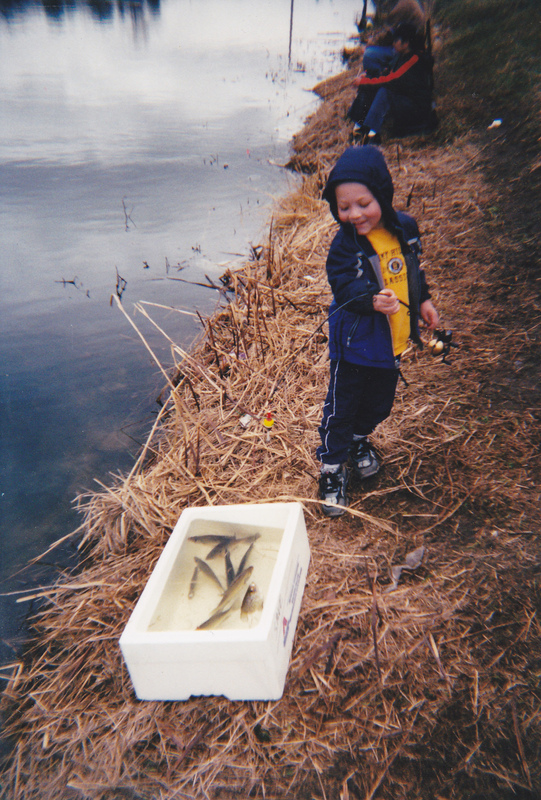 I think my grandson had more fun playing with a few crappies I put in a foam container than fishing in the lake. 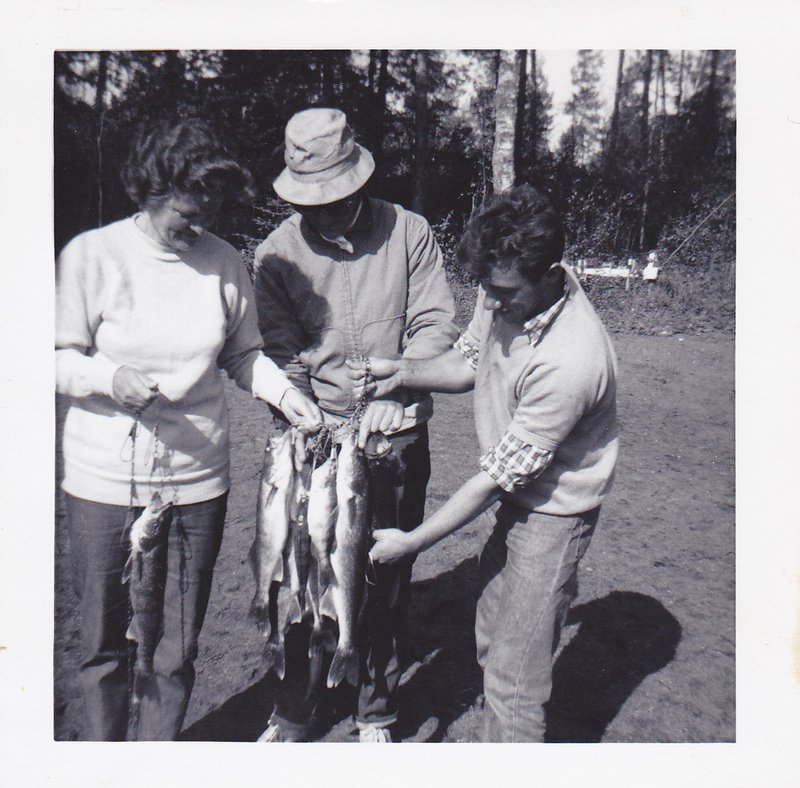 Many years ago some relatives from Germany came to visit and I took my mom’s brother fishing to Echo Lake near Isabella Minn. for some trout. 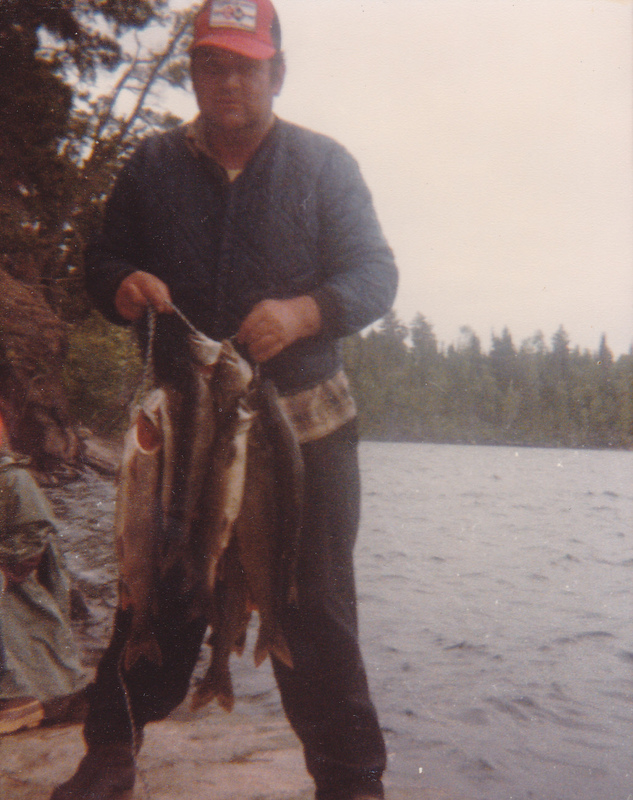 Fishing in March in 1965 on Clearwater Lake on the Gunflint Trail. We drove to the landing and walked out till we got to about 60 feet deep. Fished with live minnows and frozen smelt off bottom. 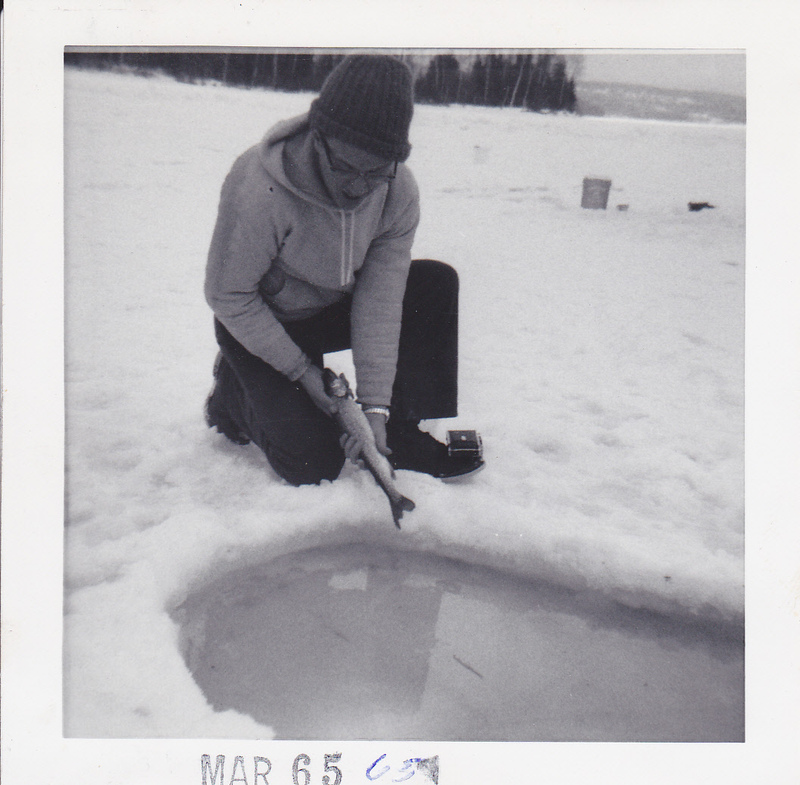 With all the slush on the lake we built small pools and let the lakers we caught swim around while we continued fishing. 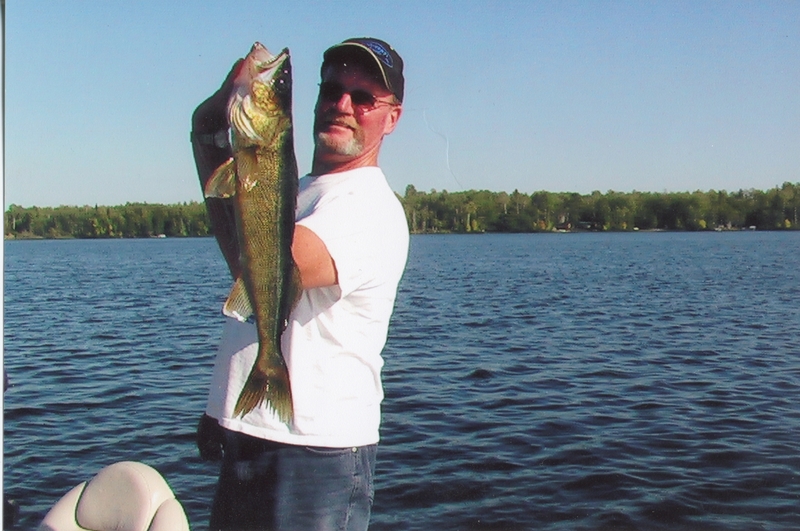 Walleye’s from Caddott Lake near Two Harbors Minn. Most of these walleye’s were caught in the early hours. It’s a clear lake so early and late in the day is best. 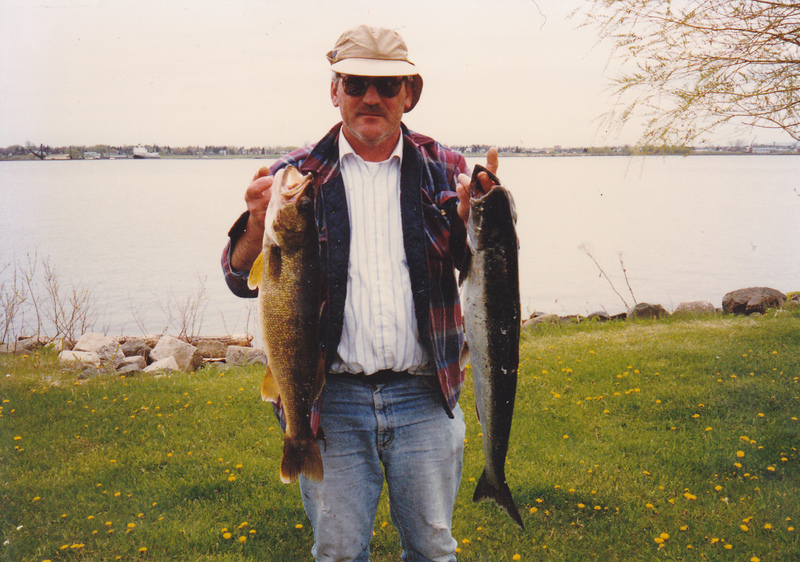 Still is a good lake to this day for walleye’s and nice perch. Has a nice campground on it with a good beach for the kids. 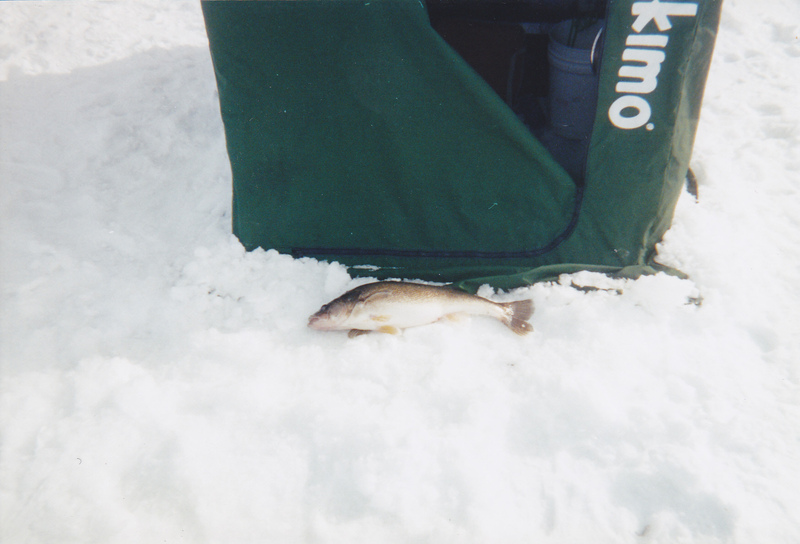 A nice walleye hit’s the ice on Boulder Lake near Duluth Minn. The day bite is good and late afternoon being that this is a stained water lake. One of my favorite lakes. 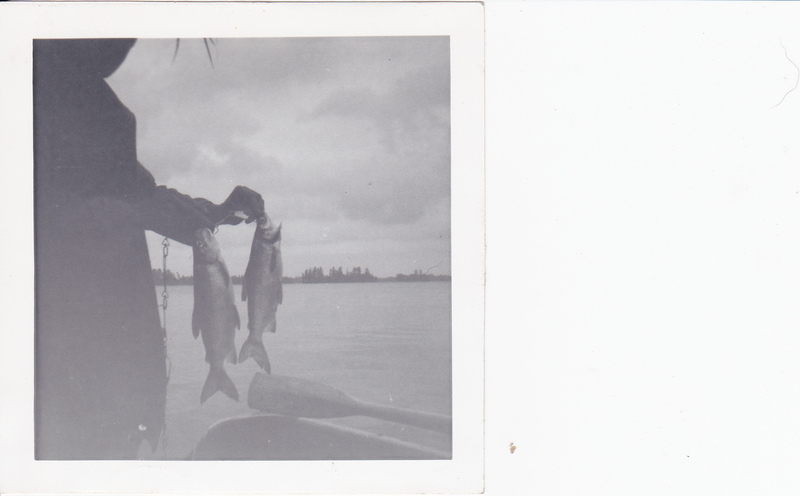 Fished it since the early 60’s. 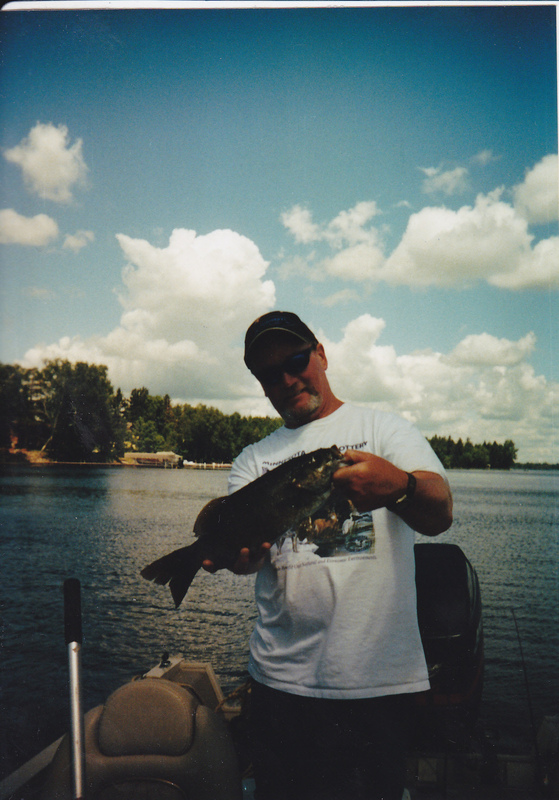 Couple of pic’s from Dumbell Lake near Isabella Minn. These were taken on a island where my wife and I and the dogs went camping. 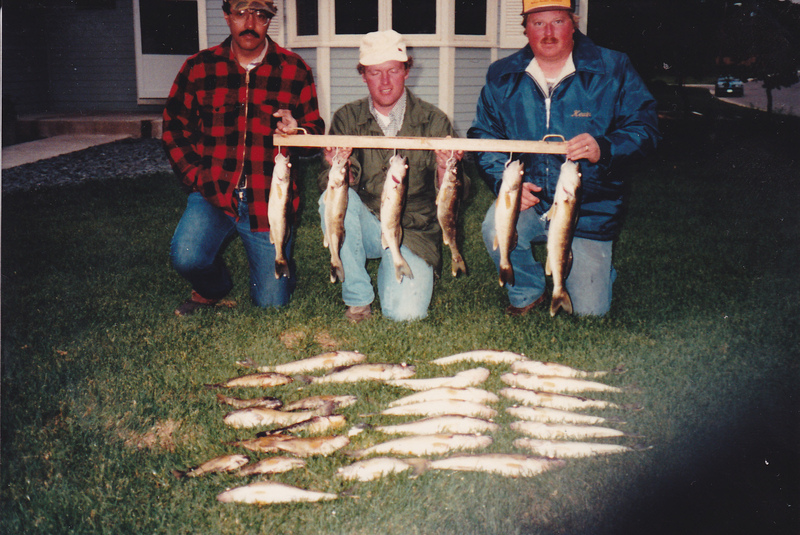 Walleye’s, smallmouth, and some musky’s left from stockings years ago. 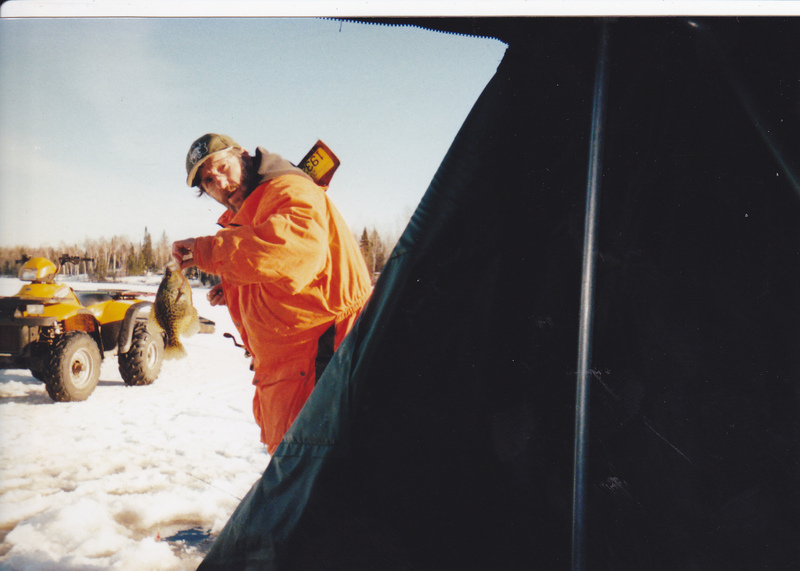 I realy do enjoy fishing for bass but I’m more into trout and walleye’s. Sometimes peoples motors break down and it’s my turn to do a good deed. 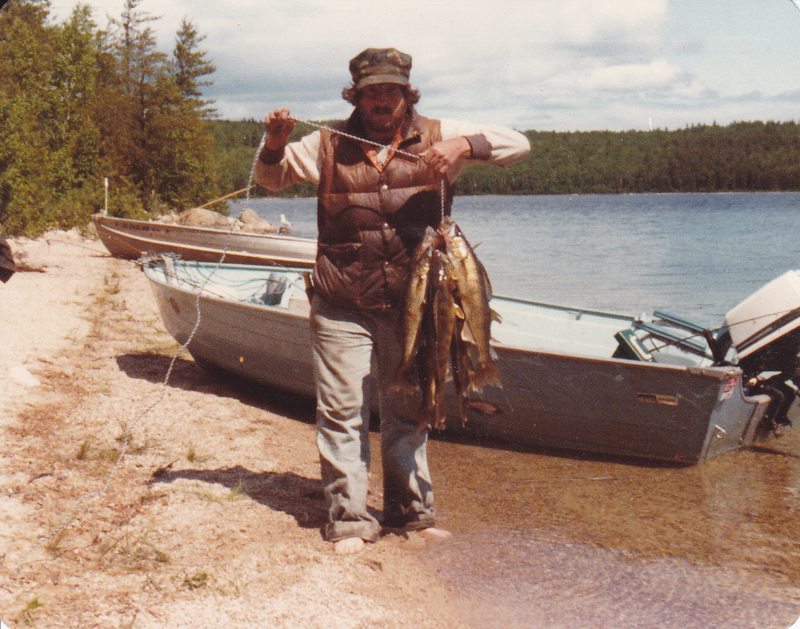 My buddy Mike with a nice stringer of walleye’s we caught in White Otter Lake in Ontario Canada. We camped on a peninsula on a large island. My brother with some nice lake trout we caught right off shore with frozen smelt on a slip sinker rig. Casting off shore on a small island we had shore lunch on. 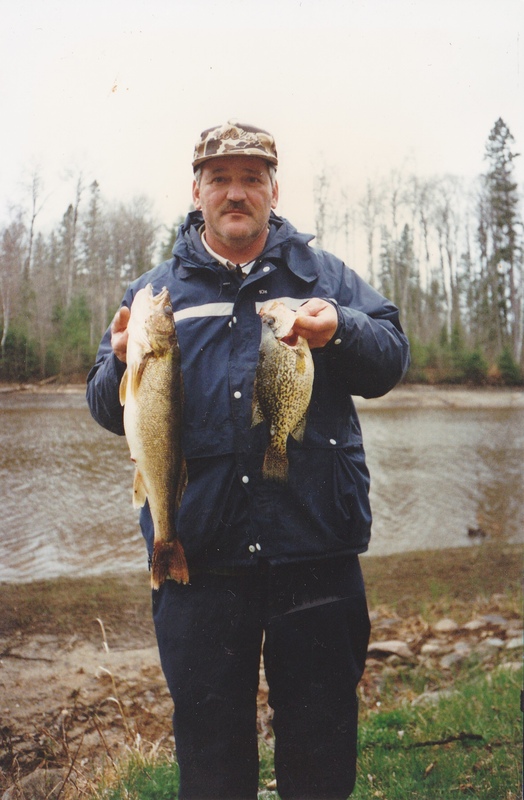 A friend of mine of many years ago with a nice stringer of walleye’s we caught in Caddott Lake near Two Harbors Minn. We caught these on plain Canadian Minnow Jigs [if anyone remembers them]. Never tipped them with anything, but they worked. Cleaning some pike and walleye’s on a lake we dragged the 14 foot Sears Boat and the 15 horse Evinrude Motor almost a mile to get to. The lake was full of pike and walleye’s. This lake was in Canada and had no name that we knew of at the time. This was in the late 70’s. 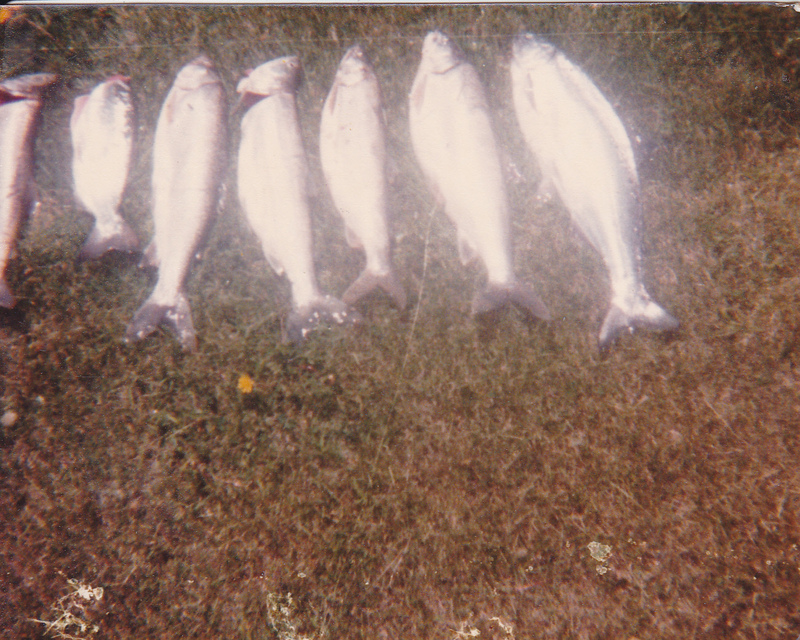 Here were the fish all lined up prior to cleaning. Pike like these were common on this lake. Only been here one time because it was hard to get to. 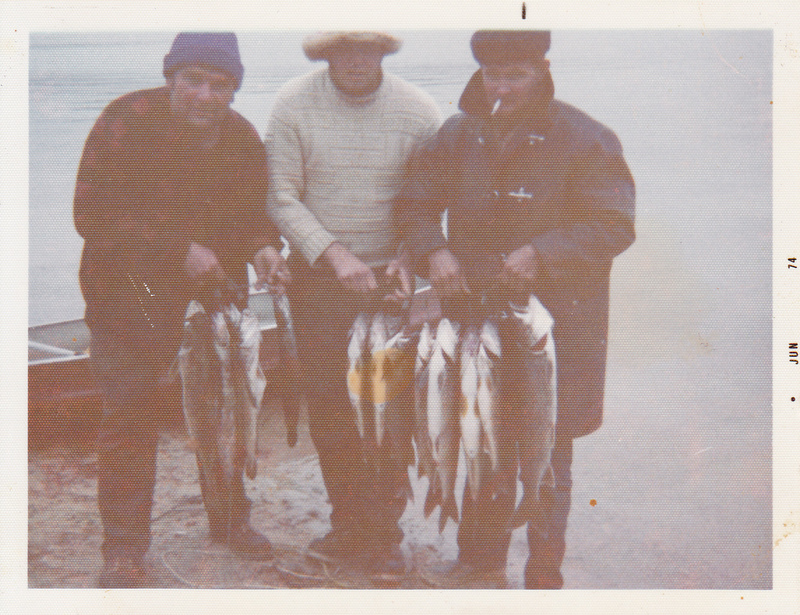 Back in the late 70’s with a nice laker caught off shore with frozen smelt. From the left, my dad, my niece, my oldest daughter, and myself. Here are some lakers we caught when we portaged into a small lake called Emery Lake. 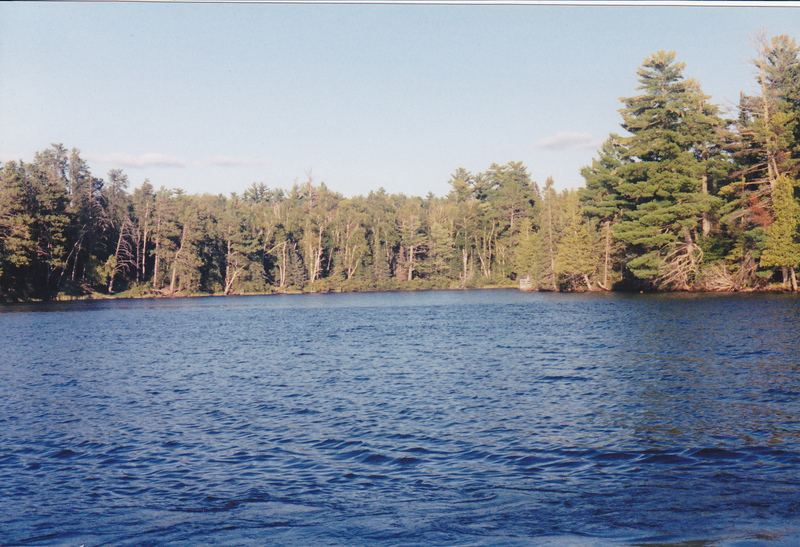 We portaged from White Otter Lake in Ontario Canada to get to this little very deep lake. These lakers were caught trolling spoons near the surface of the lake. 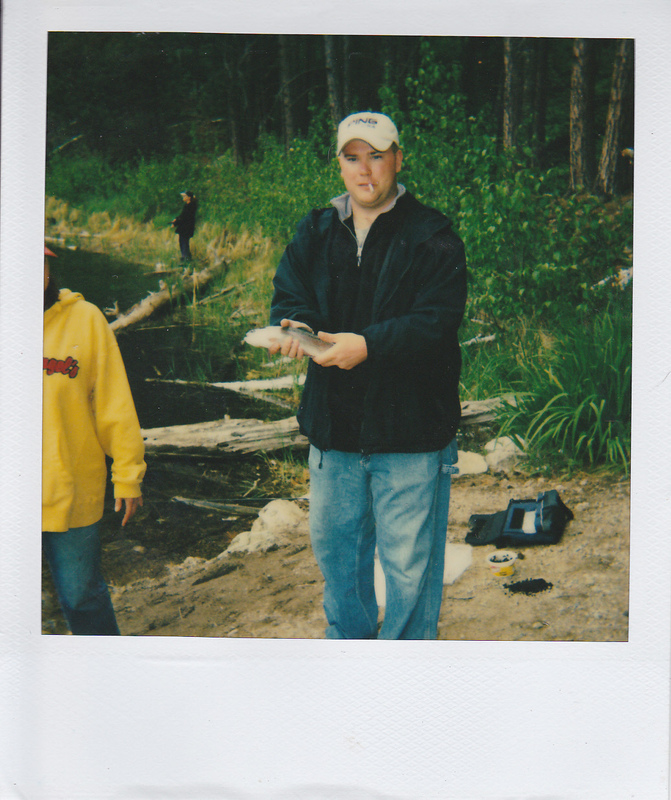 My son-in-law Clay, with a eater rainbow trout he caught within Bear Head Lake State Park. 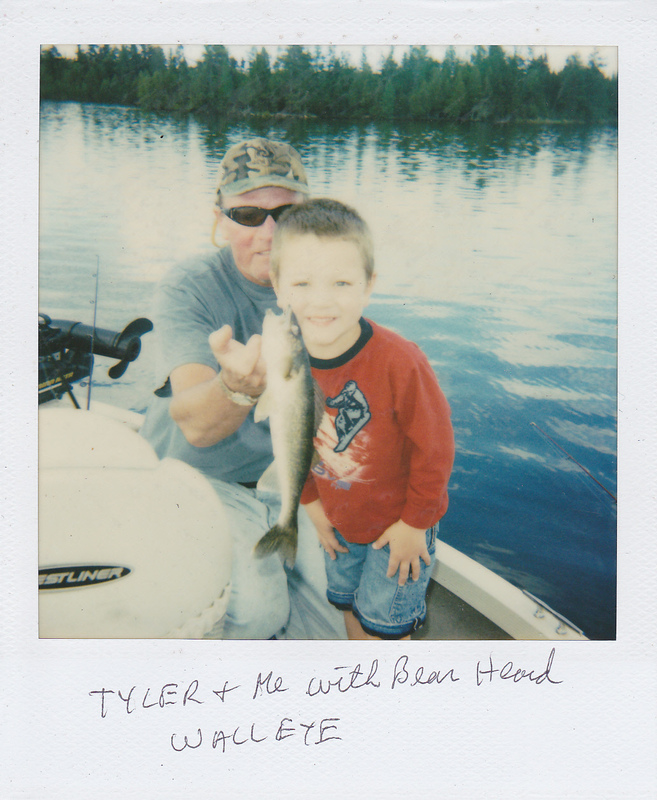 I had to help my grandson Tyler with a larger fish here. 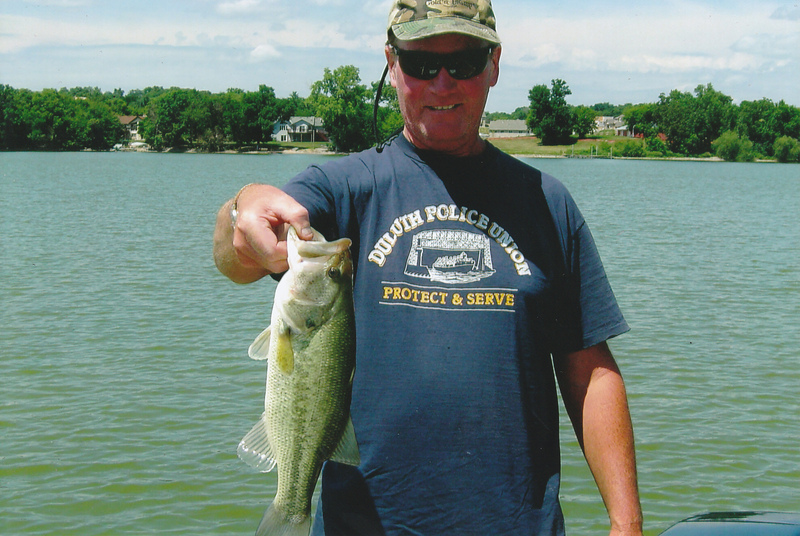 Turned out to be a Largemouth Bass over 5 pounds. We were fishing for walleye’s when the bass took the leech. Bearhead State Park. 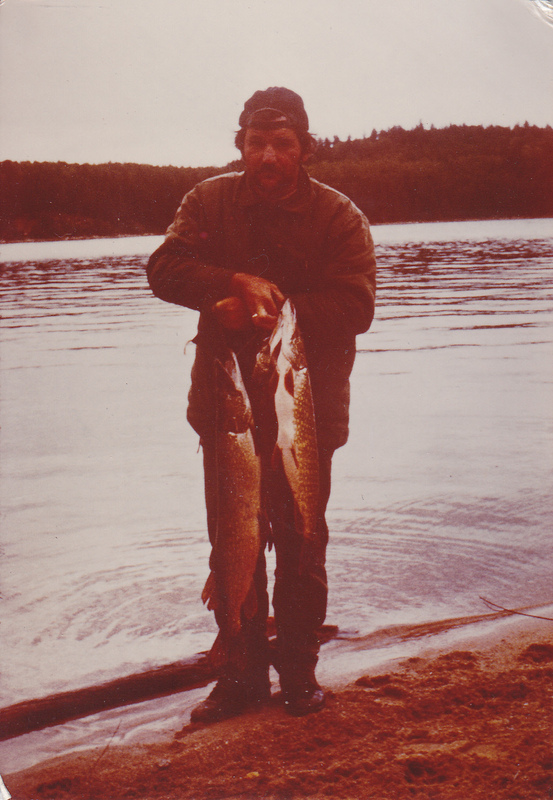 We caught these lakers off shore on Clearwater Lake off the Gunflint Trail on frozen smelt with a slip sinker rig back in the late 70’s. 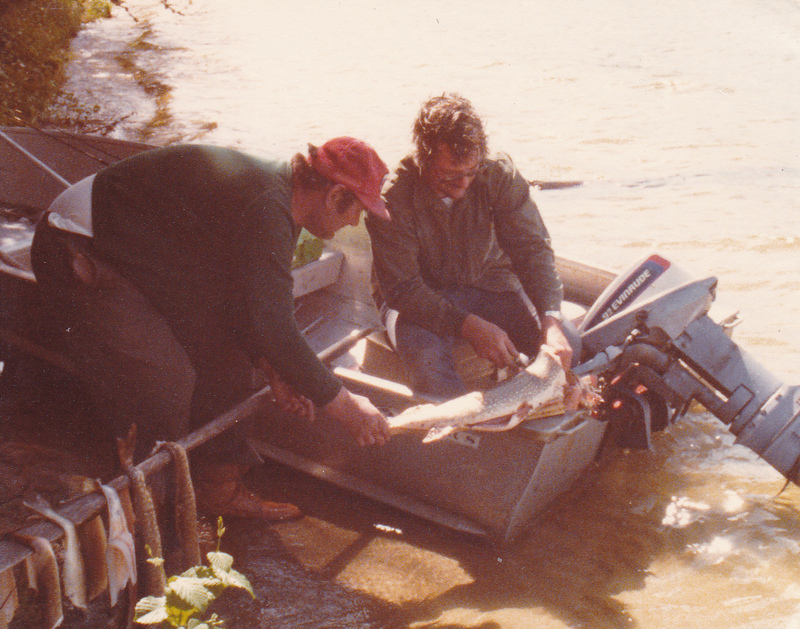 We portaged into a small lake with this canoe back in the 70’s in search of walleye’s and smallmouth. My brother with some nice pike from the beautiful waters from upnorth. Early and late in the year is when you find the big gators shallow and hungry. 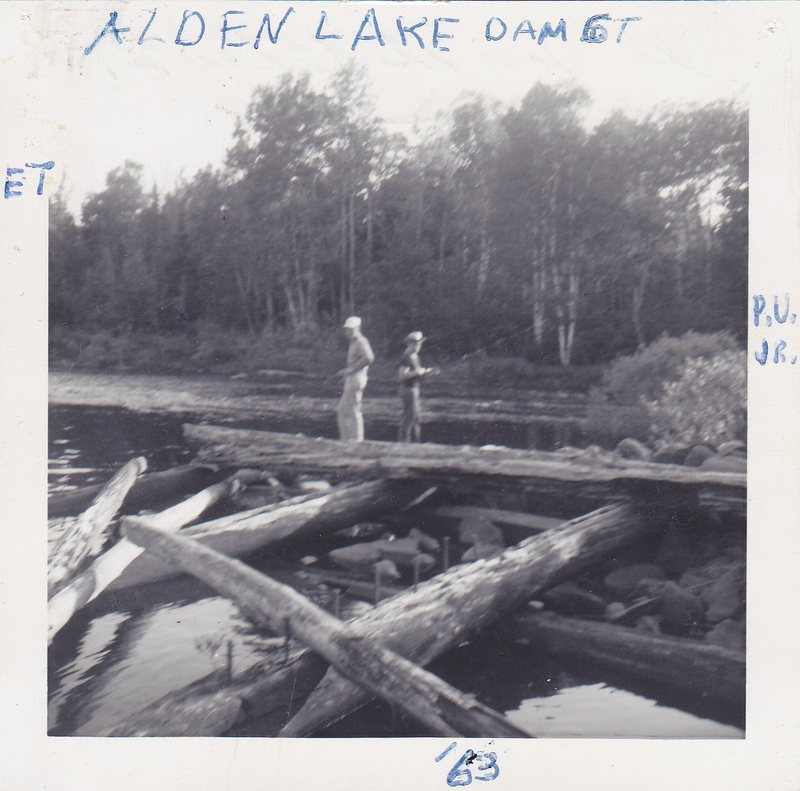 Many years ago  my brother and I fished at the outlet of Alden Lake north of Duluth Minn. Realy like to go back there again. 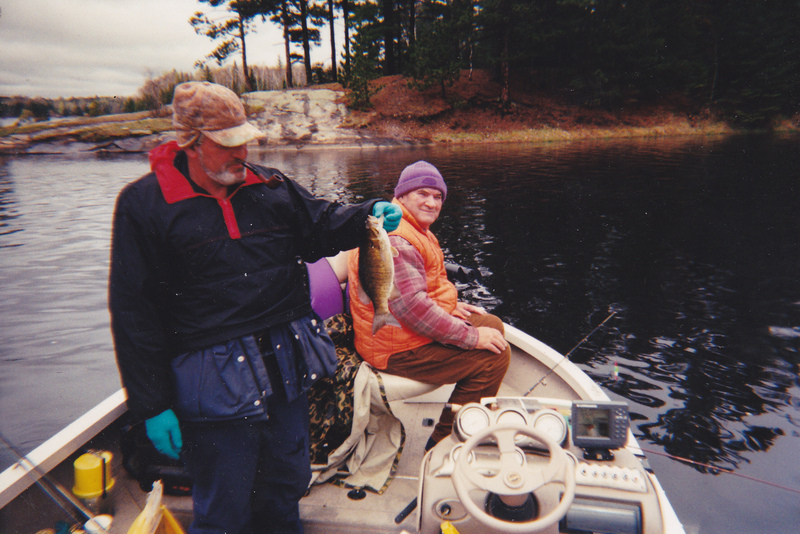 We caught walleye’s and panfish here with simple tackle. Casting spinners and using nightcrawlers. I dont know of anyone who uses nightcrawlers these days for steelhead on the northshore. However this guy did use a nightcrawler here in the Knife River just below the barrier wire to get this nice steelhead. Now it’s pretty much spawn bags or spawn bags with a touch of yarn that’s most commonly used. I still remember this day. There was a big run with the silver bullets. I saw many jump the falls past the barrier. Love dragging a frog imitation over cover like these pads. 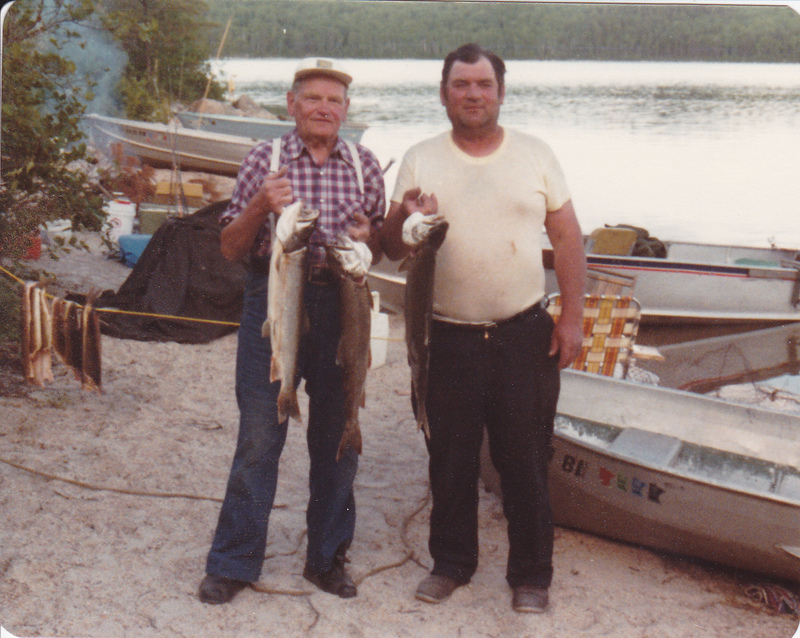 My grandfather from Germany [on the left] with my dad holding some nice lakers we caught up in Canada…Notice the walleye fillets [skin on] to the left of the pic hanging on the rope. 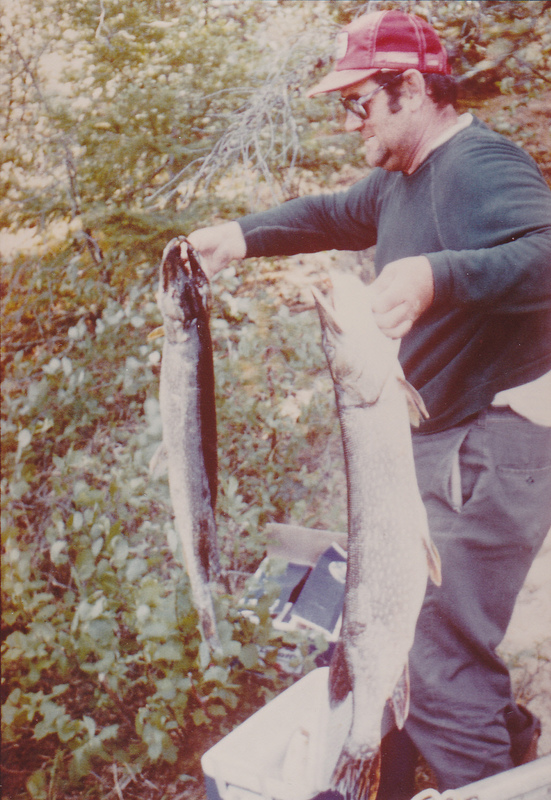 My dad bringing down some nice pike to be cleaned before we left to go home. 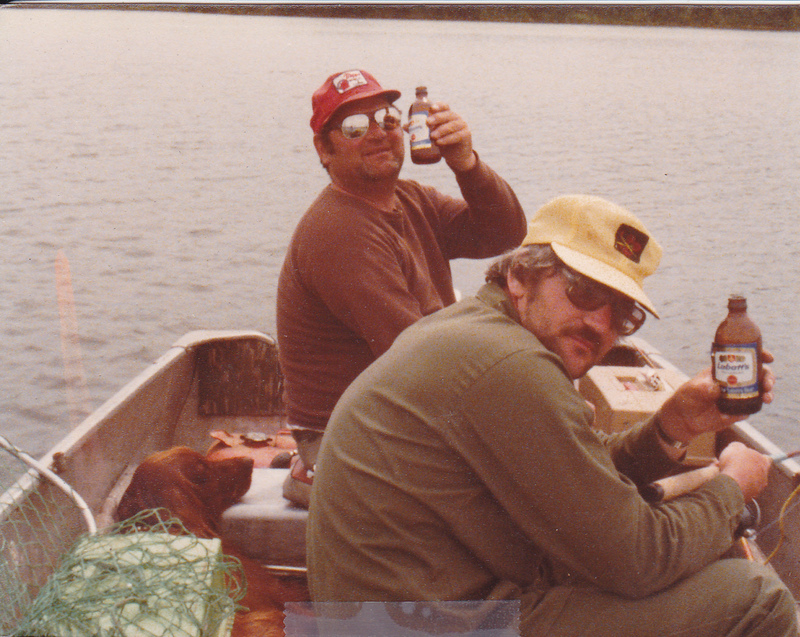 Relaxing in our old 14 foot Sears boat with some cold Canadian beers. Our dog Ralph loved being out with us. We could not drag our grandson away from the boat landing at Clubhouse Lake near Marcell Minn. He finaly walked out on the ramp far enough and slipped and got wet head to toe, so then we went home. Speaking of Clubhouse Lake, this lake has some nice smallmouth in it. This day we caught four smallies that were over 4 pounds. This was in the early 80’s. Whiteface Reservoir has a nice campground and this nice beach for the kids. I have caught walleye’s to the right of the buoys while watching the kids in the water. It’s a stained lake so daytime can be a good time to fish. Nice Pike caught while fishing for lakers off bottom on a smelt. 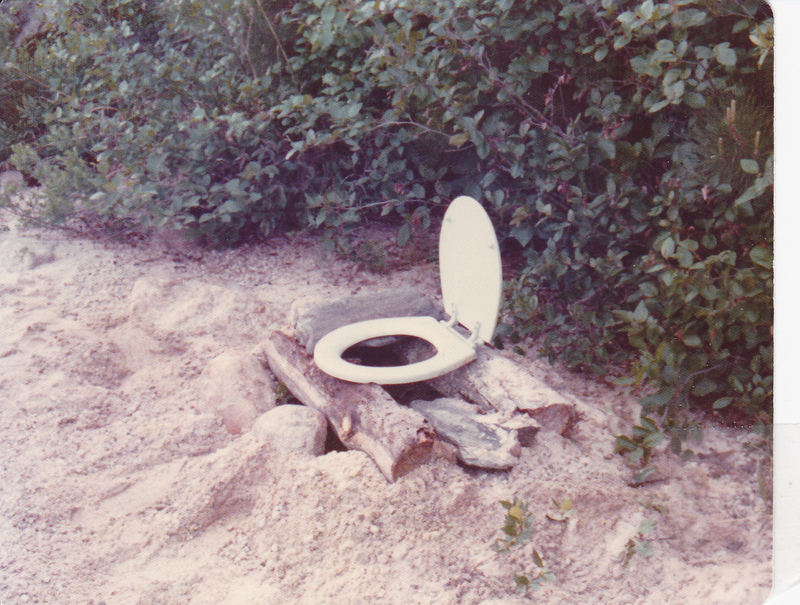 Our away from home toilet. Dug a good size hole with a toilet seat supported by some wood. 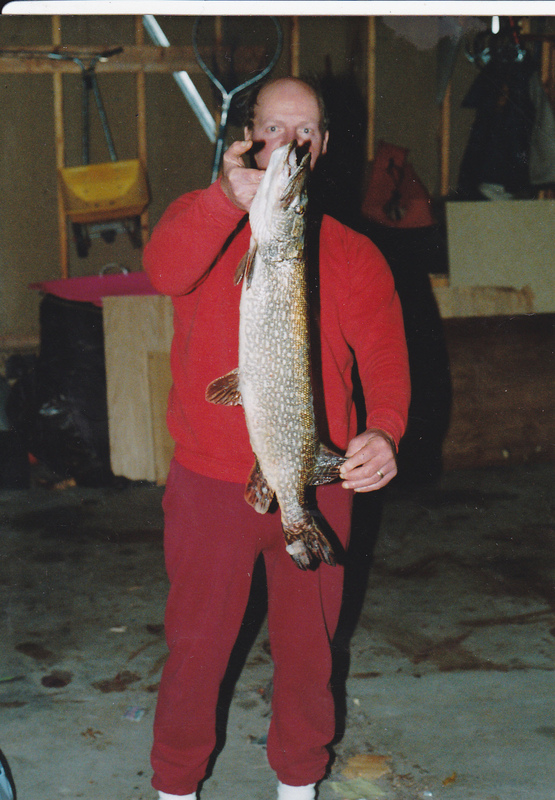 Got this pike while on hard water in Mille Lacs back in 93 fishing for walleye’s and perch. Caught this laker off shore with a frozen smelt off bottom. 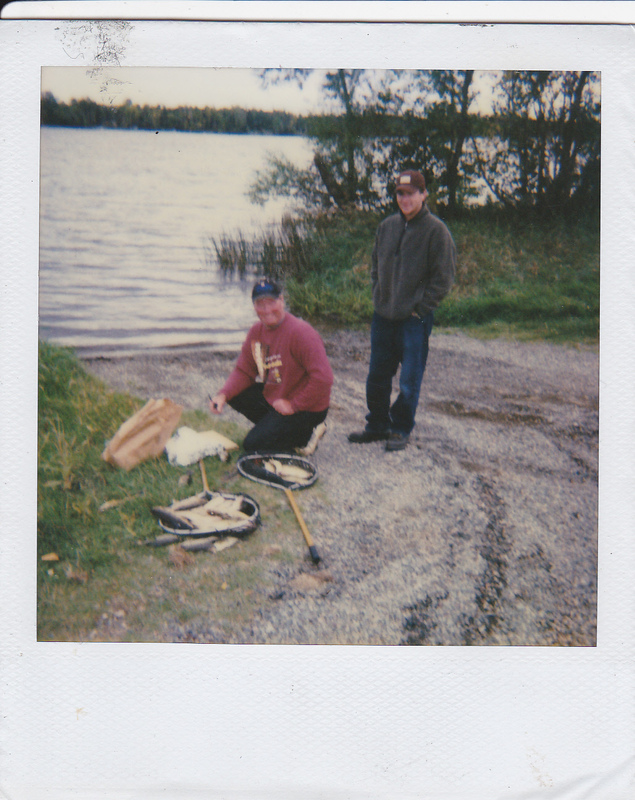 My brother [on the right] and myself years ago with a stringer of lakers caught trolling with spoons near the surface on a small lake we portaged into. Put a five gallon bucket full of water in front of the canoe to stabilize the weight better while fishing the slop for largmouth. Caught a few big walleye’s in my “secret” lake up north. All of the large walleye’s are released. This lake has a small dirt back in landing and I have yet to see another angler fish this lake when i’m there. There are a few cabins on the lake. Here is a 31 inch walleye I caught post spawn. She gave new life to this lake and went back to hopefully spawn again. 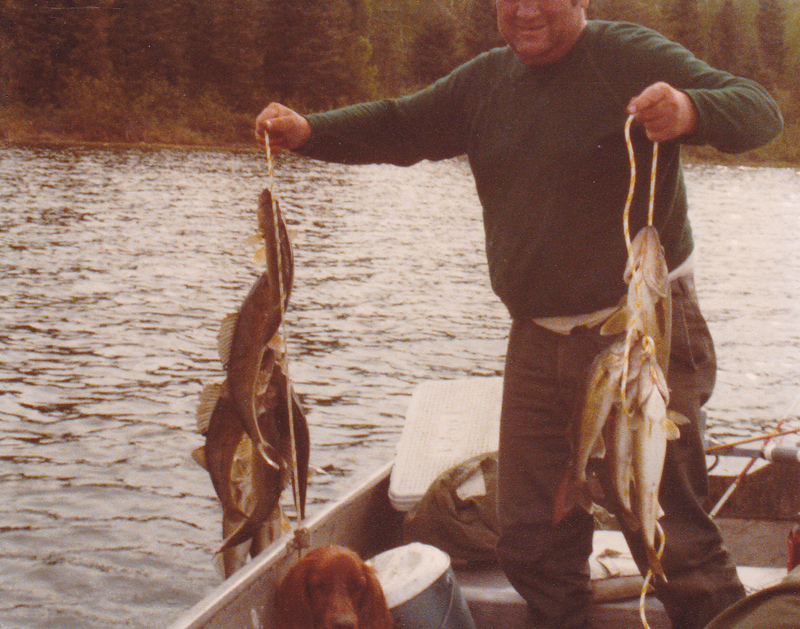 My dad holding up a couple of stringers of walleye’s we caught on a lake we portaged into years ago back in the late 70’s. We camped there for a long weekend and released all the many walleye’s we caught except a few for shorelunch. These we had no problem getting in the morning of the day we left for home and took these with us. An old pic that never get’s old. 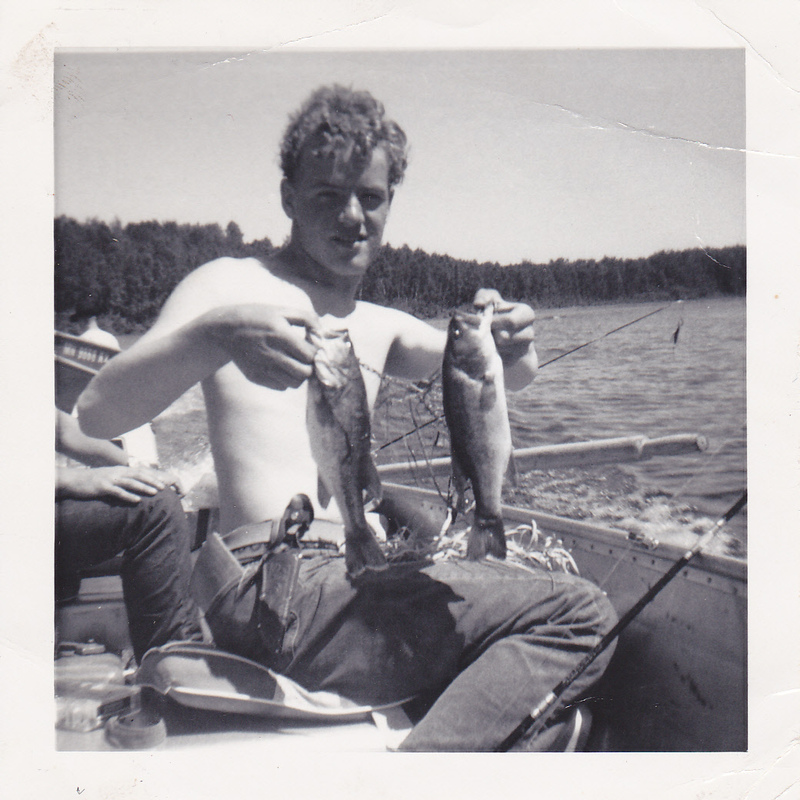 Back in 1965 when we camped on Caddott Lake near Two Harbors Mn. 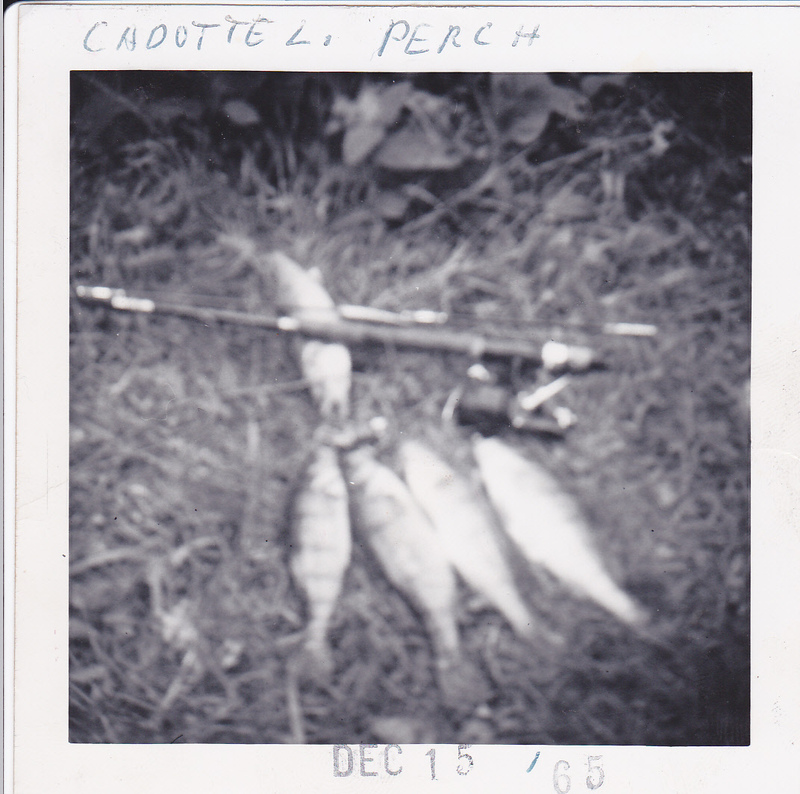 You can see the size of the perch were pretty decent. Still perch like this in there along with walleye’s. 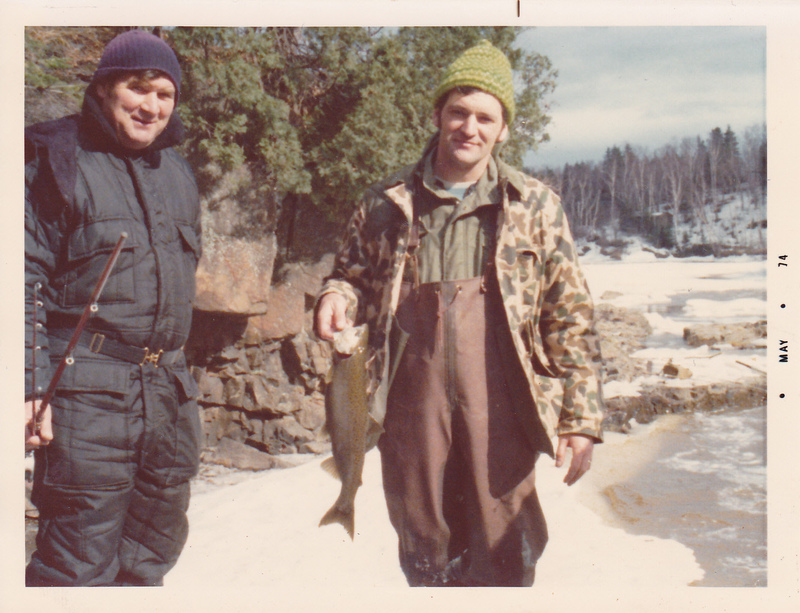 This was back in the late 70’s on the North Shore of Lake Superior fishing for steelhead in open water we could find. Very seldom do we catch salmon in the spring fishing for steelhead but this was a rare moment. My brother got it on a spawn bag. 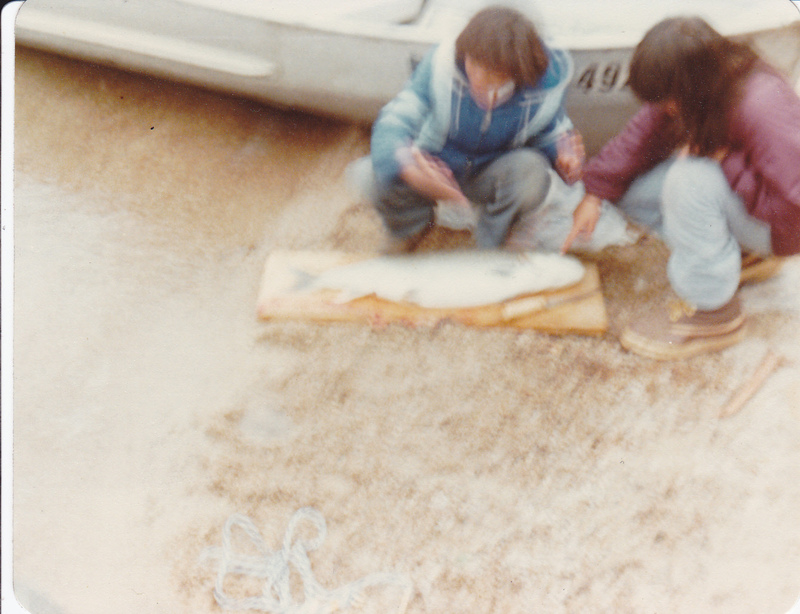 It was a small coho. Proud moment for my brother back in 1988. 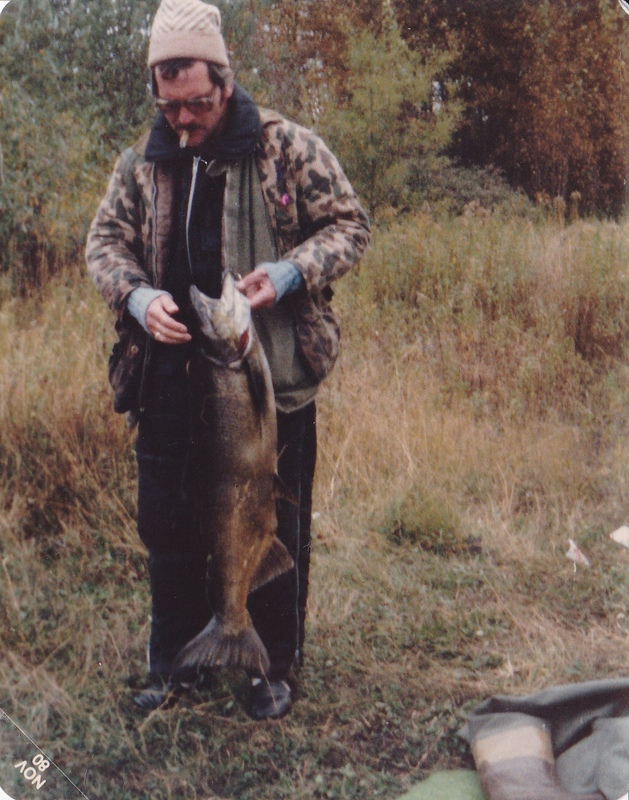 He caught this former state record king salmon that fall. He dragged it around for most of the day and the big salmon lost a lot of eggs in the process. Still would have been the state record today if he had it weighed right after he caught it. He got it mounted and is hanging on his wall at home. My friend Mike, cleaning some walleye’s and crappies after a good day up north. 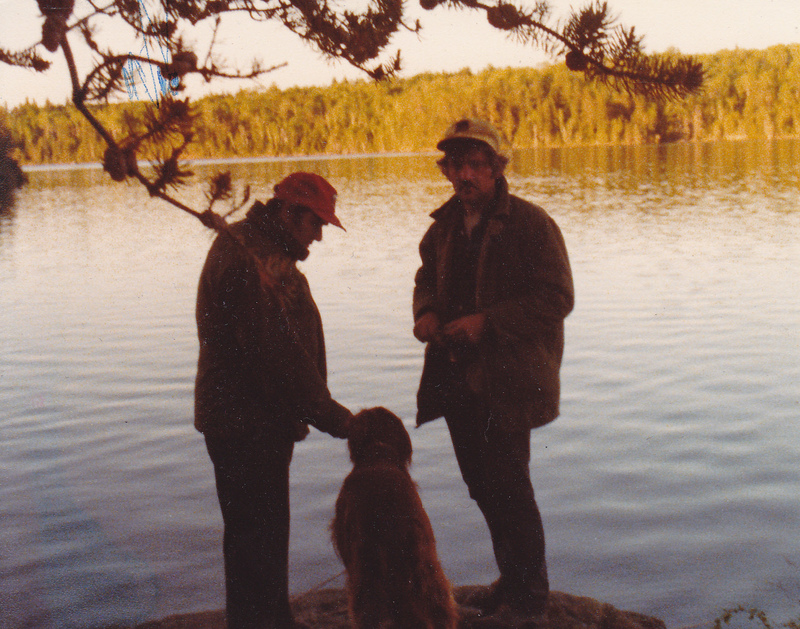 My dad , Ralph our dog, and my brother stand on shore watching the lines we have out for lake trout many years ago. 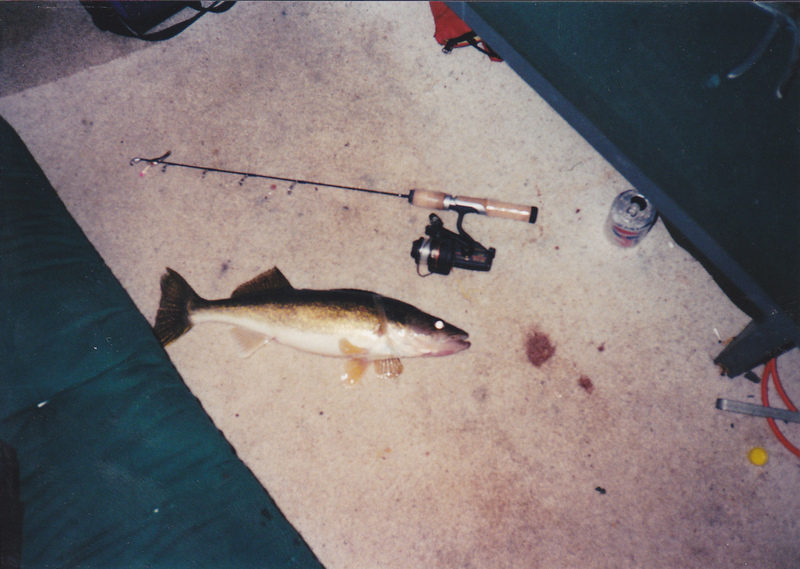 Here we caught walleye’s early and late in the day. Guess you can call it a honey hole. This is on Crooked Lake near Isabella Minnesota. We had two musky’s attack our stringers which had some walleye’s on it here as well. Getting ready to fishing for the afternoon on White Iron Lake near Ely. 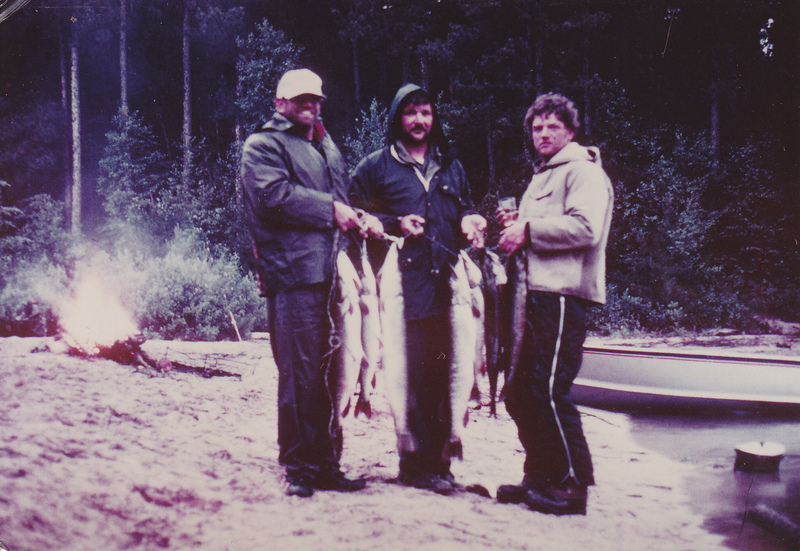 Nice stringer of lake trout from up north caught trolling. The lakers were near the surface in the top 20 feet or so with the water being cold. 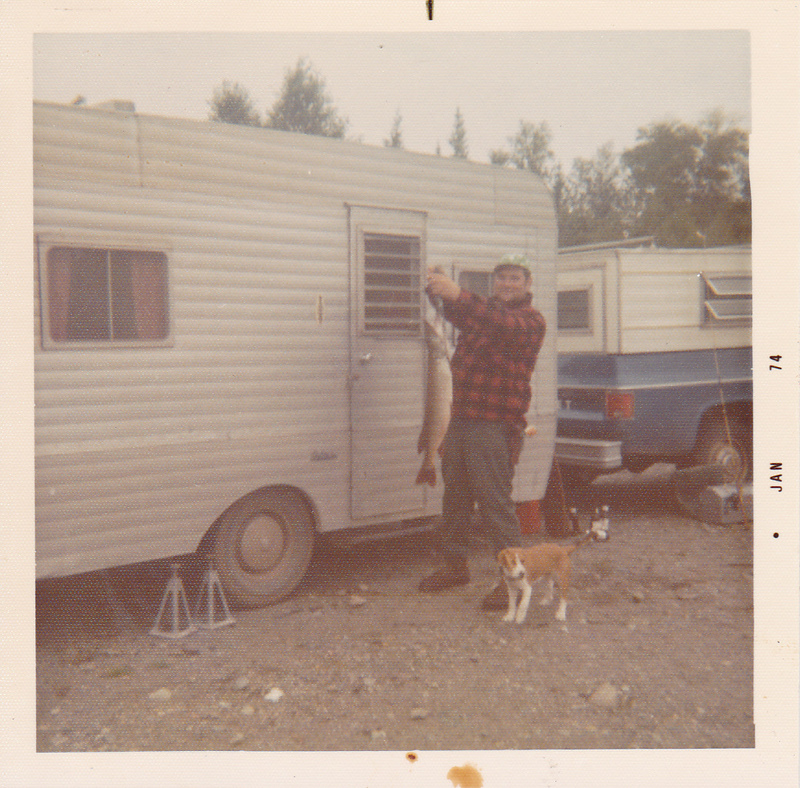 My dad with our Rolite camper with a nice pike. We were camping near Lake Isabella near Isabella Minnesota. Two bottle bass, one a Canadian and one a smallmouth. 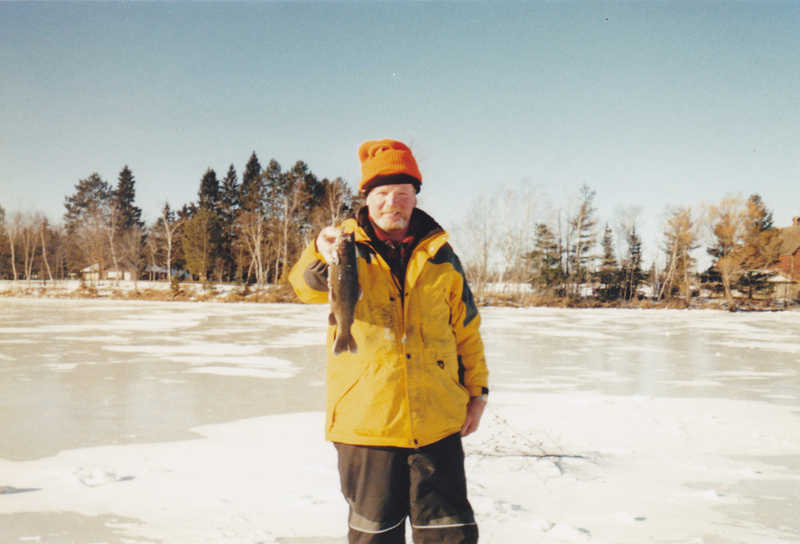 Many years ago on Dumbell lake near Isabella Minnesota. 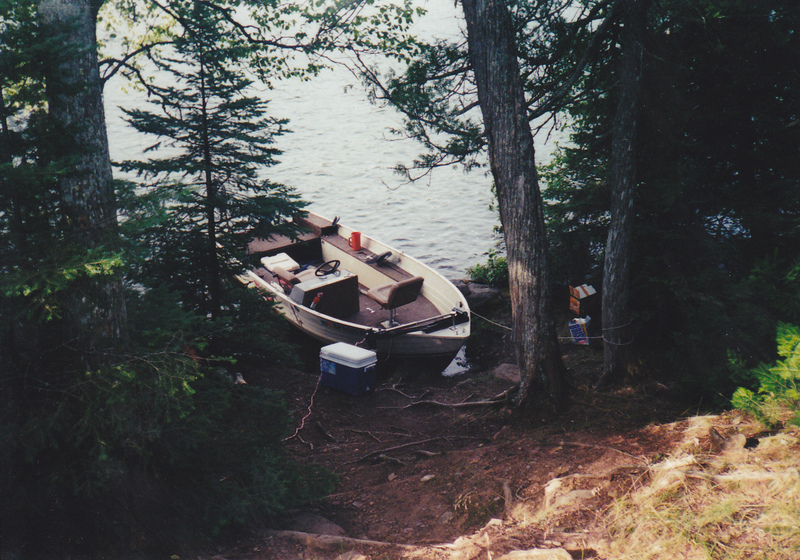 Here we just got done carrying our trusty 14 foot boat back from a rough portage from Emery Lake back to White Otter Lake where we had set up camp. 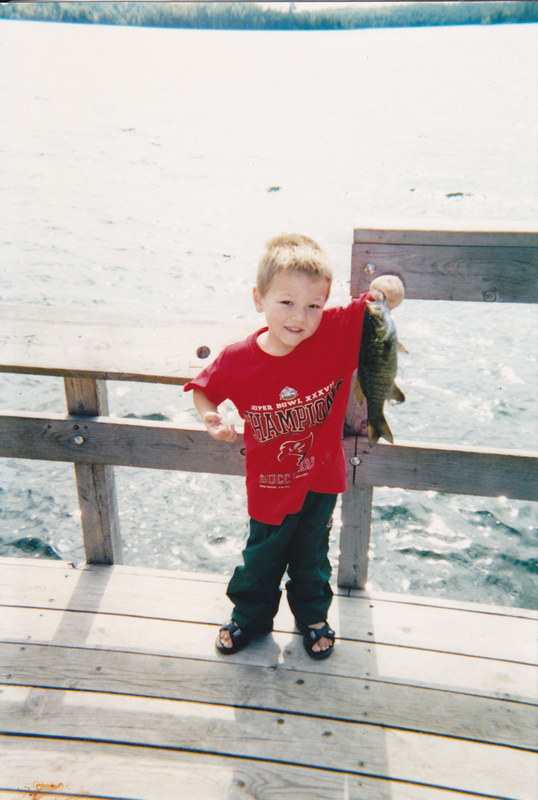 My grandson a few years ago with a smallmouth from Clubhouse Lake near Marcell Minnesota. Stringers of walleye’s are always nice to look at. Some lake trout and salmon from Lake Superior. There were caught in June out of Superior entry near the surface trolling with spoons and stick baits. 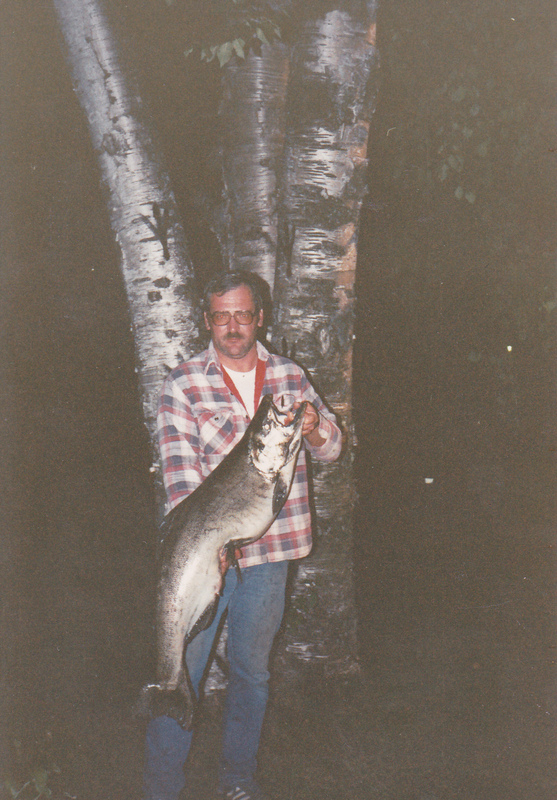 The good old days when we had some big king salmon make fall runs up the north shore streams. 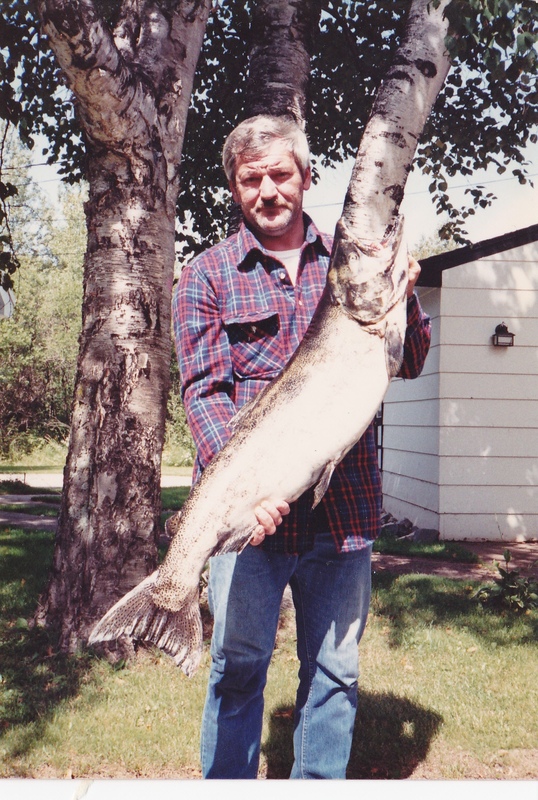 Didn’t always get big one’s like this king but we got into some. 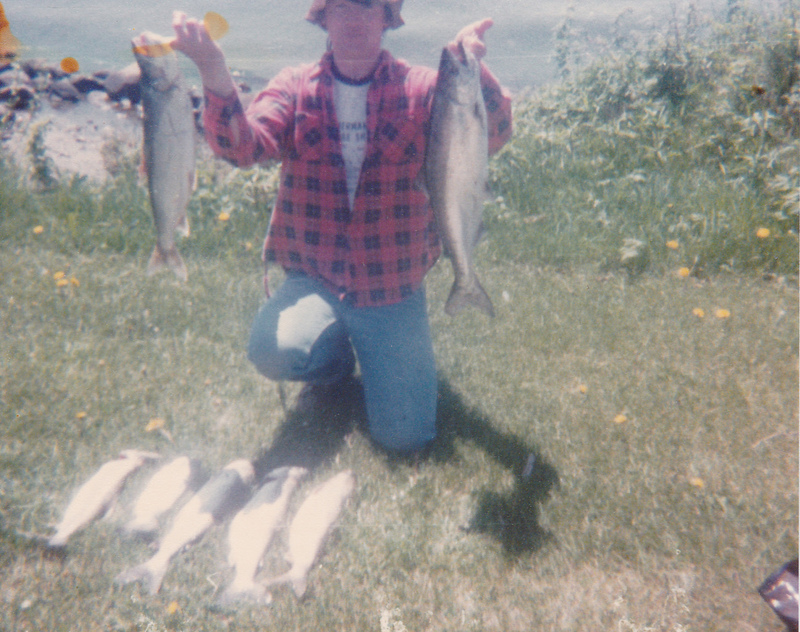 My younger days with lakers and salmon caught in Lake Superior trolling. 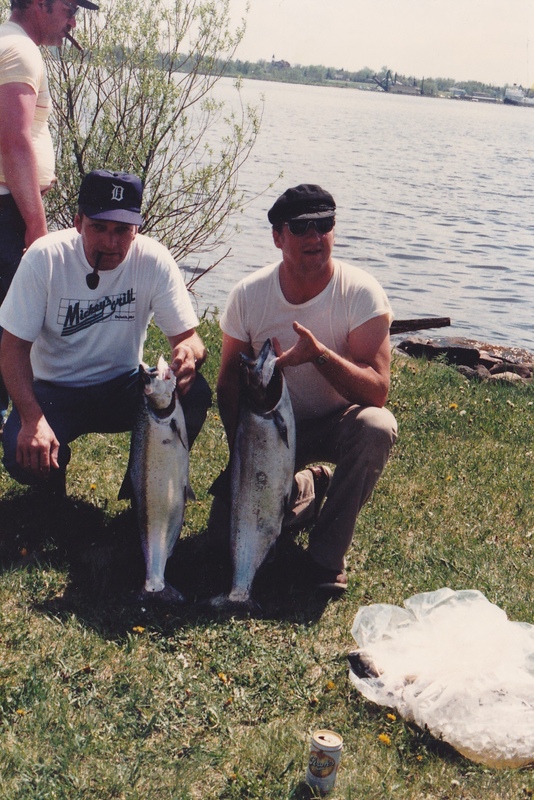 Couple of bigger king salmon we caught trolling in Lake Superior back in the days when we had the big one’s to catch. My brother with the biggest king salmon of the day. Anyone remember those old Coleman coolers? 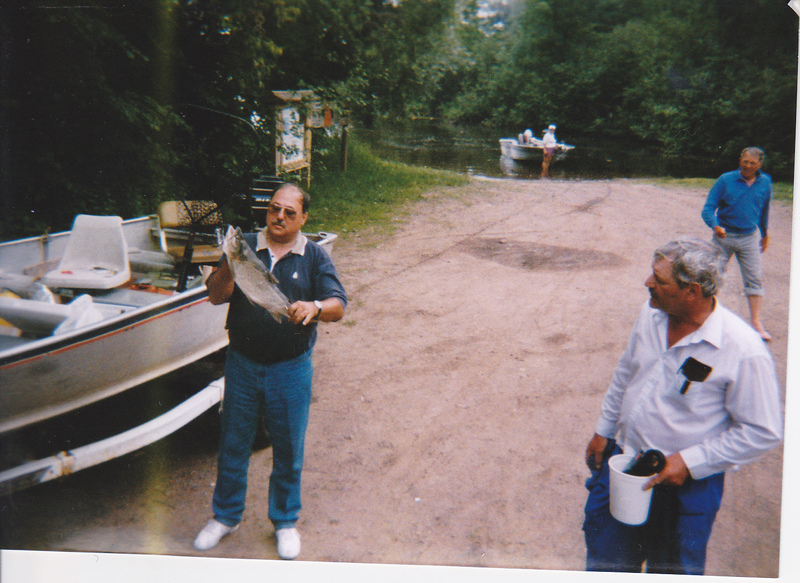 Here my brother is standing with a nice walleye and king salmon near the Park Point boat landing near Duluth on the harbor side. When it turn’s too windy out on the big lake, you can always go back in the harbor and fish for walleye’s. Couple of pictures of some of the scenery from some of the lakes in the Arrowhead region. 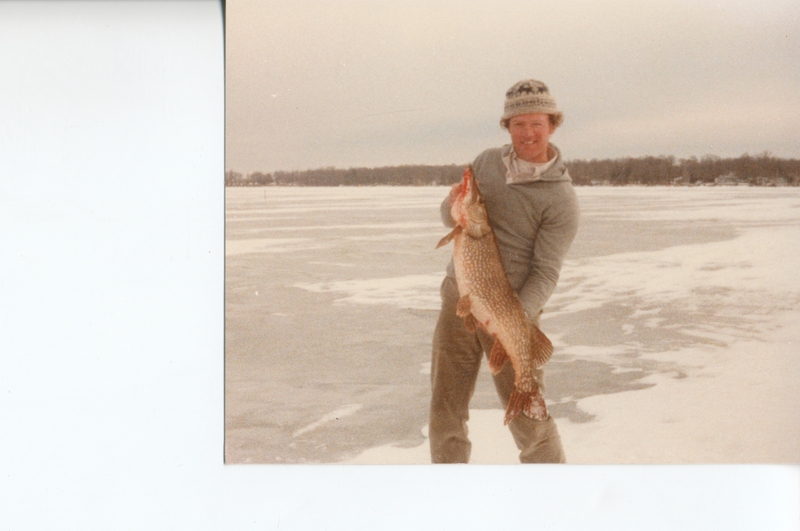 These are from Wilson Lake near Isabella Mn. 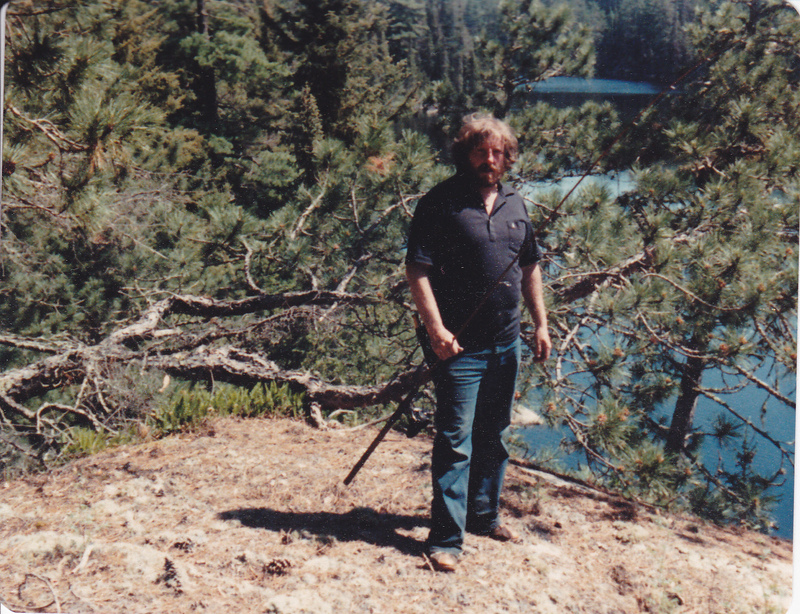 My friend Mike standing on a hill, overlooking a small lake we noticed on a map with no name. So we went to check it out and found a lot of pike. We only threw spoons out there but that’s all we caught. The water was very bog stained and the pike were darker than normal. 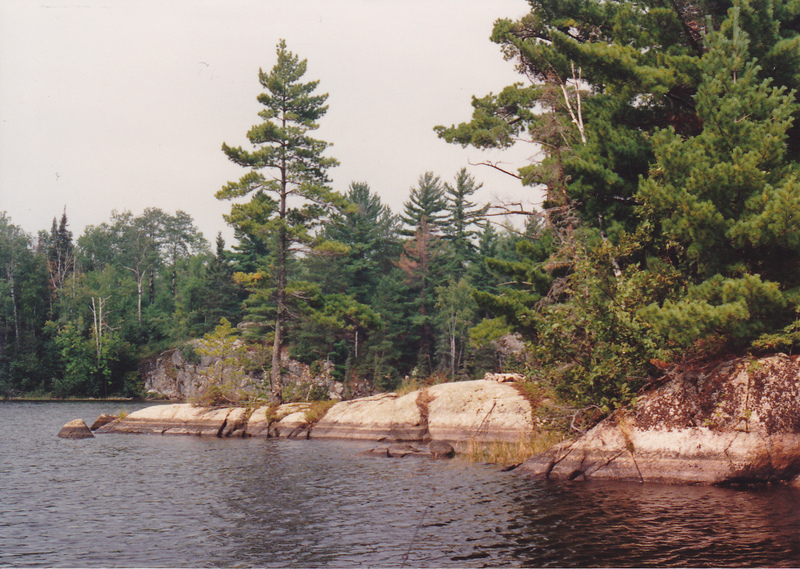 Very unusual lake, with rock cliff’s all around and very difficult to find a spot to fish from. Always wondered how deep that small lake was. 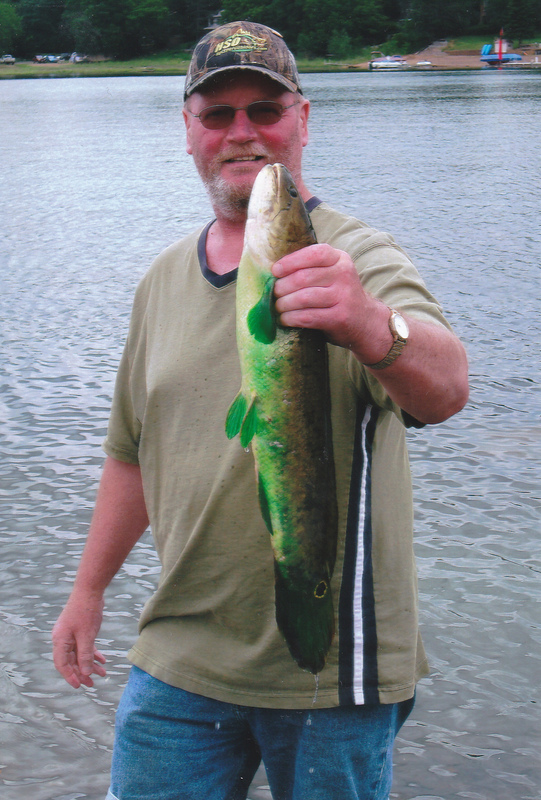 Love to fish steelhead and loopers [Kamloops] in the spring when they make their spawning run. 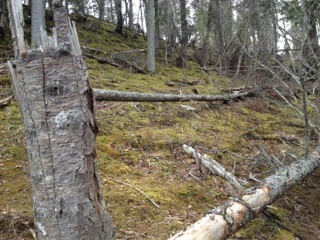 This was by the “green” hole in the Knife River by the North Shore. Nice crappies where the Cloquet River enters Island Lake near Duluth Minnesota. 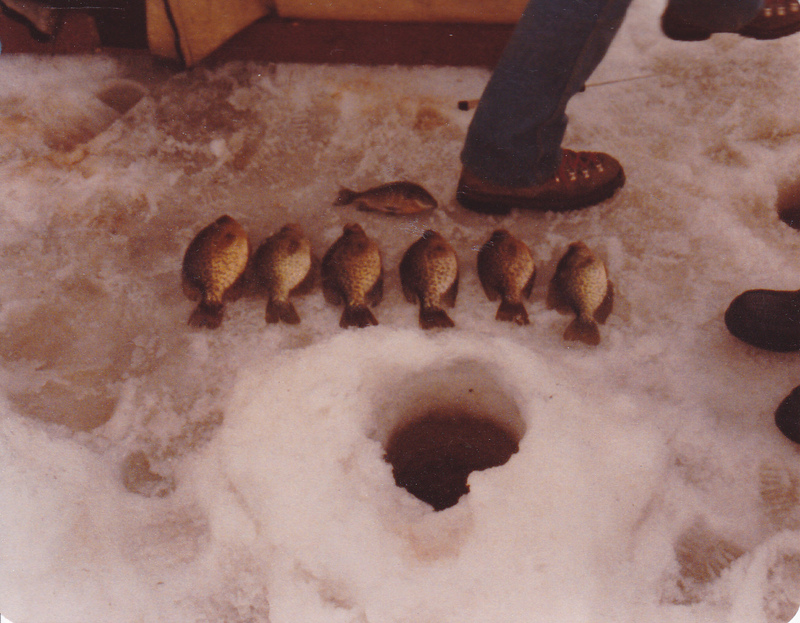 These crappies were caught in my little “secret” lake north of Duluth. We go here first ice. That’s when the fish here bite best [probably like any other lake]. Caught this colorful dogfish here in the metro in S. Linstrom Lake. Never seen one this green before. It looked like someone painted the colors on the fish but it was just from the algae bloom near shore where it prowled. 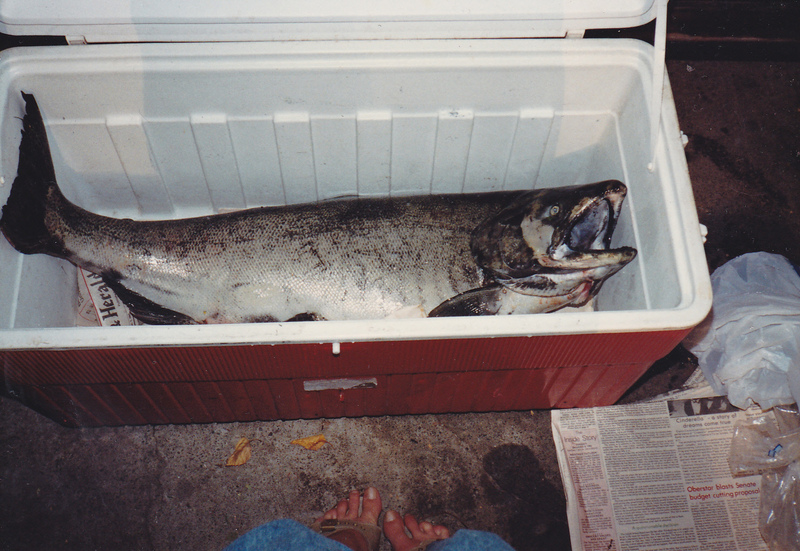 My brothers big King salmon from the North Shore in the late 80’s. 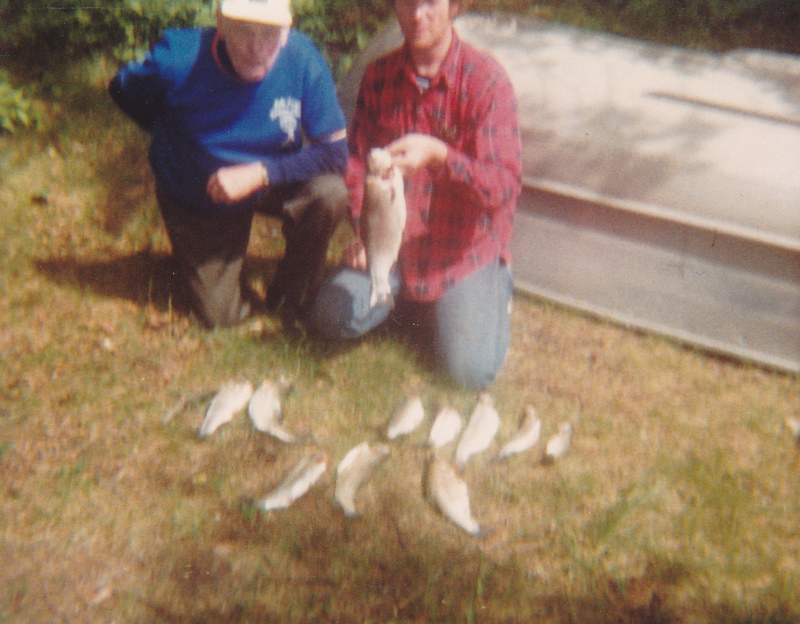 Walleye’s and perch from Cove Bay on Mille Lacs from the good old day’s. These were caught trolling crawler harness’s slowly in the bay. 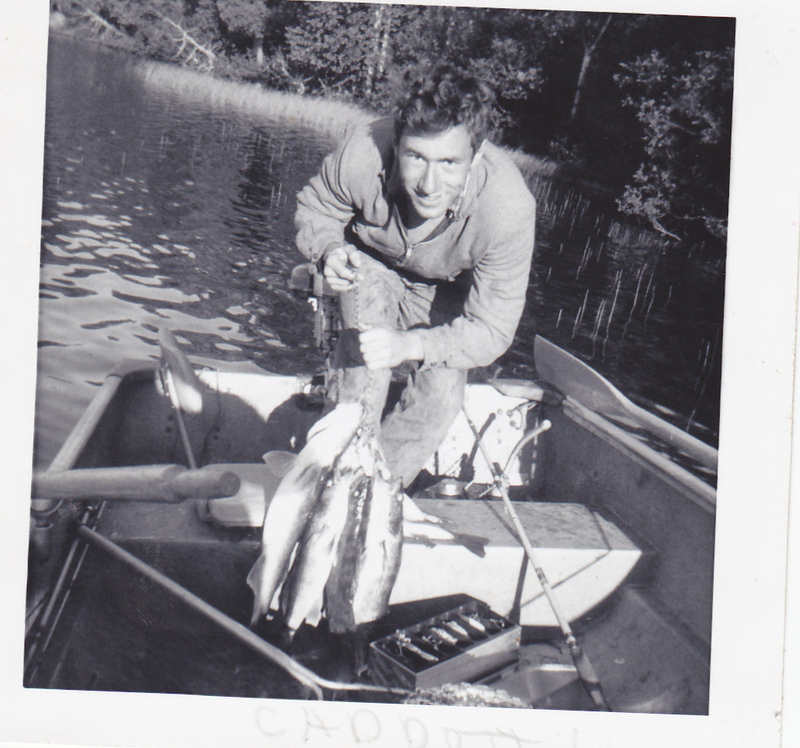 Old picture of some good sized tullibees from Lake Kabetogama back in the fall of the 1960’s. 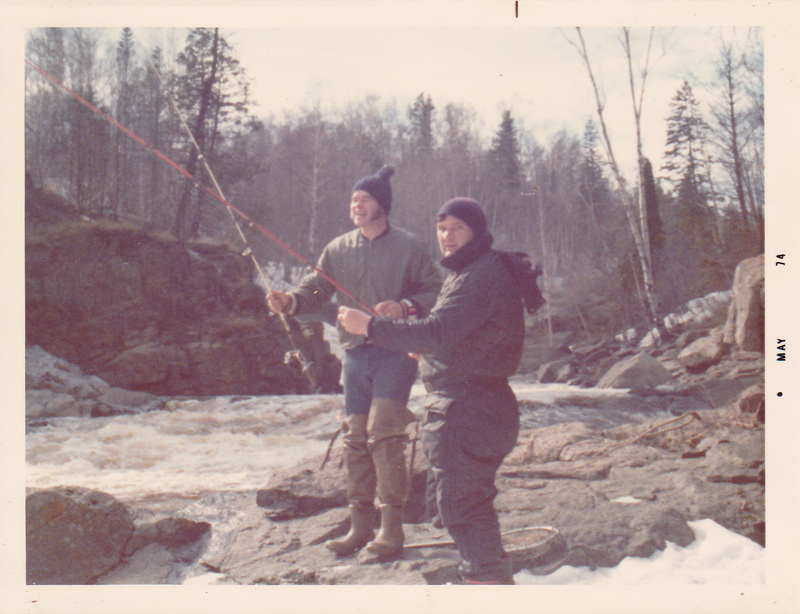 Fishing for steelhead back in 1974 on the North Shore. 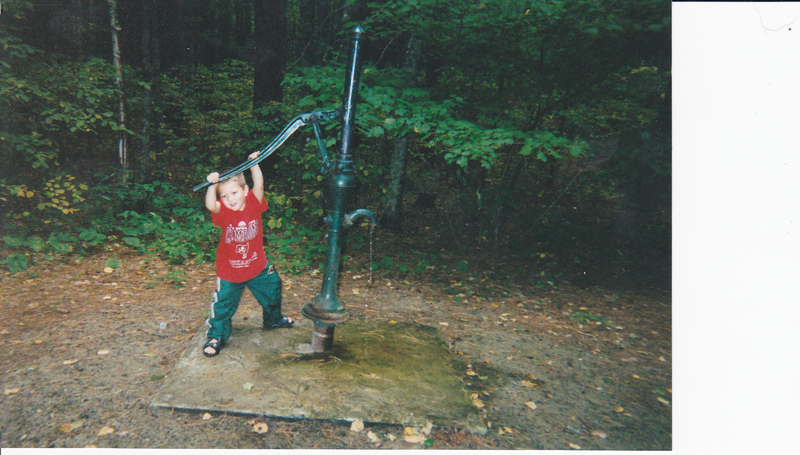 My grandson a few years ago finaly getting some water from the pump at Clubhouse Lake near Marcell Minn. Have to say the water from that pump was the best water I have ever had outside of some springs I found while trout fishing in the upper reaches of the streams on the North Shore. Walleye’s ready to be cleaned up and iced down to head home. That beer was so good I had to take a picture of it. Nice Pike I brought home. Cut the pike in steaks and put it in a brine and smoked it like salmon. very tasty. You can see the blood spots on the garage floor in the background from processing deer for years. Good soak and mop and it came off just fine. My daughter and my brothers daughter, checking out the nice laker we pulled out from shore. 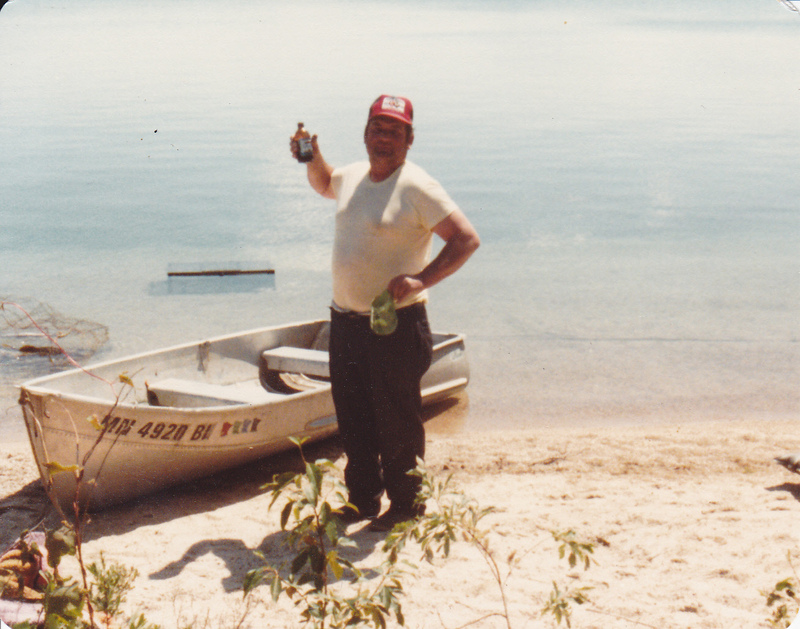 My dad enjoying a nice cold beer from a break from fishing. We put the coolers in the cold wet sand with just the top couple of inches on t he surface. We covered the cooler tops with some old wet towels to keep the beer and food cold. Just had to keep the blankets wet and we were good to go. Ash River which enters Sullivan Bay which is the gateway to Lake Kabetogoma and more. As the sun would go below the trees we would go on the shady side and walleye’s would show up like clockwork. Leeches under a slip bobber is all we needed. Couple of walleye fillets left to eat on my large pan made for shorelunch. I made fried potatoes along with the walleye. 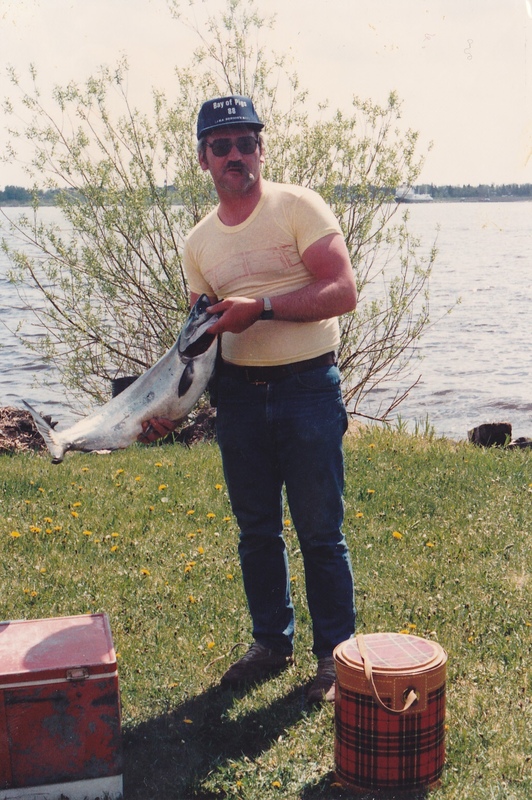 Another picture of my brother back in 1988 with a former state record King Salmon caught on the North Shore of Minnesota’s Lake Superior. Here is a good spot on the Talmadge River for Rainbow [loopers] and steelhead. 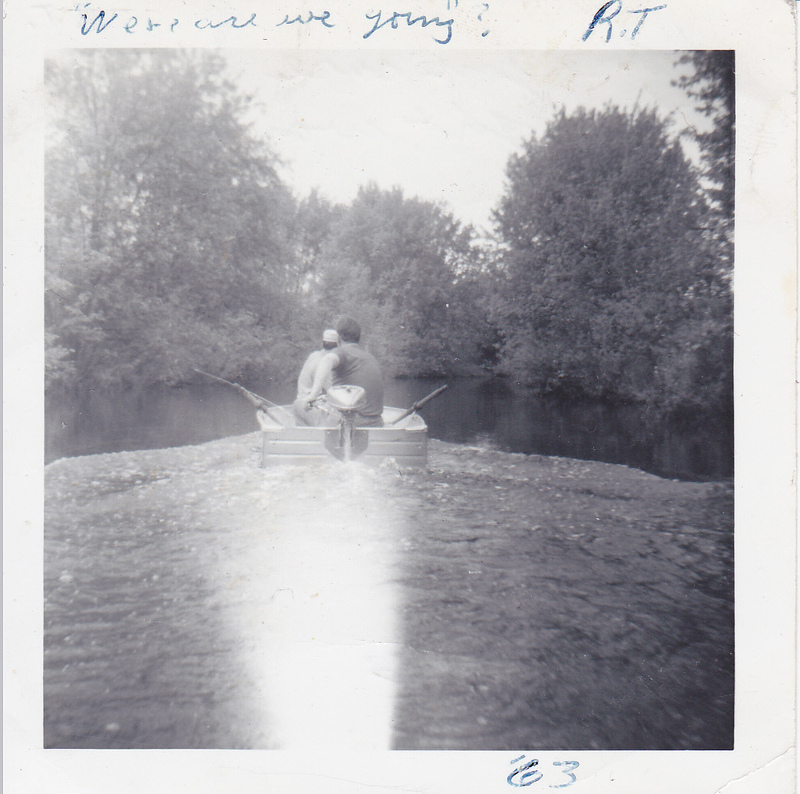 This was spring and the waters are high and cold. 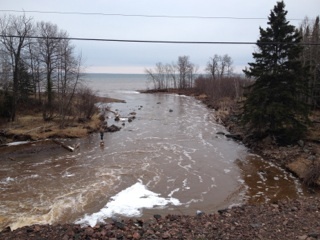 The popular area of Silver Creek on the north shore for steelhead and Loopers [rainbow] for the spring spawning run. On a cold spring day we are trying to figure out the next stream to try for loopers or steelhead. On the left is my friend Lee and on the right my brother Ed. 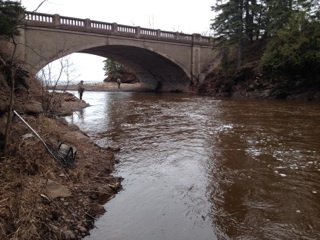 Fishing the Steward River north of Duluth near the bridge. The water was too high to get to our favorite spots. 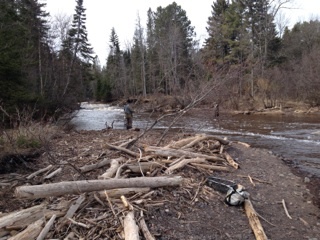 Looking upstream on the Steward River during the spring run of steelhead and loopers. Sucker River on the North Shore. 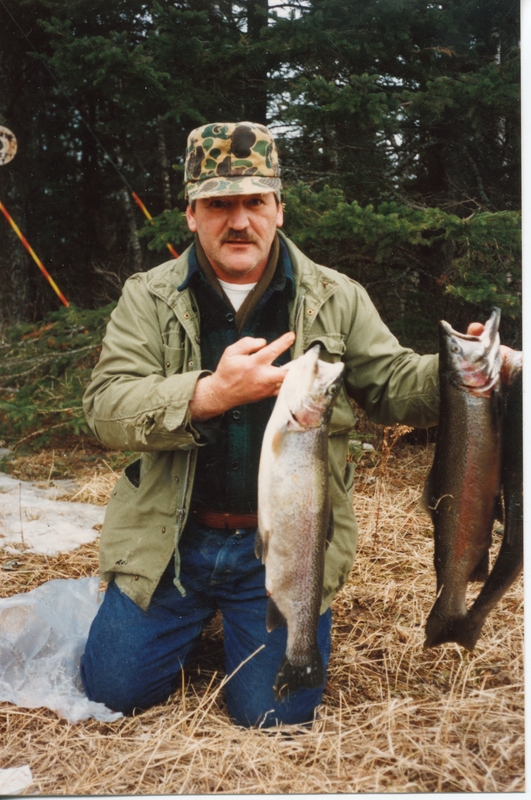 Always a producer of steelhead and loopers for us but not on this day. 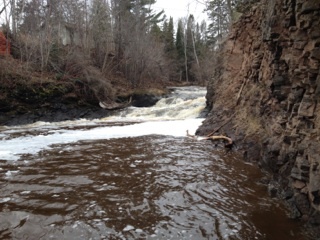 Another view of the Sucker River in the spring. We had a strong east wind this day fishing near the mouth of the Sucker River. It was cold with the wind blowing and we snuck upstream to get away from the wind. 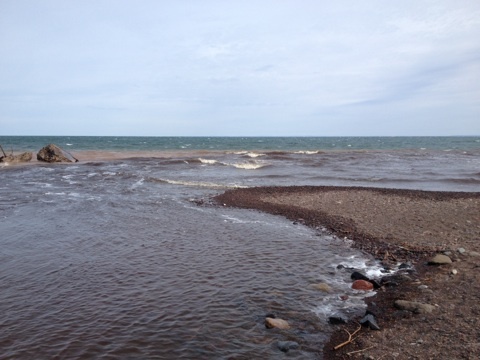 Near the mouth of the Sucker River there is a lot of drift wood blown in by many strong winds from the big lake, Lake Superior. 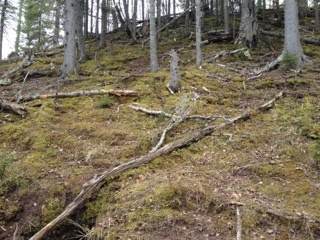 The green moss is showing up with the snow gone. A reminder of spring to show even more colors to come. 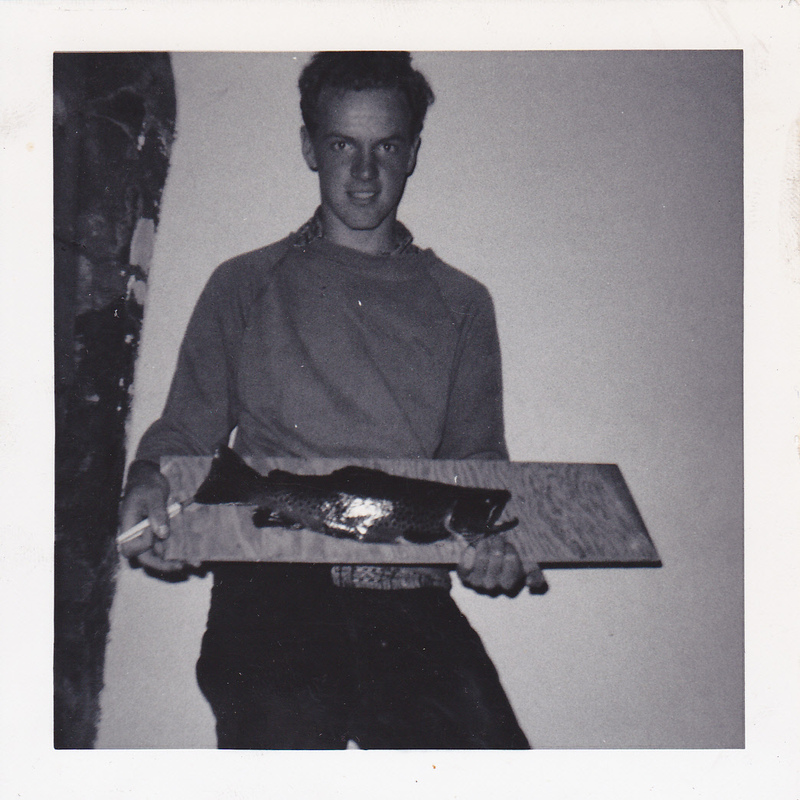 My brother with a very large brook trout he caught north of Grand Marais Minnesota. 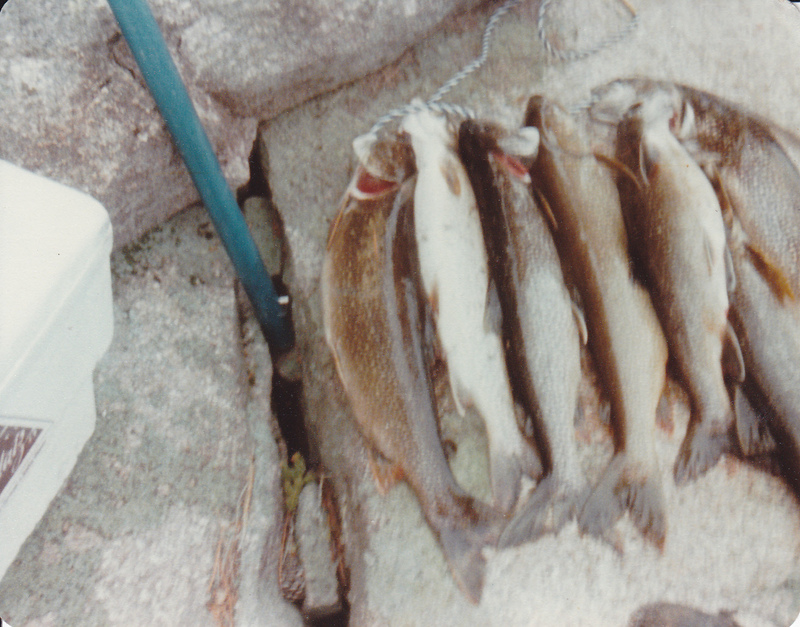 These brook trout are also known as Coasters. 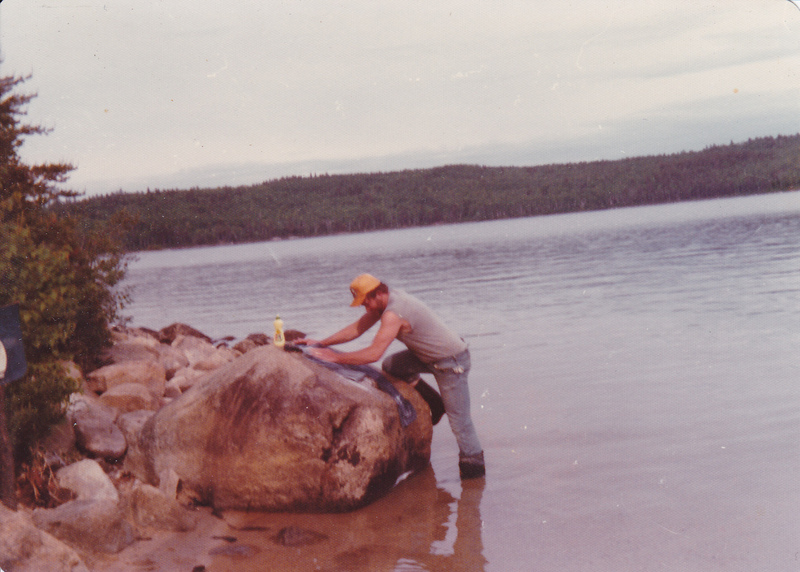 Coasters are lake run brook trout found in the upper North Shore streams and into Canada’s shores or Lake Superior. He caught the trophy fishing for steelhead on a spawn bag. The brook trout went 23 inches and 5 pounds. 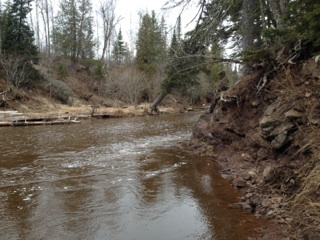 Here is the spot where Ed caught the large brook trout. More to come……………..
Love your site – I will be spending much more time exploring all the great info and pics. 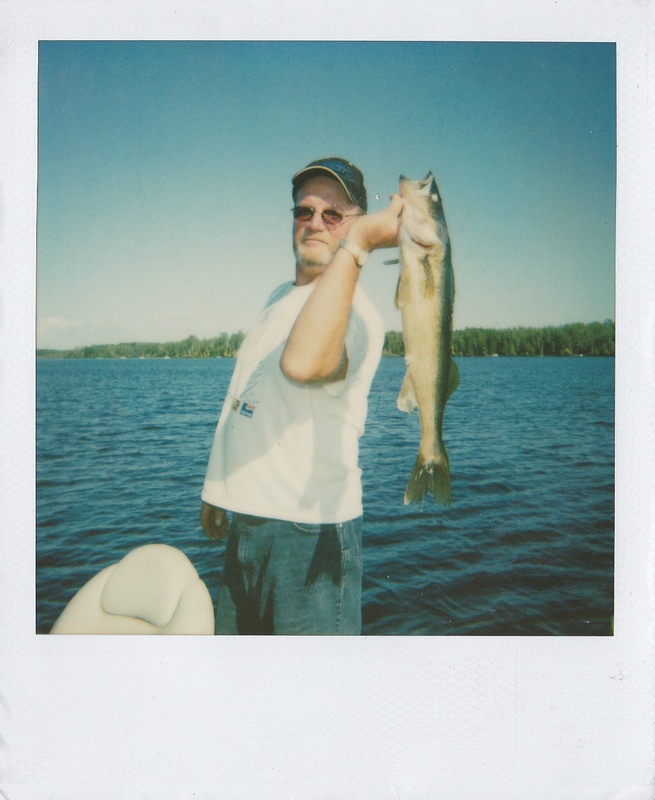 I found it by doing a random search on White Otter Lake – gotta love google. My Dad started going to WO in late 60’s. 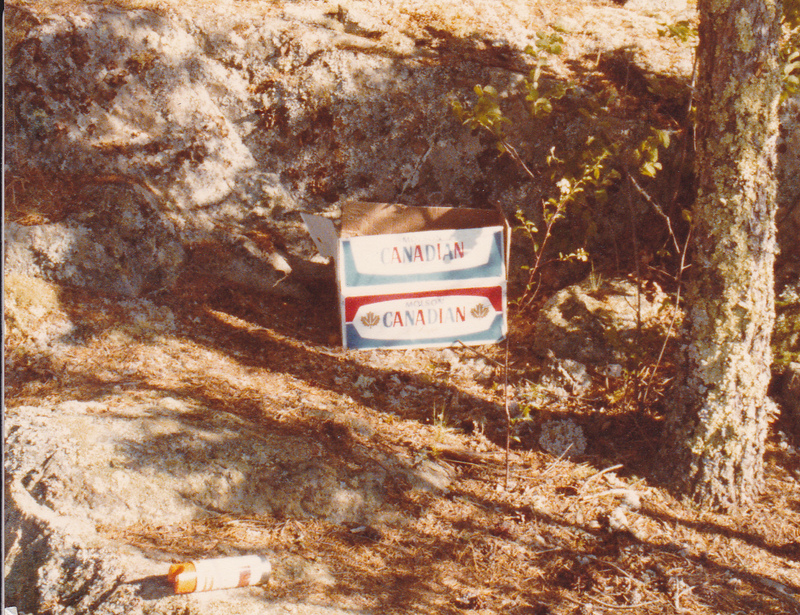 My first trip in early 80’s and been going every year since. For sure one of my favorite places on earth. With no development it has not really changed over time. The drive in is a lot easier than it used to be but there is still a couple miles of the old trail to navigate :-). Anyway, I don’t often cross paths with others who have been there so I wanted to say hi and say thanks for sharing all the info. We camp on an island not far from the castle. 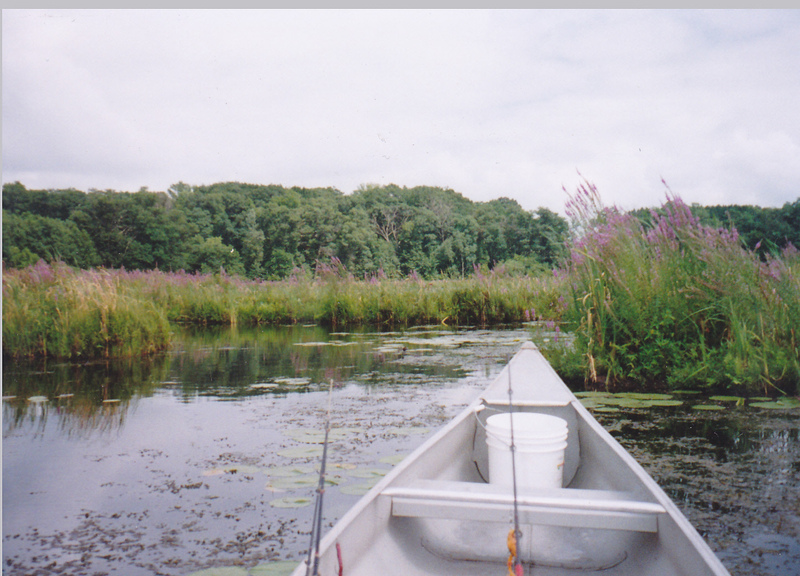 Have been to emery but not fished it, I know its outstanding as my dad used to do it. 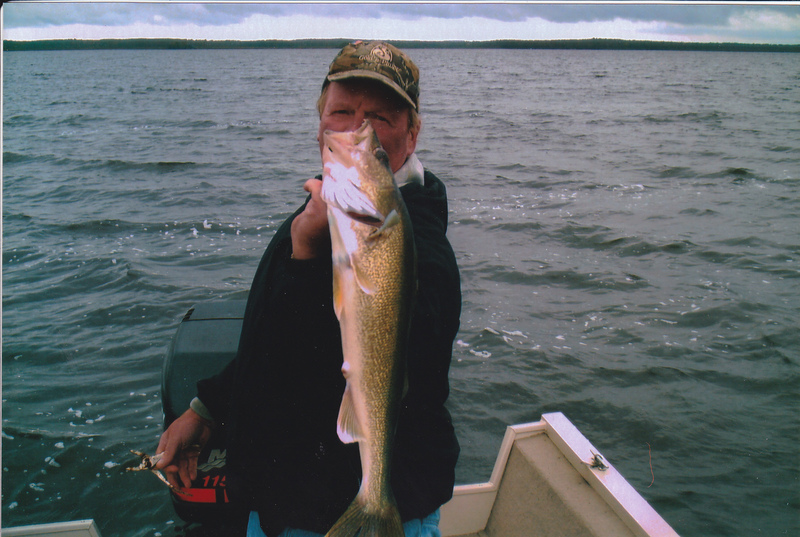 We get em pretty well on WO but mostly fish walleye. It remains great walleye fishing tho the smallmouth have really spread throughout the lake which I think has impacted walleye in some spots. 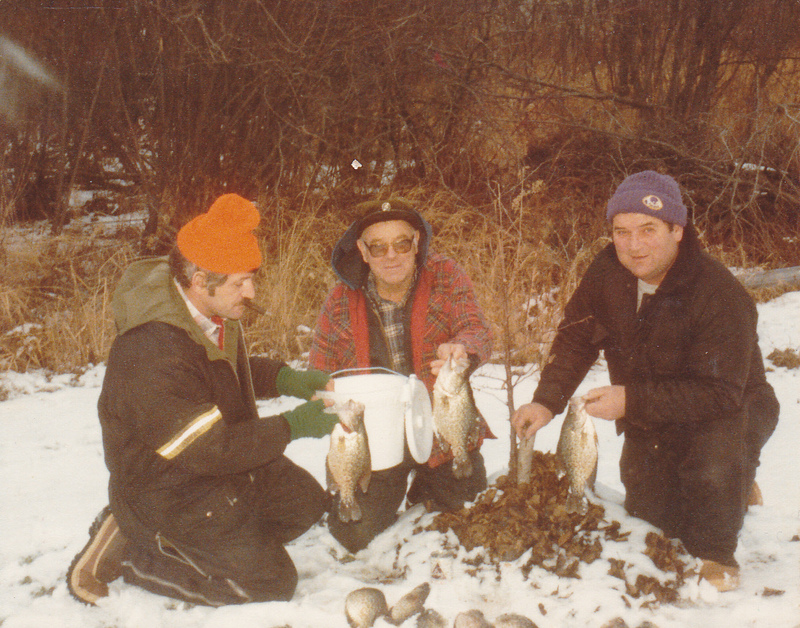 If you have not been there since the 80’s you likely never caught one, used to be you never did. 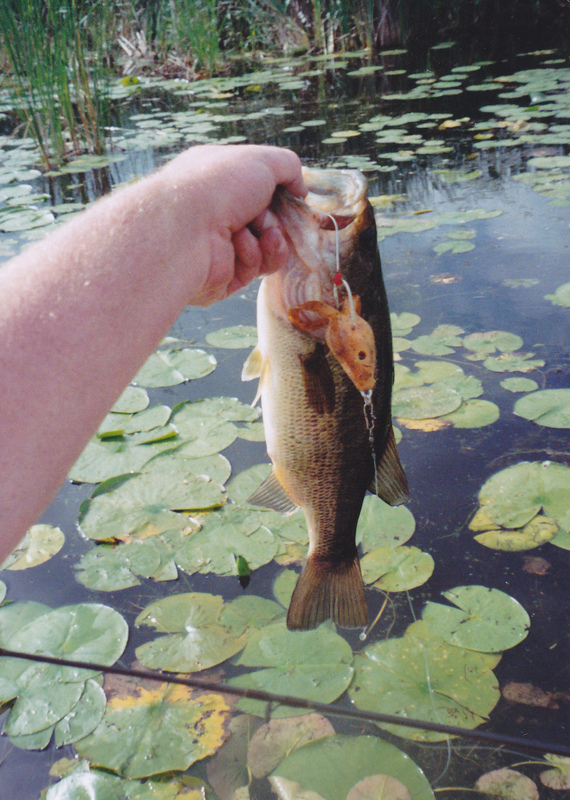 Now if water temps are warm enough you will catch lots, everywhere in the lake. For walleye guys they can get to be a pain. In case you are not aware, Browns now has truck at the portage to haul boats over. Makes that deal a lot easier. Wow! Your site is looking awesome! Keep up the great work! Thanks for everything buddy! I have also been to WO a few times, my favorite place on earth! Beautiful, quiet, and fun! How was opener? My daughter (16) and I headed to Holland lake in eagan and got skunked. Live about 1 hour away in Foley and would love to come out some time you are fishing to learn. I was thinking about fishing for smelt on Sunday. What do you think?